We are now starting the final preparations for our Western US vacation: arrange the Pet Nanny for Sophie (check), ask neighbors to hold our mail and keep an eye on the house (check), collect the suitcases from the attic storage (check), create a blog to share our experiences with family and friends (check). We will drive back through Wyoming (with a stop in Cheyenne) and Denver then home. We hope to post photos and stories every other day or so as time permits. In the first days we will be driving a lot and doing some hiking and sightseeing along the way, so we will try to keep up. We began this day with a hearty breakfast at the inn. They served a traditional continental breakfast. 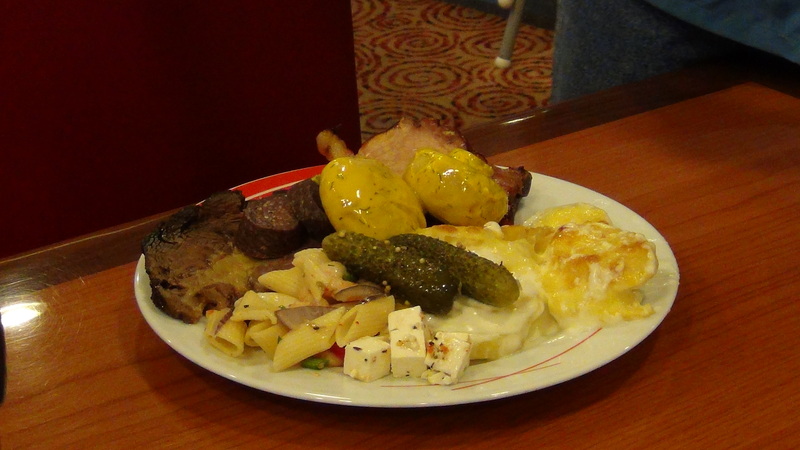 There are almost always soft-boiled eggs served as part of the European continental breakfast. Jennifer likes to butter 2 slices of the inn’s delicious home-baked bread, and then break the soft-boiled egg onto the bread along with a slice of cheese for a morning sandwich. You can take the girl out of America, but you can’t take America out of the girl! After breakfast we paid a visit to the resident goats that were living just outside our rooms. 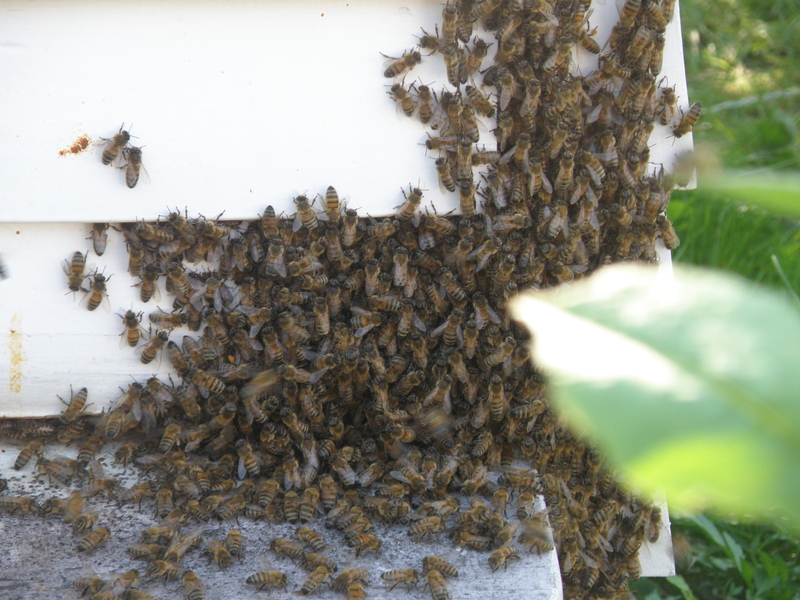 We think Tim was their most frequent visitor. We all packed our respective ‘day bags’, made sure our camera batteries were charged, and set out for the day’s adventure. 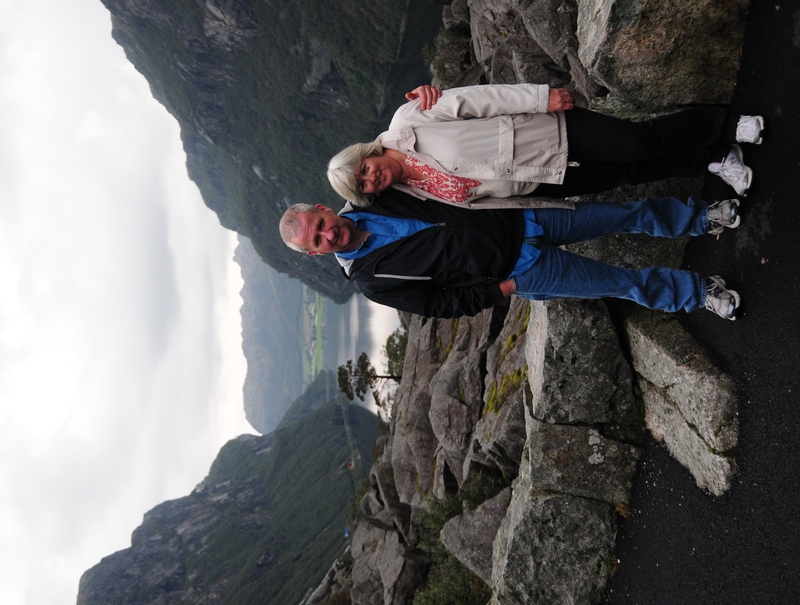 We had reserved tickets for a 10 AM cruise on the Lysefjord from the city of Stavanger, about one hour drive from the inn. …Uh Oh! 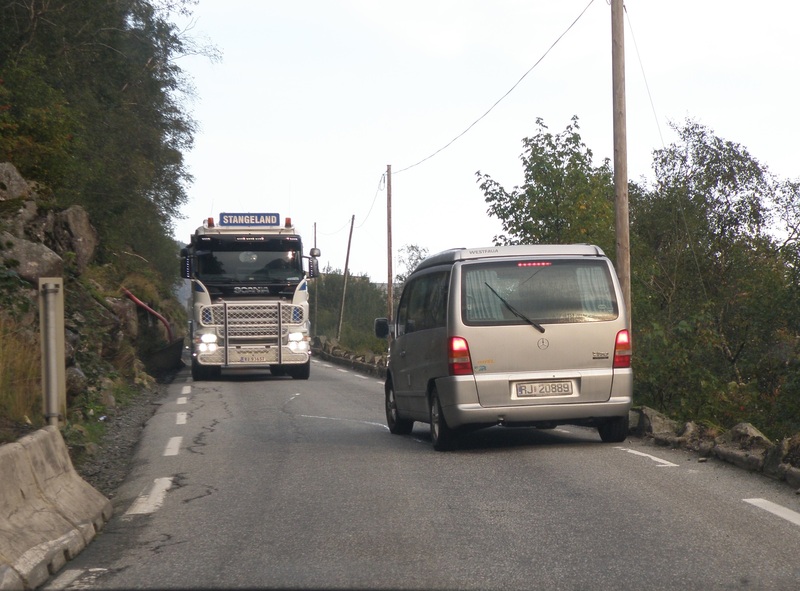 A large transport truck encountered a minivan on the very narrow road. Although it is difficult to tell in the nearer (second) photo, there really was not enough space for the truck to pass. As we were the next car in line behind the minivan, and the traffic jam behind us would not start forming for a few more minutes, Steen backed up (with much encouragement from Jennifer) to a small parking area we had just passed so that we would not be the next “victim” should the truck find a way to pass the minivan. This also allowed the minivan the possibility to back down to us if there was no other way for the truck to get around. Time seemed to stand still while we were holding in the parking area off the road, waiting for the situation to resolve. Meanwhile we enjoyed the lovely scene to our right while the traffic coming behind us now took their place in line behind the minivan. While we were taking in the beautiful landscape the truck somehow managed to pass the minivan, and traffic was once again flowing. After a few minutes we re-claimed a place in the line of traffic, and we were on our way. 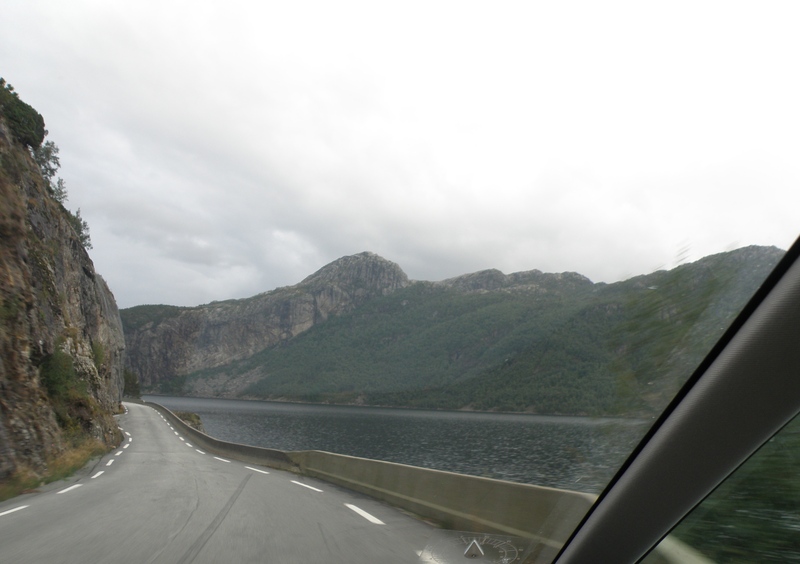 Please enjoy some of the scenes during the continuation of our drive to Stavanger. 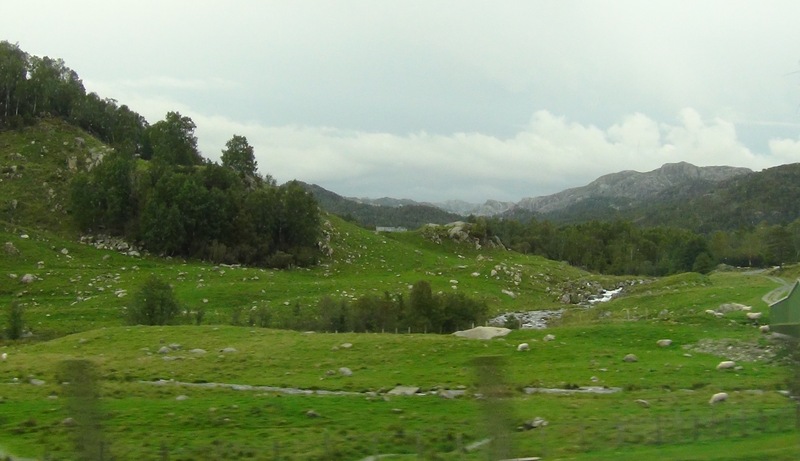 We passed lakes and mountains with fog hanging over them, and green rolling hills with sheep and cows peacefully grazing. 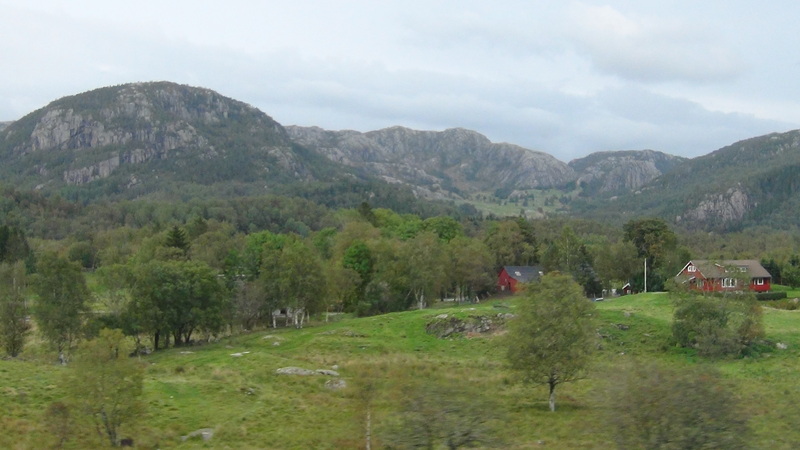 Norway has such a varied landscape, yet portions of it still felt very much like Pennsylvania. 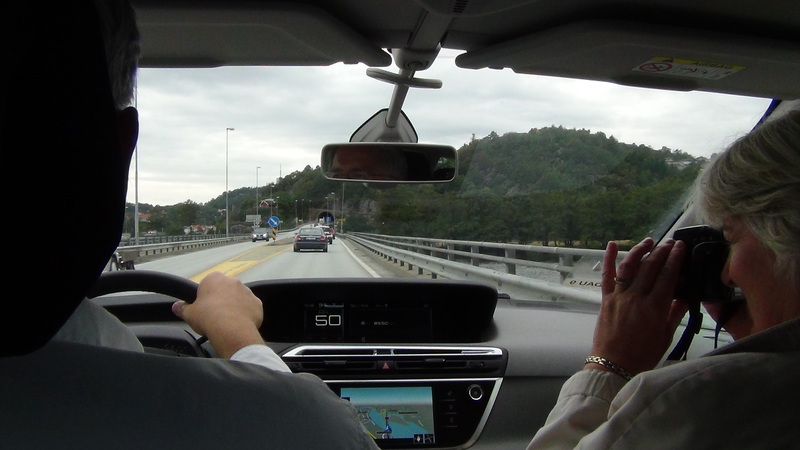 We arrived in Stavanger with what we thought was enough time to park and find the cruise ship because Steen and Jennifer had “been there and done that”. 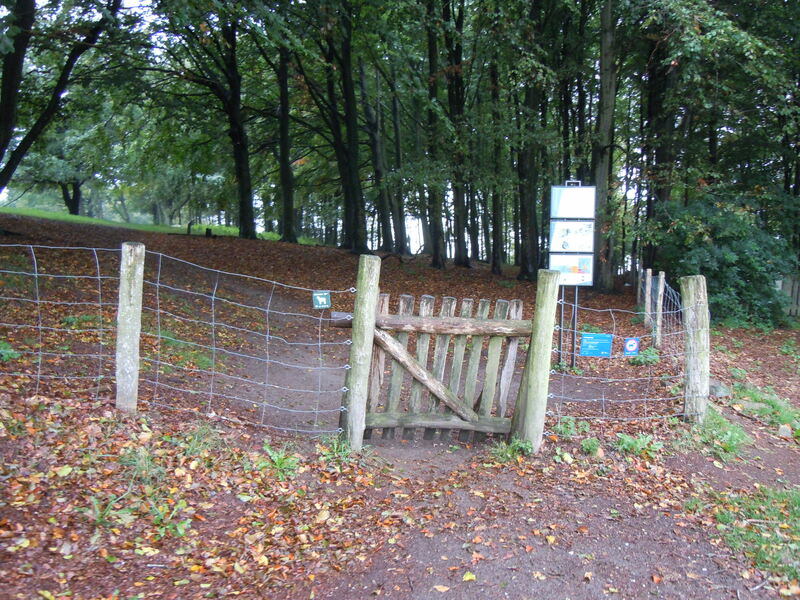 However…it had been a few years since they had been there and the GPS is not always very specific. We ended up very near the water, and found a place to park. Near where we parked there was even a boat from the cruise line that we should take. 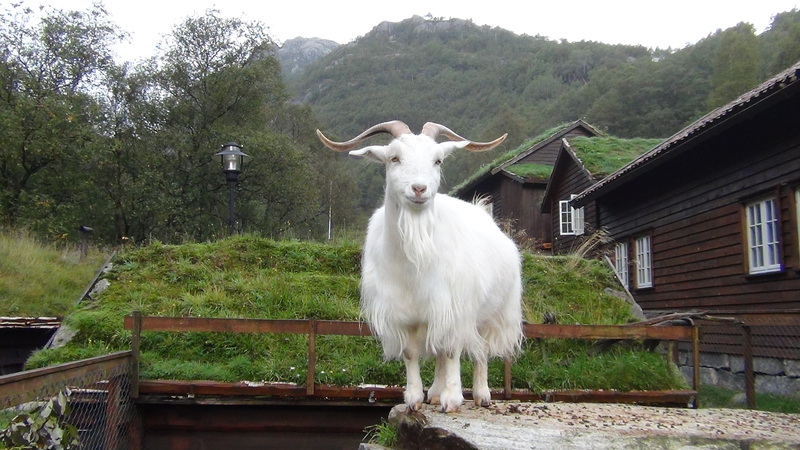 However, when we asked some waiting passengers if this was the right boat for the Lysefjord cruise, they said it was not. We were then directed to an office where we should be able to get information about our boat and where to find it. Now the clock was ticking and time was running very short. The nice lady at the information desk told us that the boat we wanted was leaving from another dock and told us how to get there. We took off as fast as we could manage (which for some of us is not very fast), and we soon saw our boat sailing off. 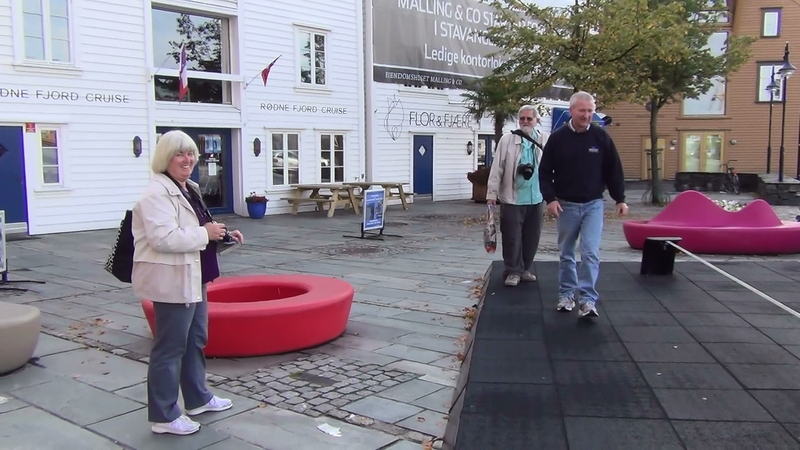 It was already well away from the dock when we saw it, so running was futile (even though we gave it our best shot). We then re-directed ourselves to the office where we could exchange our tickets for the 2 PM cruise, which was no problem at all. But now…what to do to kill time? It only just turned 10 AM. 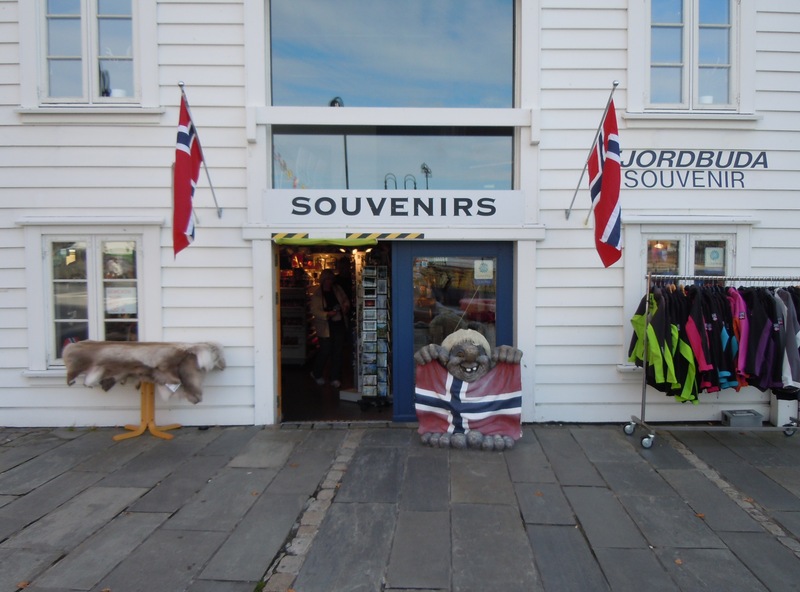 Conveniently located next door to the cruise line office was a Souvenir shop (“Jordbuda” in Norwegian). Tim went in search of a “comfort facility” and found this very nice Burger King. 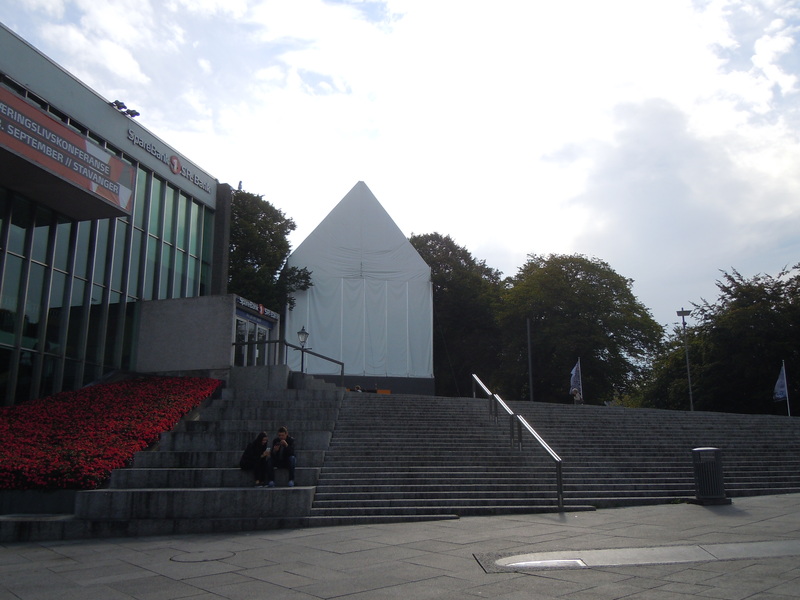 After a short walk along the harbor we arrived at a large, open plaza with Stavanger Cathedral looming over us from the hilltop above. 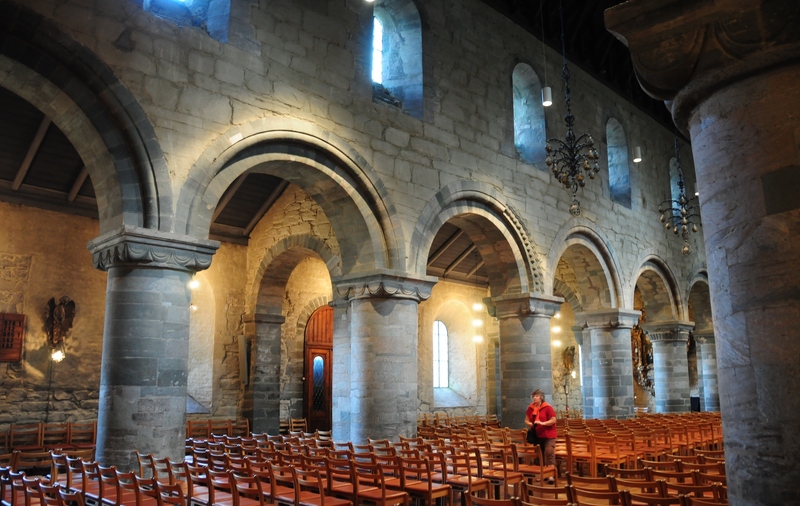 This is the oldest cathedral in Norway, built in the 1100’s. Unfortunately it was covered in plastic this day (for renovations). 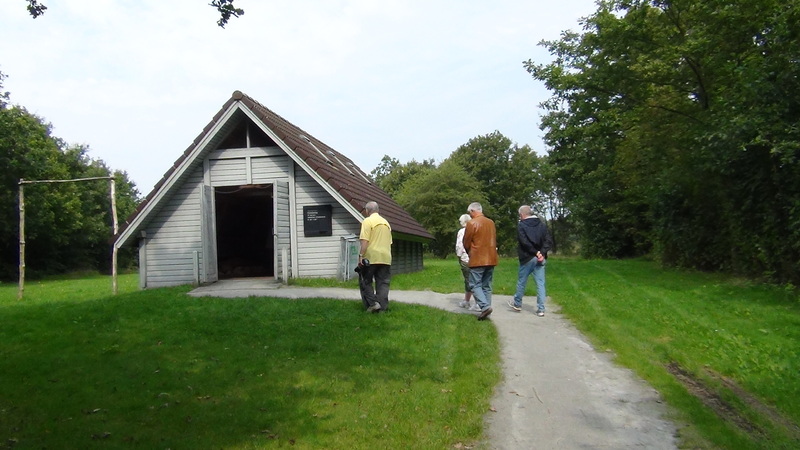 But the door was not covered, and was open, so we ventured inside. The inside of the cathedral was very beautiful. 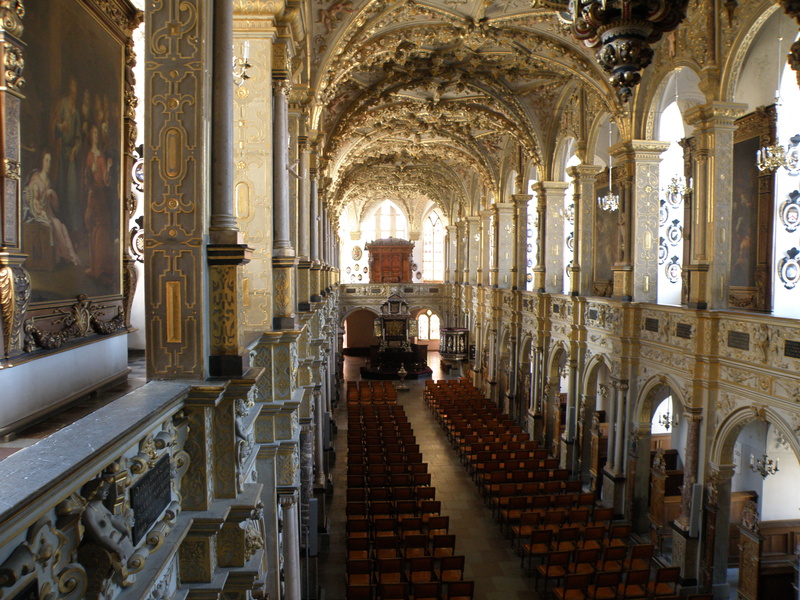 This is the view to the altar, the stained glass behind the altar, and the gallery of the cathedral with striking arches and columns. The top of each column has a different design. There were so many interesting details as we looked around, but we have just started our day and have many more beautiful and interesting things to share with you. 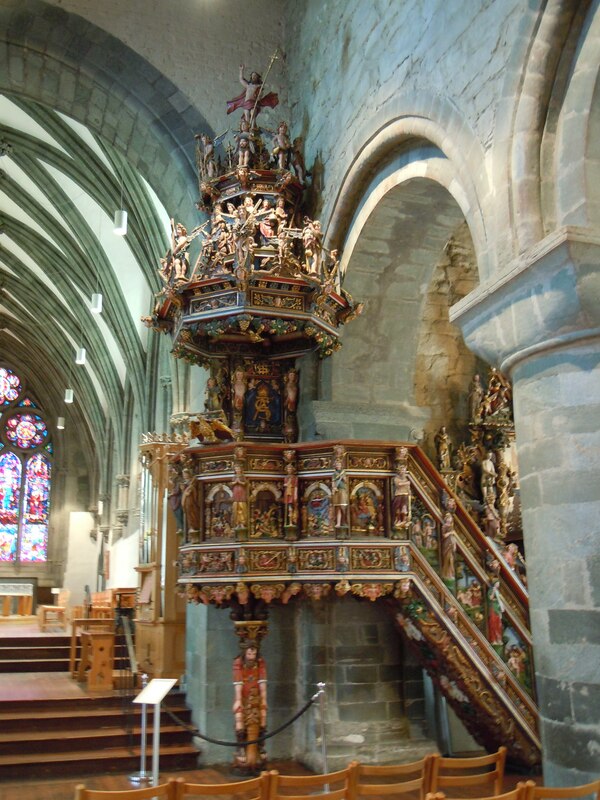 This is the baroque pulpit, built in the mid-1600’s by a Scottish artist. 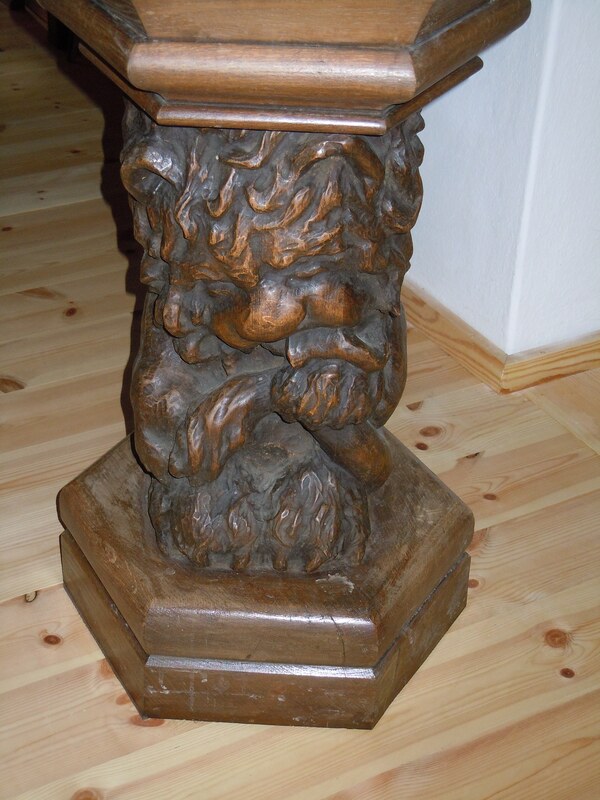 It is considered one of the most significant art works in Norway from the baroque art period. Hercules is at the base holding it up. Across the harbor from the souvenir shop we noticed this cluster of small white houses along the waterfront. 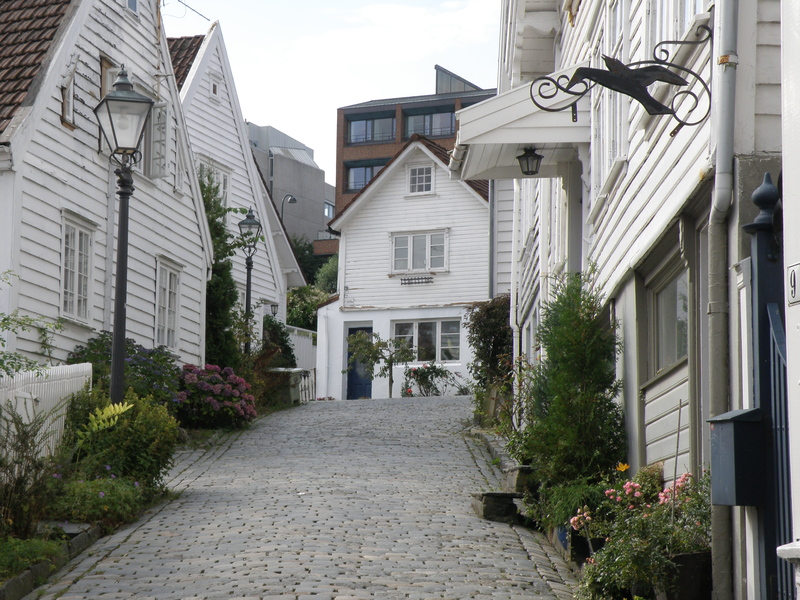 It piqued our curiosity so we checked the tour book and it is Stavanger Old Town (or Gamle Stavanger). 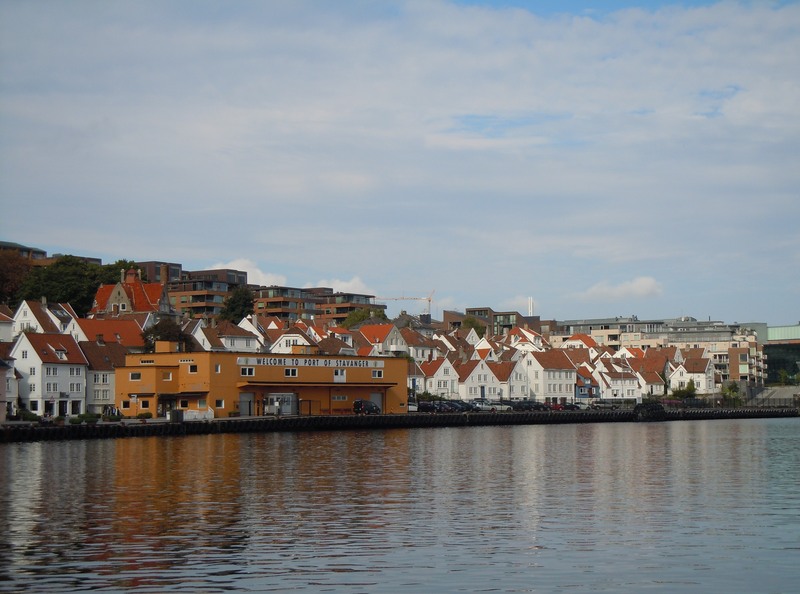 It is a beautiful area of little wooden houses, flower gardens and cobblestone streets along the harbor where the cruise ships moor during the summer. Aside from a few art galleries, the houses are privately owned and the area is almost totally non-commercial. There is a sardine canning museum in the neighborhood, but somehow (fortunately) we missed that. 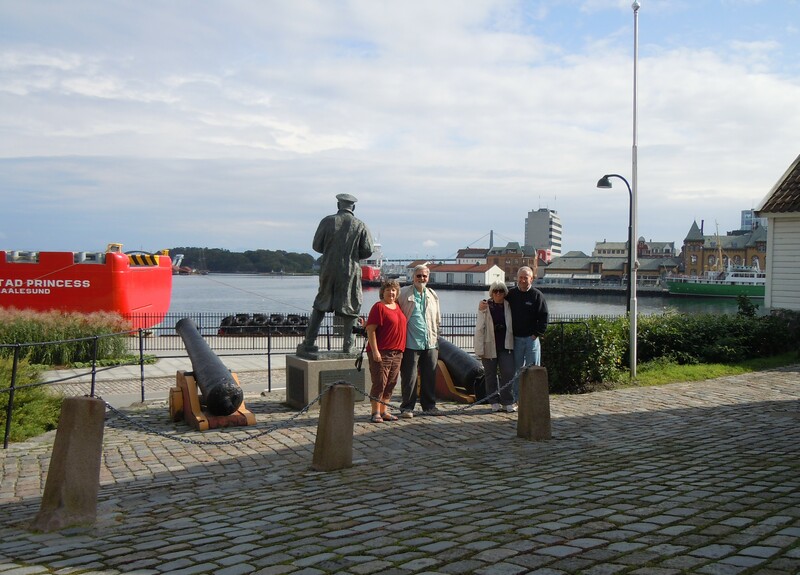 This is the view from Gamle Stavanger across the harbor to the souvenir shop and the Rampline where Tim provided some entertainment after we missed the boat. We either didn’t read, or couldn’t understand, who the statue guy is, but you might recognize the little people standing to his rear. 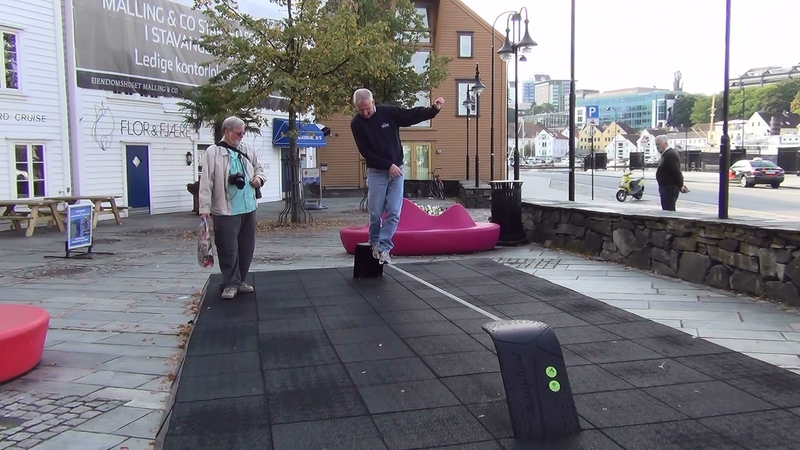 We later found out on google that his name is Thore Horve. He was Commander of a Norwegian ship in World War II that fired on an approaching German ship and basically scared them off. 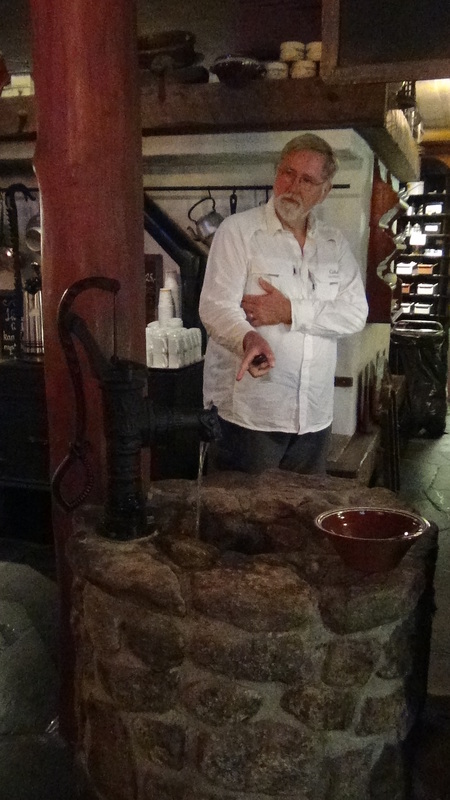 We were all very pleasantly surprised on our unexpected tour of old town. Had we not missed the 10 AM boat, we would not have wandered over here. 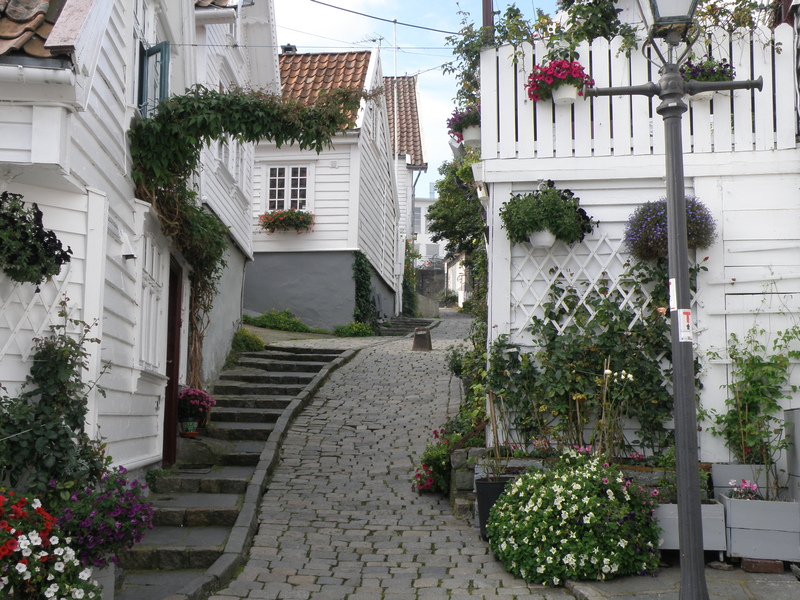 Jennifer and Steen had never visited old town during their previous visits to Stavanger. The common theme was old, white, wooden houses, white picket fences, cobblestone streets and flowers, flowers, and more flowers! It was very charming and we all took a lot of photos. 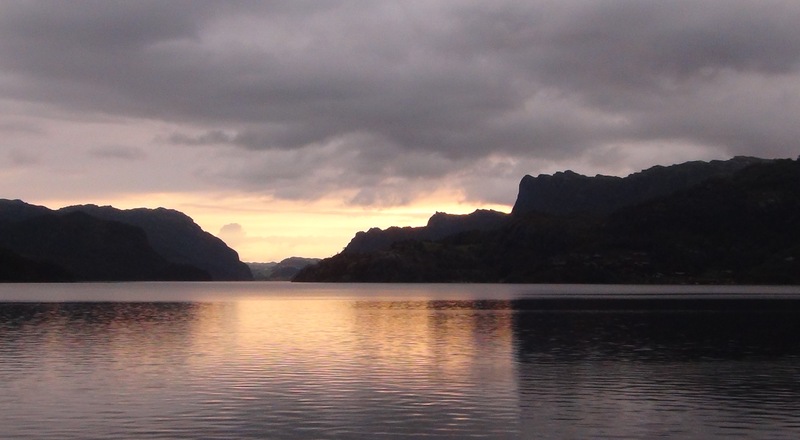 In fact, we took so many in old town that we decided to break this day in half, as the boat cruise into the fjord was also a photographic bonanza. Stay tuned for Part 2. Hi! Sorry for the large gap between blog posts. Life gives us other priorities but it is so much fun to come back to our vacation from time to time. We have a larger than usual amount of photos in this post. 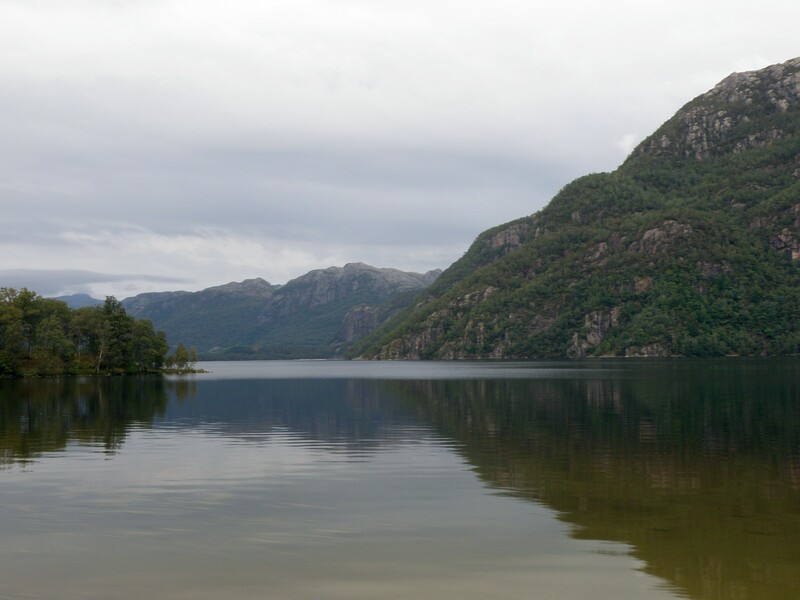 We will describe some of the earlier photos, but after a certain point we will ask you to simply relax and enjoy the scenery of Norway! 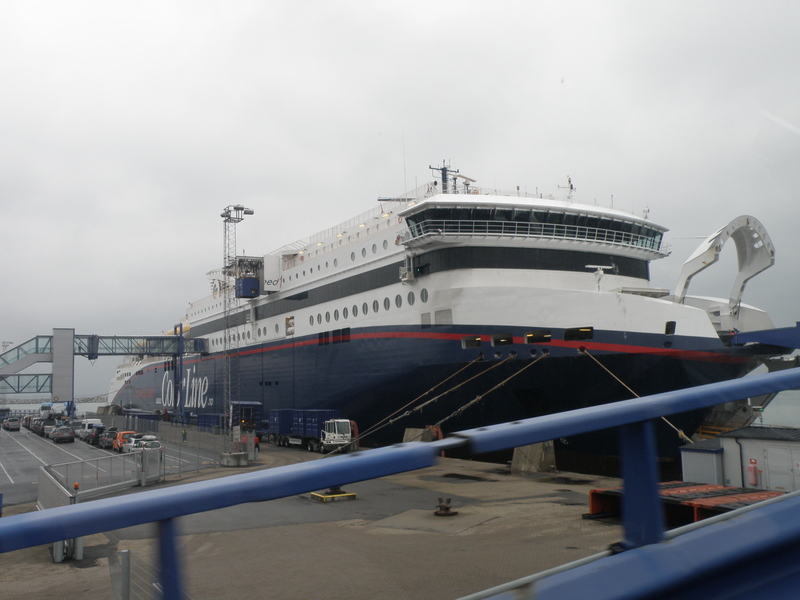 We left Middelfart quite early (after breakfast), as we should be in Hirtshals in northwestern Denmark no later than 11:15 for the ferry to Norway, which leaves at 12:15 PM. 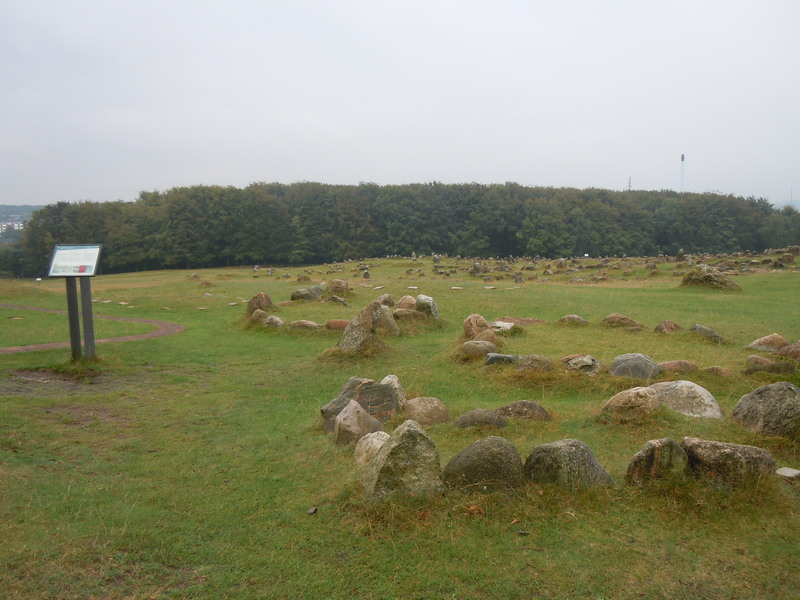 After driving through a light rain for about 2 hours we made a brief stop to Lindholm Høje, a Viking burial site dating, in the oldest parts, to around the 5th century AD. 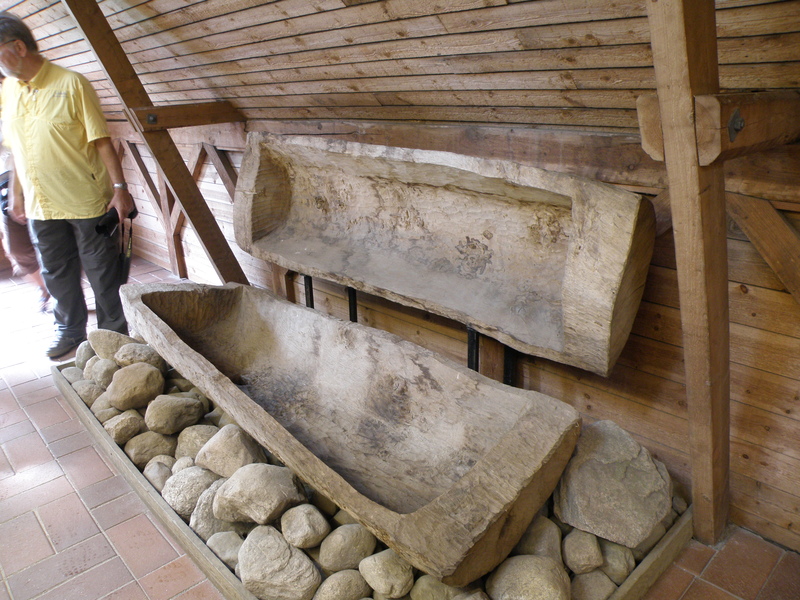 The burial markers were often placed in the shape of a ship and the size of the ship indicated the status of the individual buried there (the higher in importance, the larger the ship). The photo with Steen gives some perspective to the size of these grave sites. 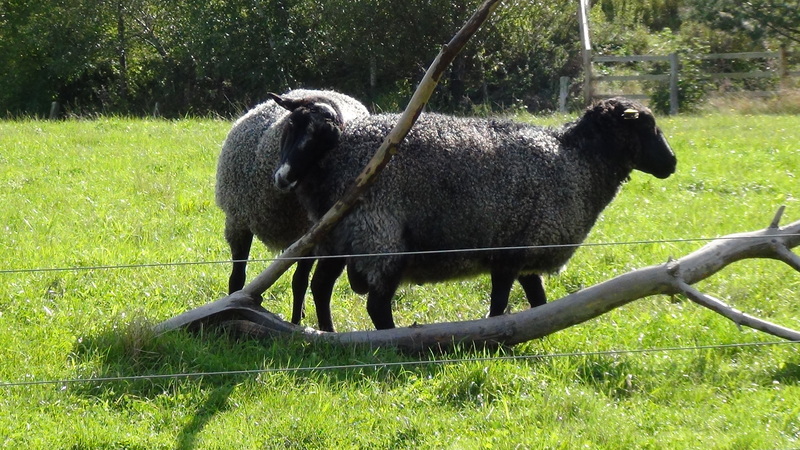 There is a rare breed of sheep (Gotland) that roam around the burial site. 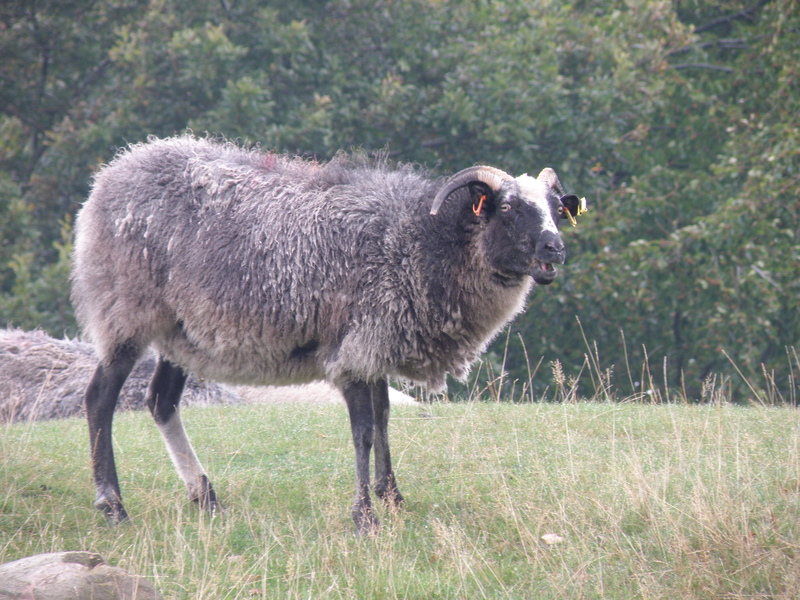 Steen told us how they have a coating of hair over the wool which makes them special. 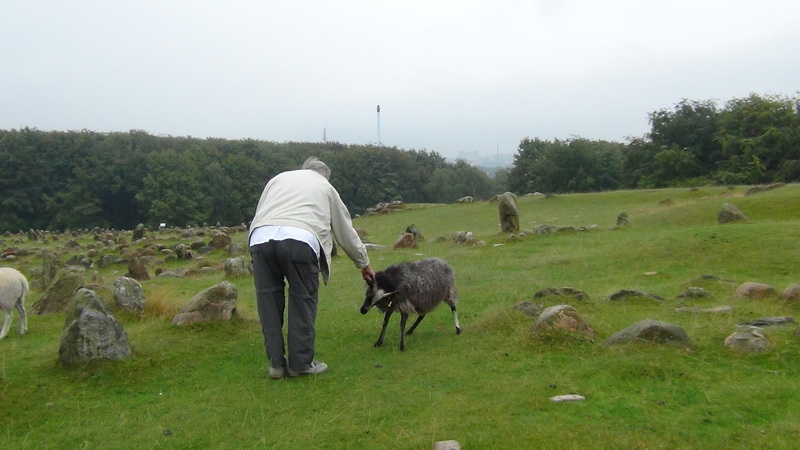 He liked to grab them by the horns, which they didn’t seem to mind too much (Steen did this a couple of times). 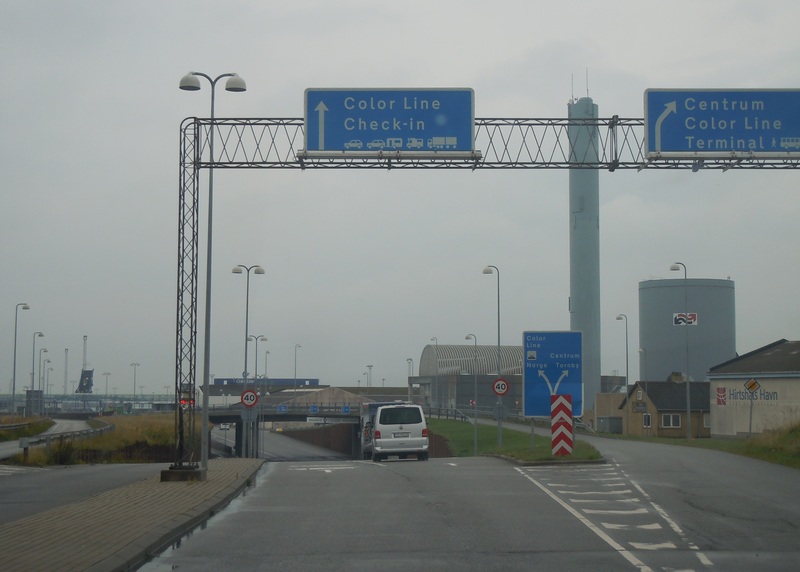 Only about an hour more of driving (in Denmark) and we arrived in plenty of time at the check-in for the Color Line High Speed ferry to Norway. Amy and Tim were rather impressed with its size, as they said it seemed more like a cruise ship. Before long we were directed forward and Steen drove into “the belly of the beast”. We were near the front of the line to board, so we ended up on an elevated deck. 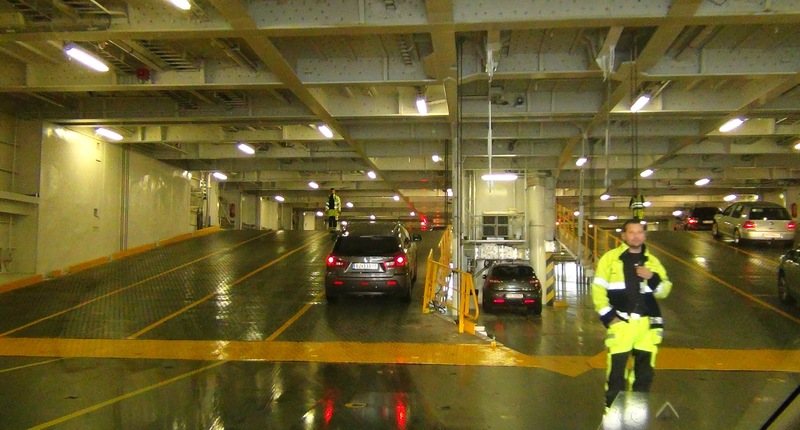 After that deck filled, they would raise it and cars (and all types of vehicles) would park underneath us. 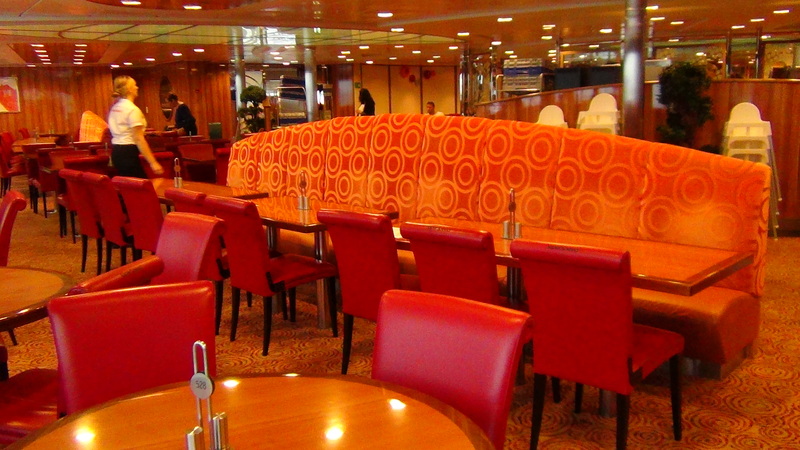 Steen had reserved a table for 4 in the “Catch Me If You Can” lounge. The ticket included the reserved table as well as a huge lunch buffet with complimentary soft drinks, beer and wine which would remain open for most of the 3 hour and 15 minute journey. 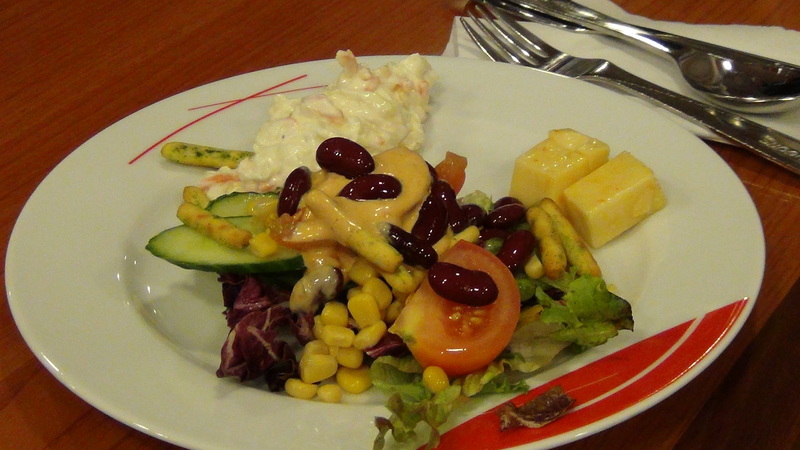 This is a small sample of the delectable items that could be found on the buffet. One entire wall of the buffet was desserts, including a self-serve soft ice cream machine. 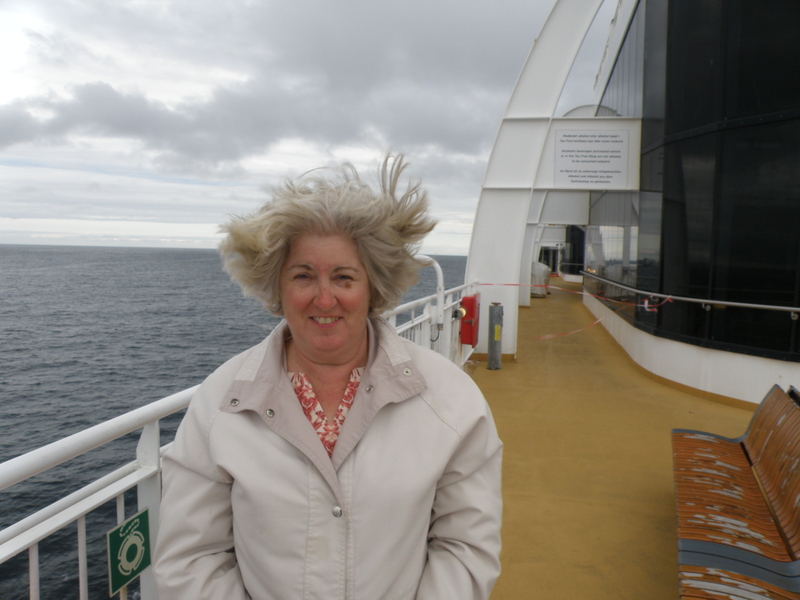 Amy and Tim took a self-guided tour of the ship, and Amy tried on a new hairstyle on the outside deck. 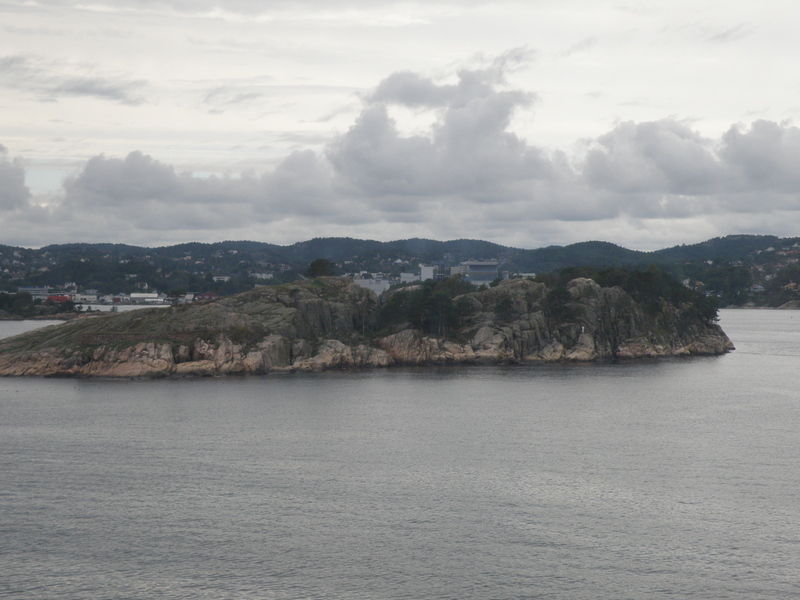 Some of the views as we sailed into Kristiansand, Norway. 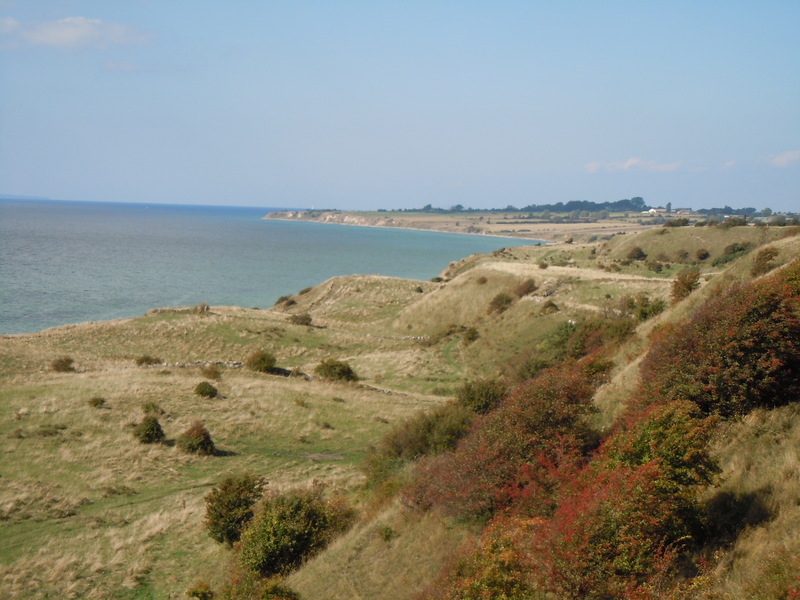 The landscape is so completely different from Denmark, even though it was a relatively short sail across the Skagerrak Sea. 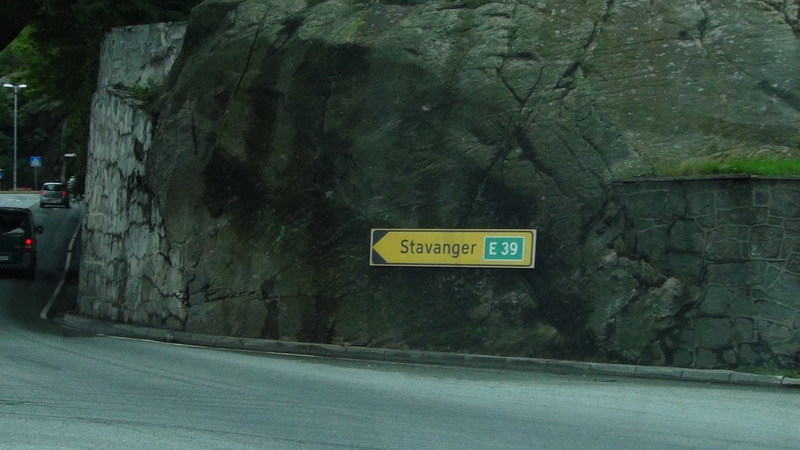 We set the GPS for the town of Stavanger, but also had such helpful road signs to guide the way. Note the huge rock that the sign is hanging on. 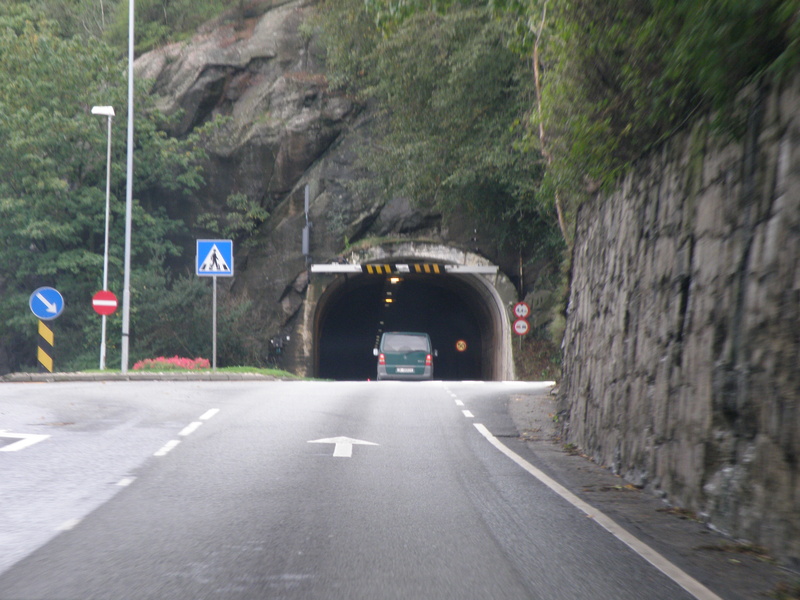 This is the first of many, many (too many to count) tunnels that we encountered during our few days in Norway. 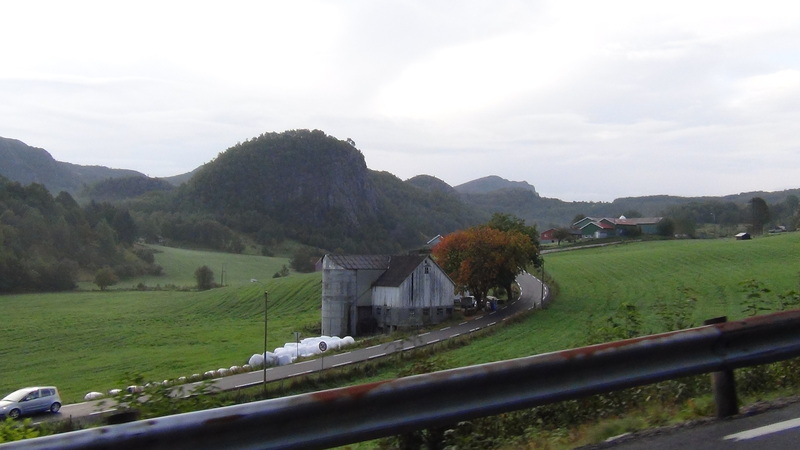 As we approach another tunnel (we probably already lost count by this time), you can see that while the tunnels are a novelty, the countryside was also something worth photographing. 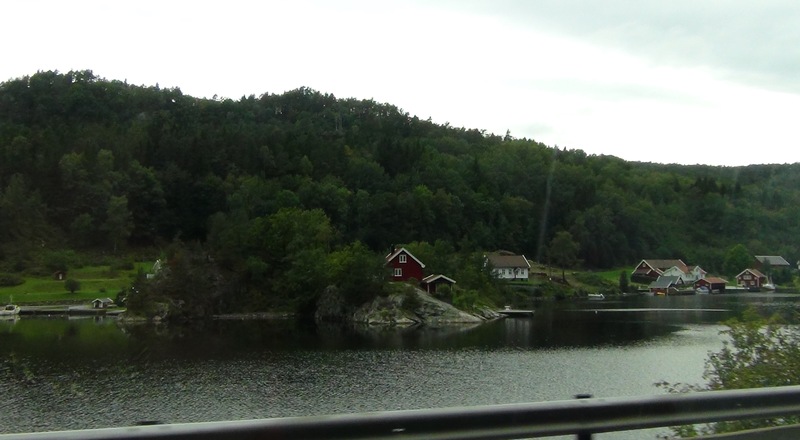 We did not need to drive for very long outside of Kristiansand before coming to such idyllic scenes, of clear, clean lakes, fjords and colorful wooden houses and boat houses dotting the lake edge. 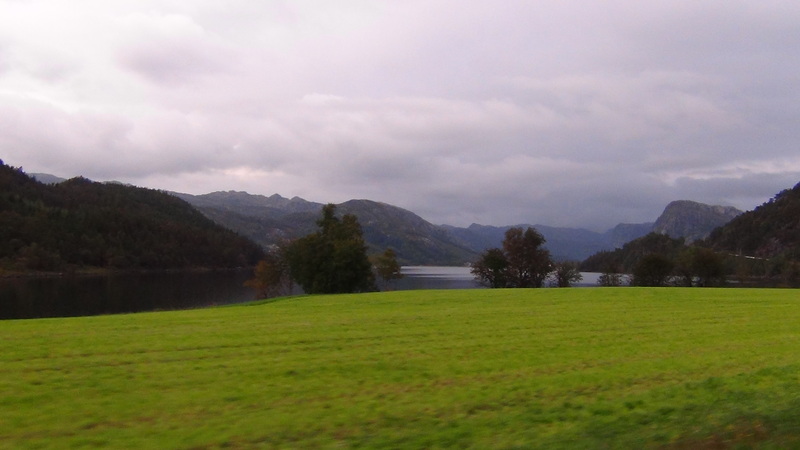 One of the first really dramatic views on the drive was at Flekkefjord. 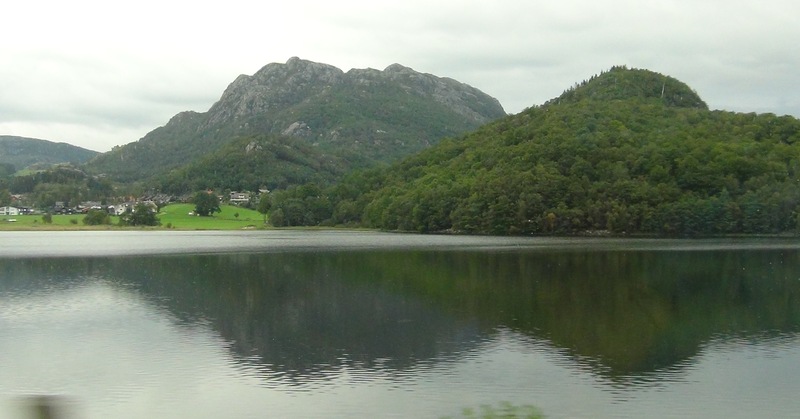 This is around the halfway point between Kristiansand and Stavanger. 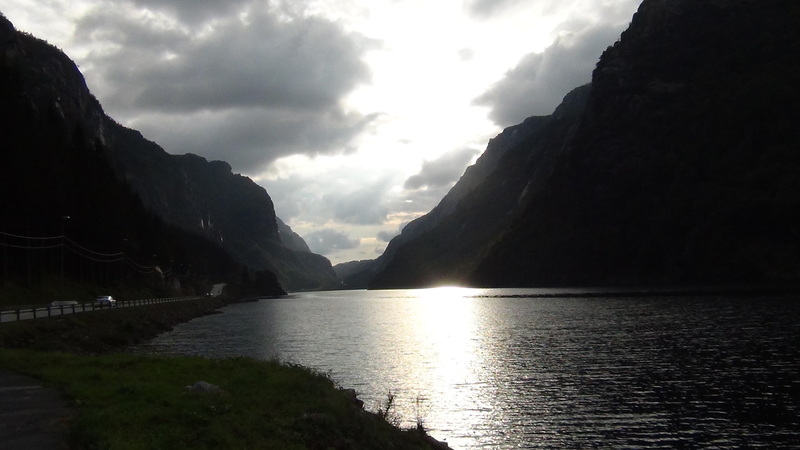 Eventually, after more tunnels, more water and beautiful scenery, we made another short roadside stop at a gorgeous place which, unfortunately, bears a tragic story. In 1924 there was a bad drowning accident here when 6 youngsters drowned on their way to a local dance. Their boat capsized and all drowned. There is a memorial here that shows a picture of the funeral procession of several of the small caskets. 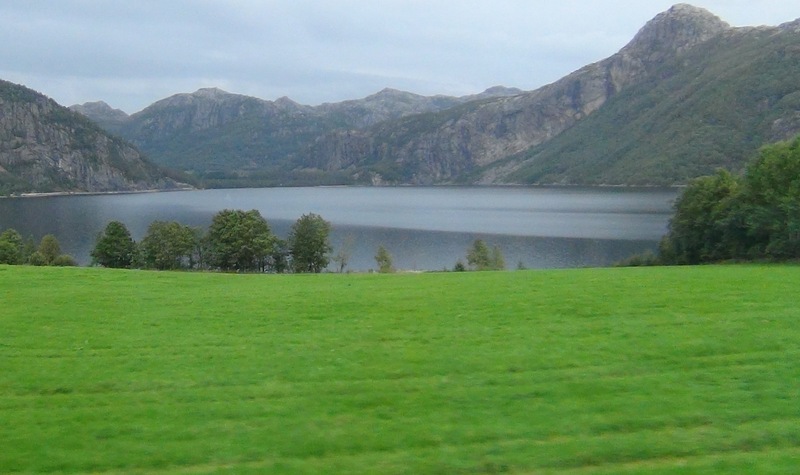 Now just sit back, relax, and enjoy the scenery as we drove toward our final destination. 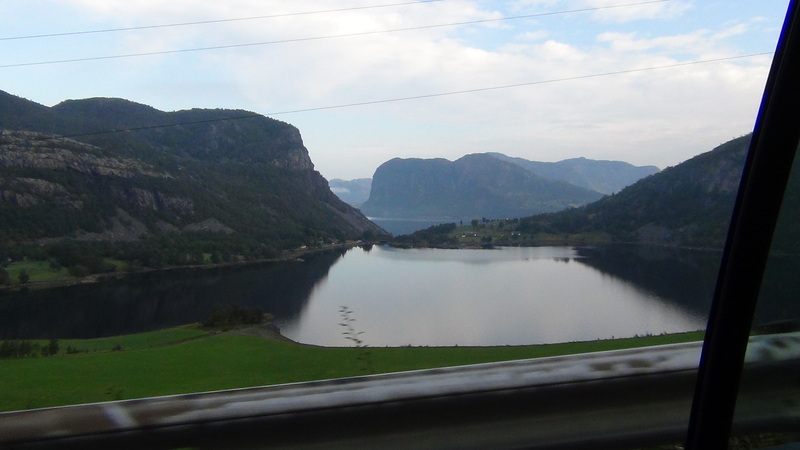 So many beautiful scenes as we drove and drove, getting even more spectacular as we went along. 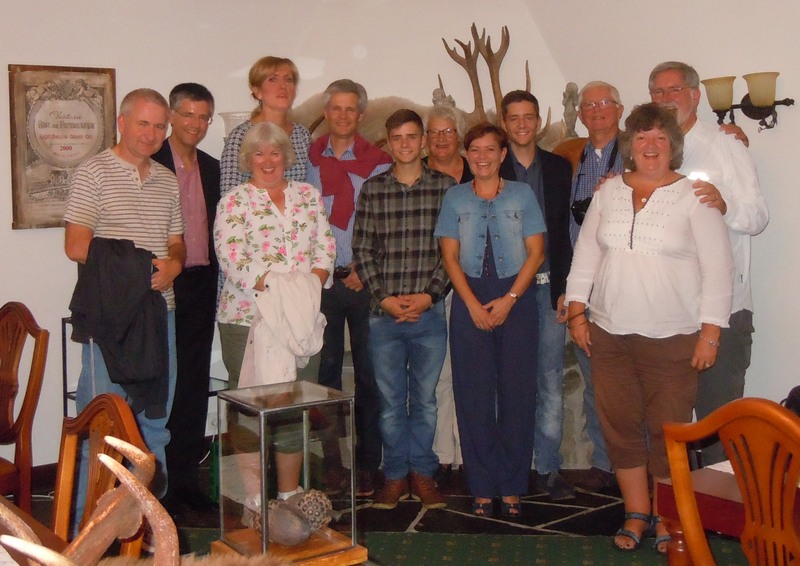 Towns were few and far between, and we took advantage of the services they provided. 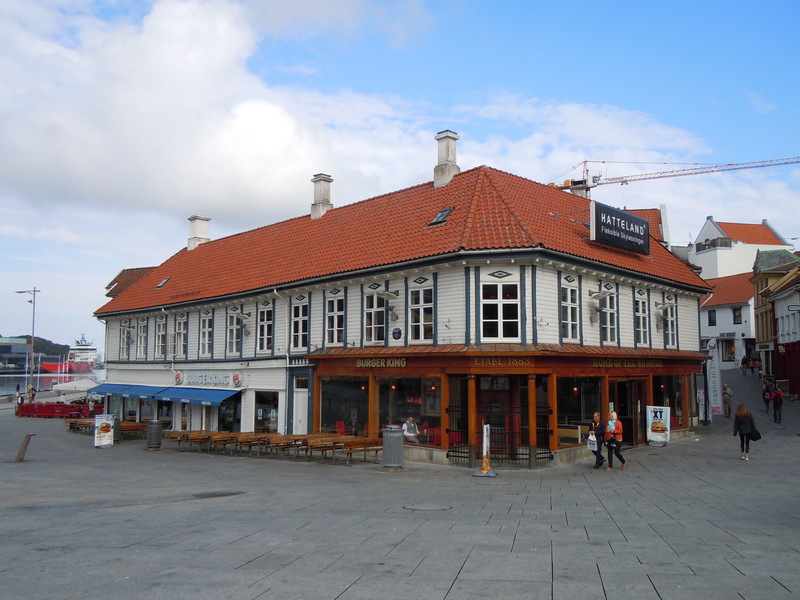 We were asked by the inn where we will stay in Norway to call when we arrived in Kristiansand, so they could tell us whether the kitchen would still be open when we arrive (or not). We called and called during the drive, but no one answered and there was no possibility to leave a message. During one of our stops we bought some sandwiches so we would have something just in case. Eventually we came to a town where we turned off of the main highway. This is the final stretch to our destination. The road is really made for a single car, but every so often there is a bit extra for a turnoff for one or the other cars to make room in order to pass the other (you can see this on the second photo, just after the near miss with the car in the first photo). 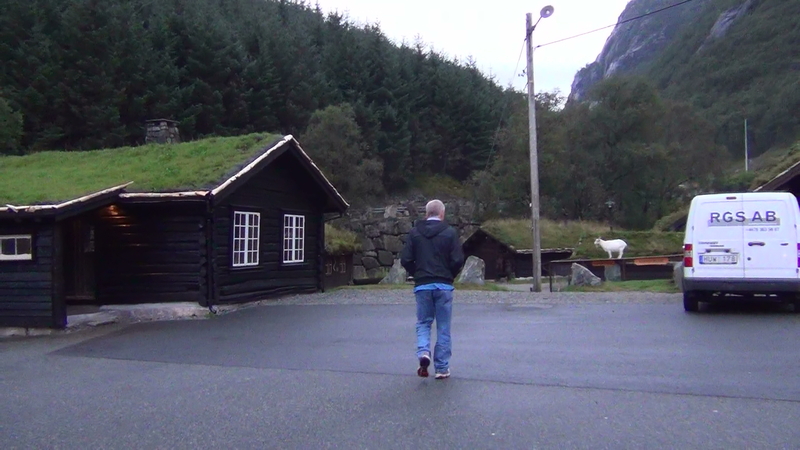 Although it was tempting to keep all of our 8 eyes peeled to the road to help Steen watch for oncoming cars (and sheep? 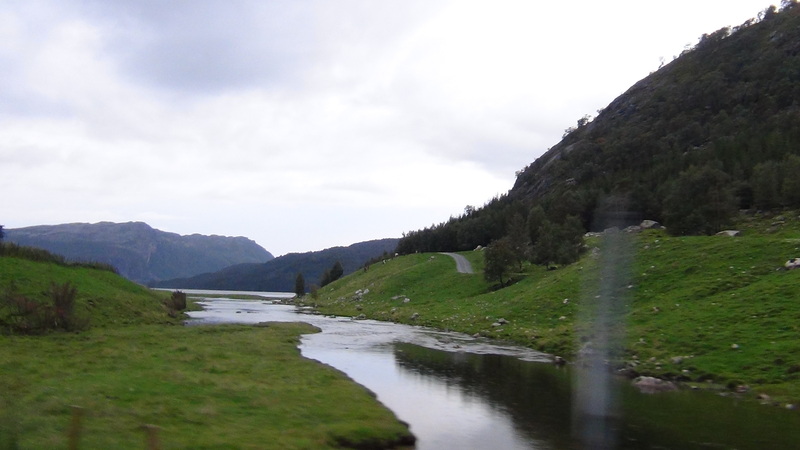 ), we could not forget to take in the amazing landscape we were driving through. This is looking back the way we had just driven. To the other side, Mother Nature at her finest. 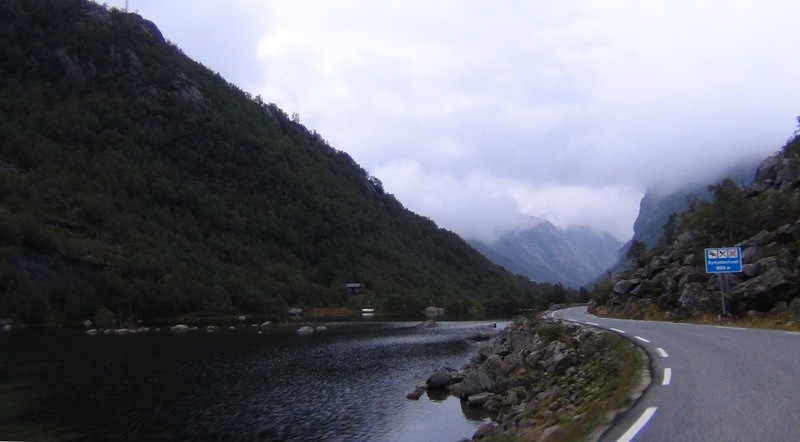 Enjoy more of the drive, as we saw it. Soon we were climbing away from the water and high into the clouds. At the peak of the mountain we arrived at an otherworldly place called Gloppedalsura. 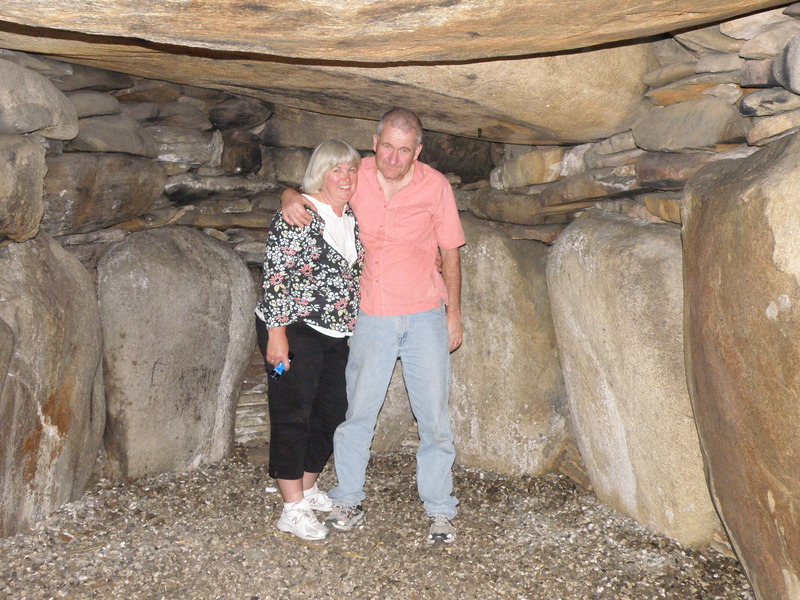 The area is unique due to the giant boulders that were left behind from an ice sheet that melted 10,000 years ago. 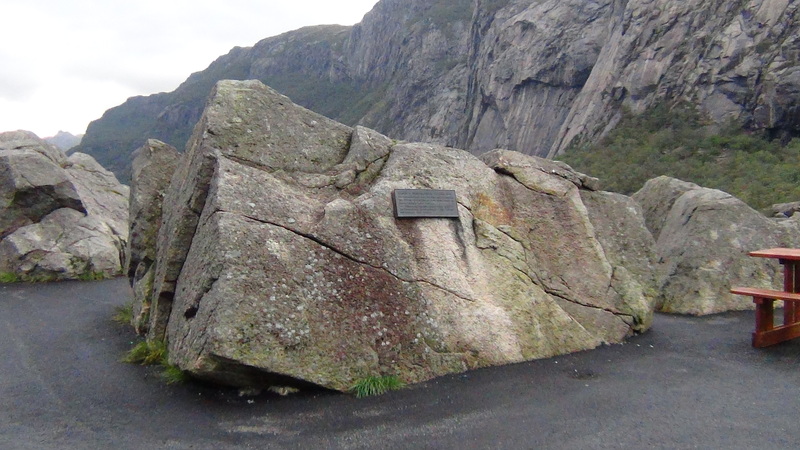 But an important battle also took place here in WWII between the Germans and the Norwegian soldiers who were using the huge boulders as a stronghold for their forces. 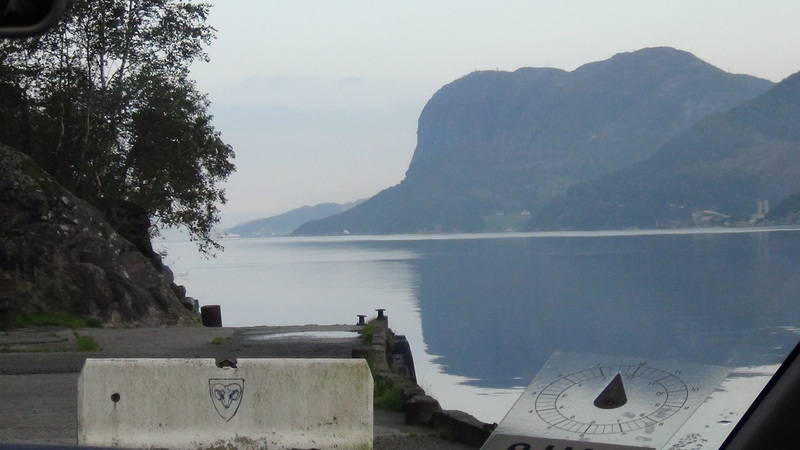 During the night of 22 Apr 1940 the Germans launched an air attack which disrupted the Norwegian supplies. 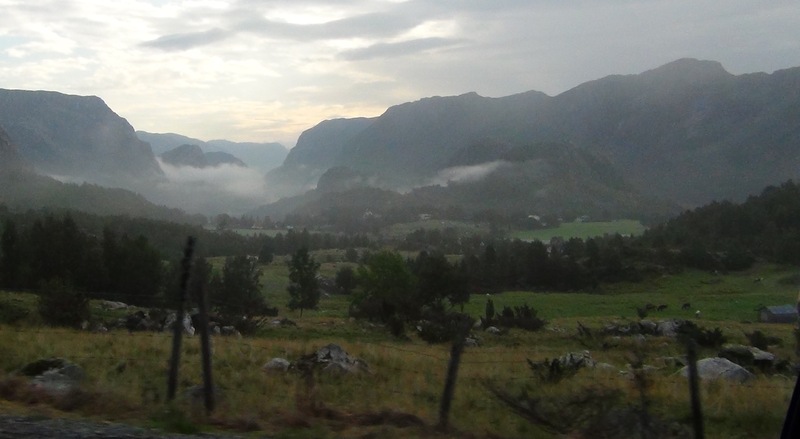 Then the Germans sneaked down the mountainside and surprised the Norwegians, who ultimately gave up, despite the Germans suffering some heavy losses. 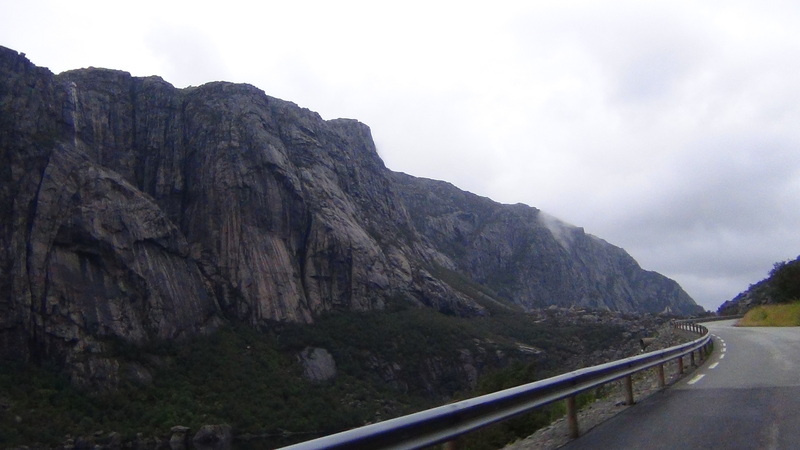 The view from here, looking back to where we had driven from, was just stunning. We each took photos of the other couple with this postcard view as backdrop. 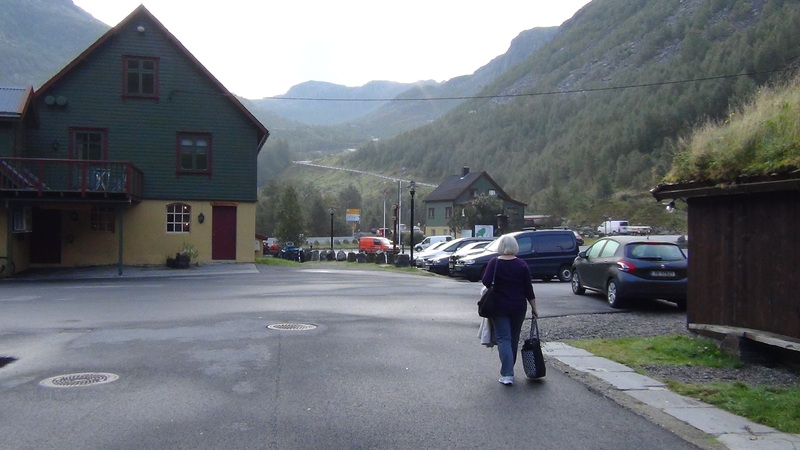 The drive was all downhill from there until we finally saw the sign for the Byrkjedalstunet, which is the very traditional Norwegian inn where we will stay for a couple of nights. 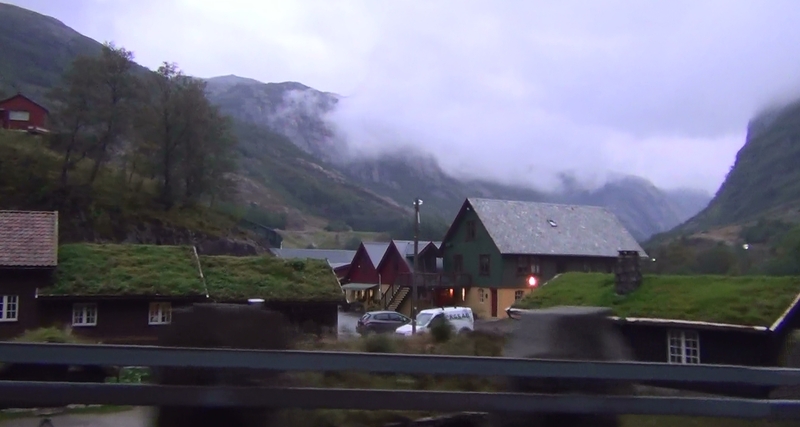 Although the drive was amazing, it was a very long day and we were all tired and ready to get to the inn. 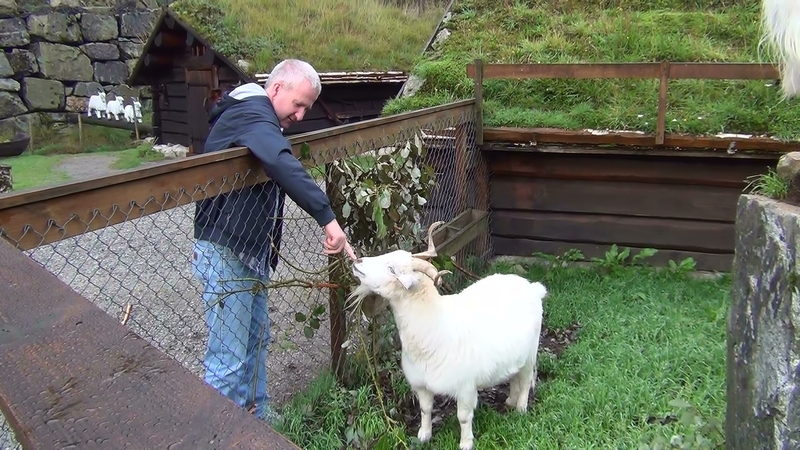 …Tim wanted to meet the goats who live in an enclosure right outside what would be our rooms. 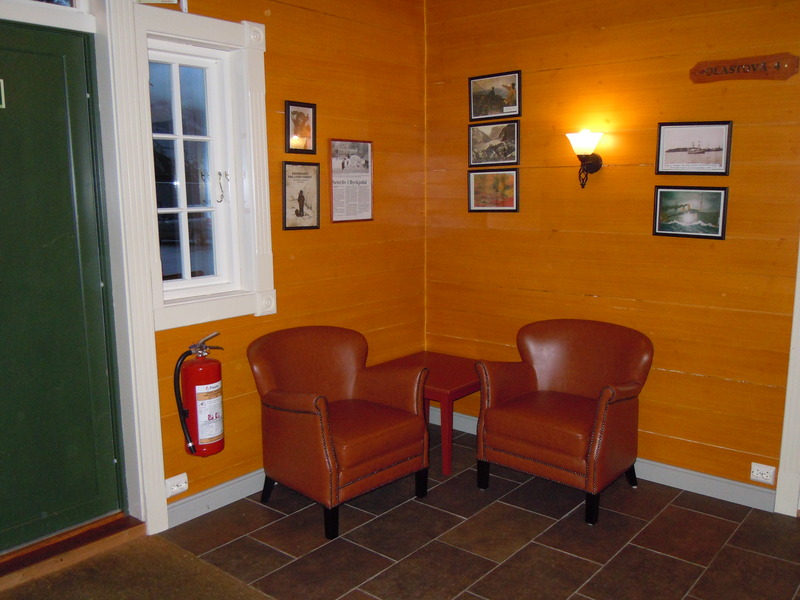 The inn consists of a main building where Reception and the Restaurant are located. Just next door is a huge shop where they make their own candles, and sell other Norwegian crafts (we’ll shop tomorrow or next day). 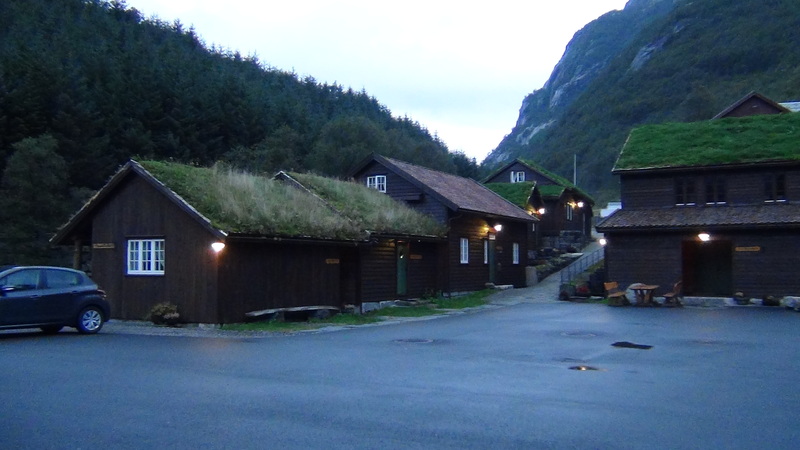 The rooms are in the small houses with the grass rooftops. 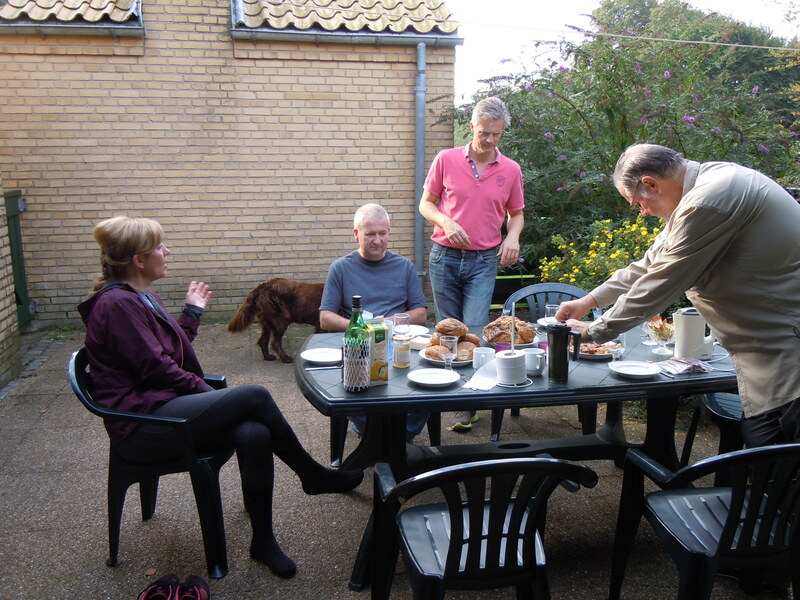 Before parting from the family last evening, Berit and Lars made an offer to stop by our feriebyen with some Danish specialties, such as “rundstykker” (round breakfast breads), “tebirkes” (a flaky and not too sweet puff pastry-like dough with poppy seeds on top) and “brunsviger” (a sweet pastry which is a specialty from the island of Funen, with baked brown sugar and butter on top of sweet yeast dough). They had walked here from their home and brought their dog Teddy-Bob and the neighbor’s dog “JuJu” (pronounced “Yuyu” but not really sure of the spelling). The dogs enjoyed some water while we all enjoyed these delectable treats on our terrace. 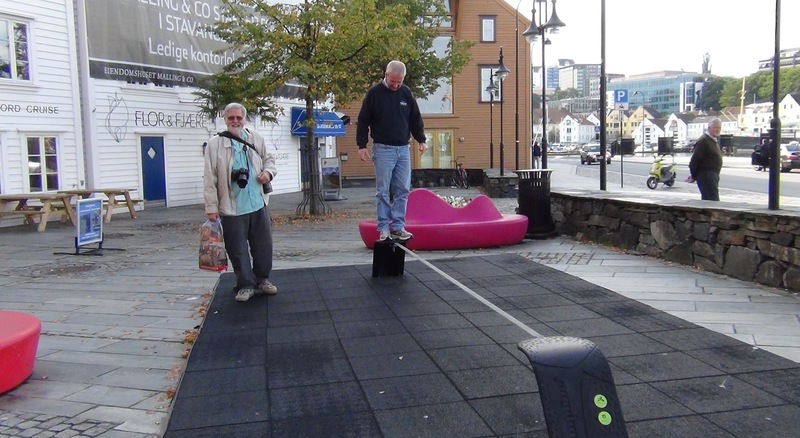 We once again did not spend a long time together, as Berit and Lars would continue on their run / walk with the dogs, and the ‘tourists’ had a big day planned. 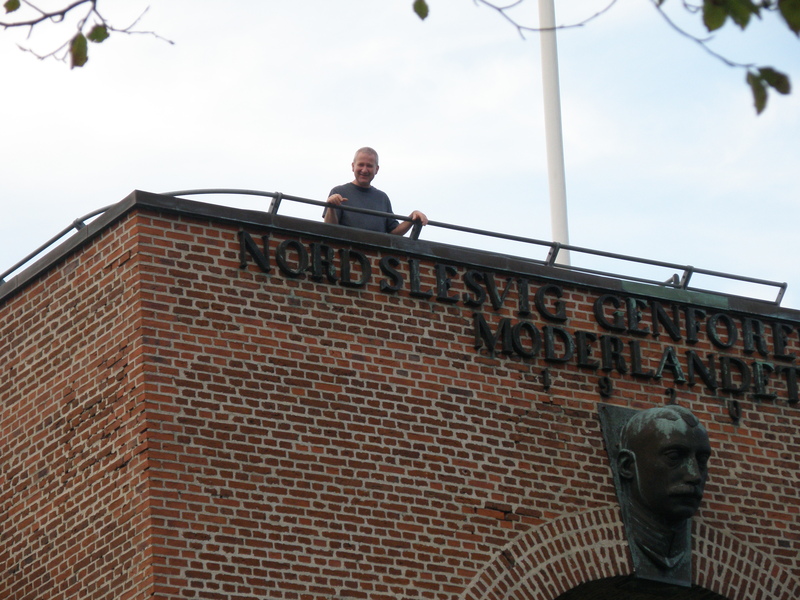 After about 45 minutes of driving we arrived in Aarhus, known as one of the happiest places on earth. Berit works here, so that surely contributes to that status (we love you Berit!). 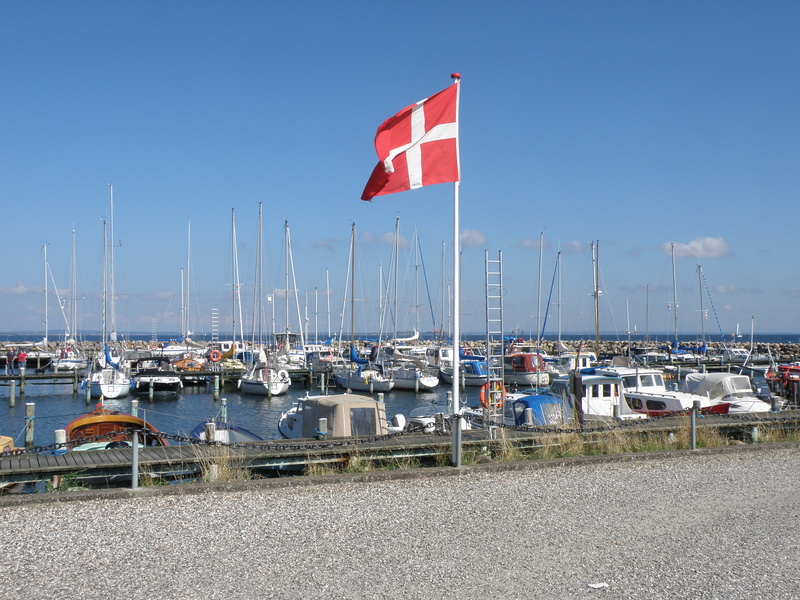 Aarhus is the second largest city in Denmark and one of the oldest (from late 900s). The city itself is much like any other city but with a “small town” feeling. 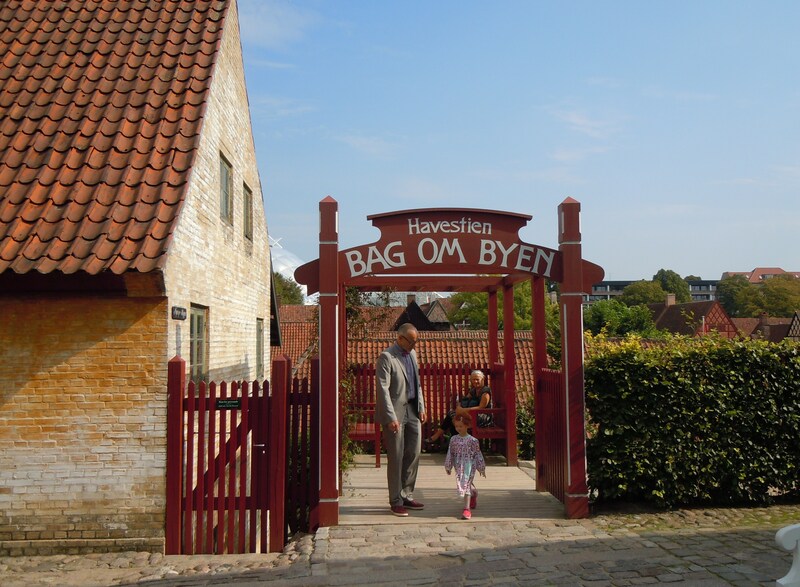 Our main attraction today was the old town (“Den Gamle By”) which is a recreation of a town from the time of Hans Christian Andersen. 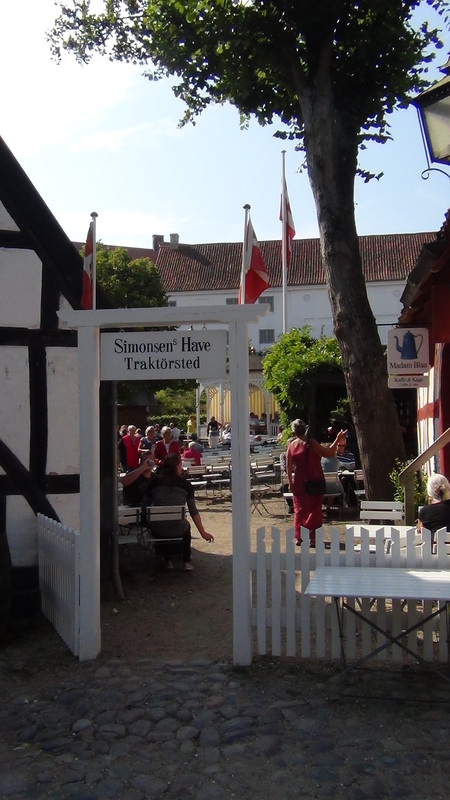 He lived from 1805 to 1875, however some of the homes in the old town date back to the 1700s. 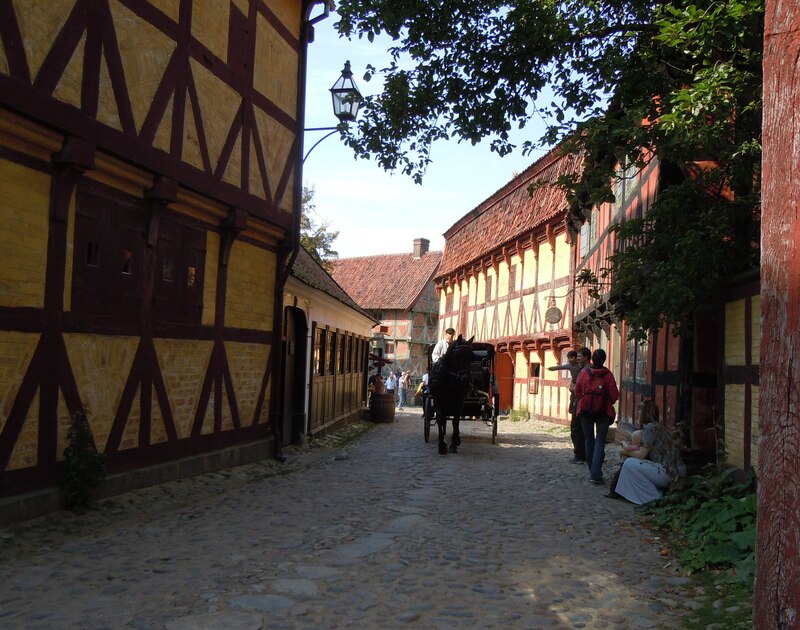 The old town is located in the center of Aarhus and is made up of about 75 actual homes from different time periods that were taken apart and then reconstructed on this site as one of the world’s first open-air museums. We entered the old town through this arch which translates to “garden path behind the town”. 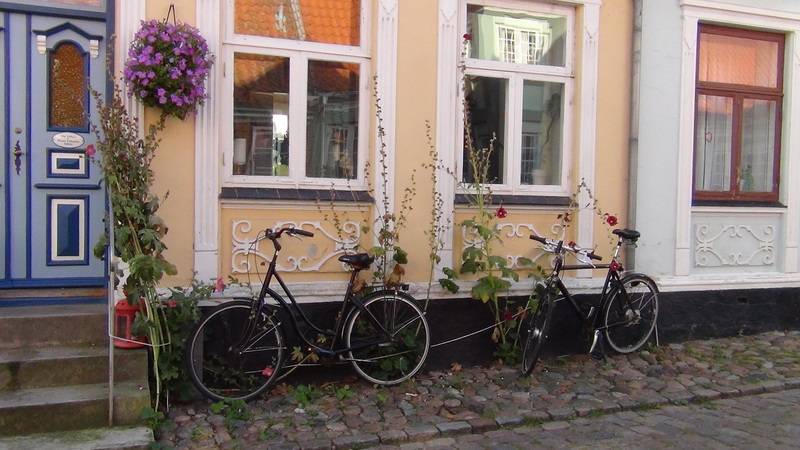 There are several gardens in the old town. 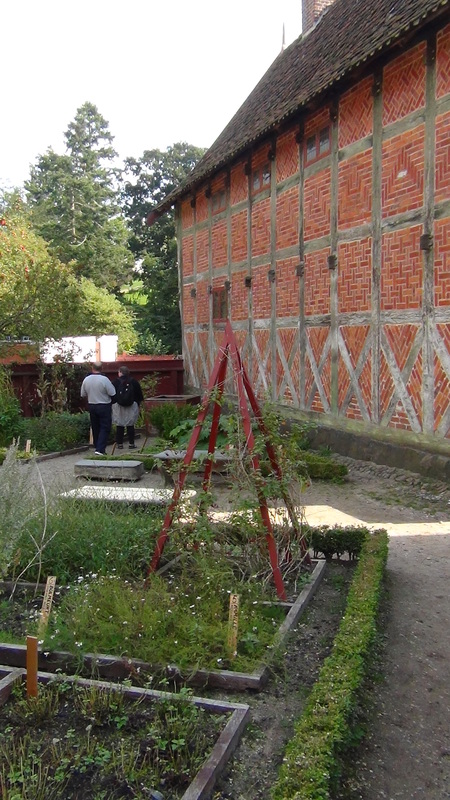 This one is the pharmacy garden with herbs, flowers, and berries having medicinal uses. 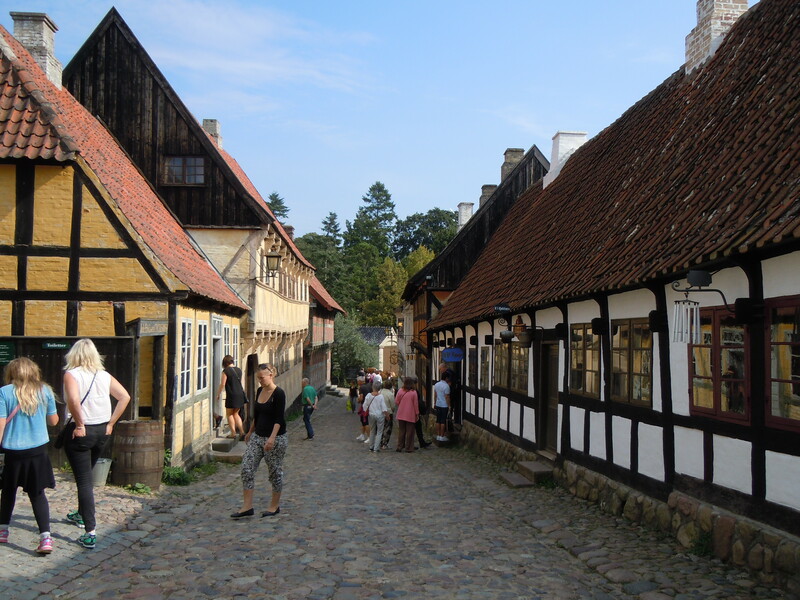 The old town is just that…a series of streets and alleyways with homes and shops that can be visited. 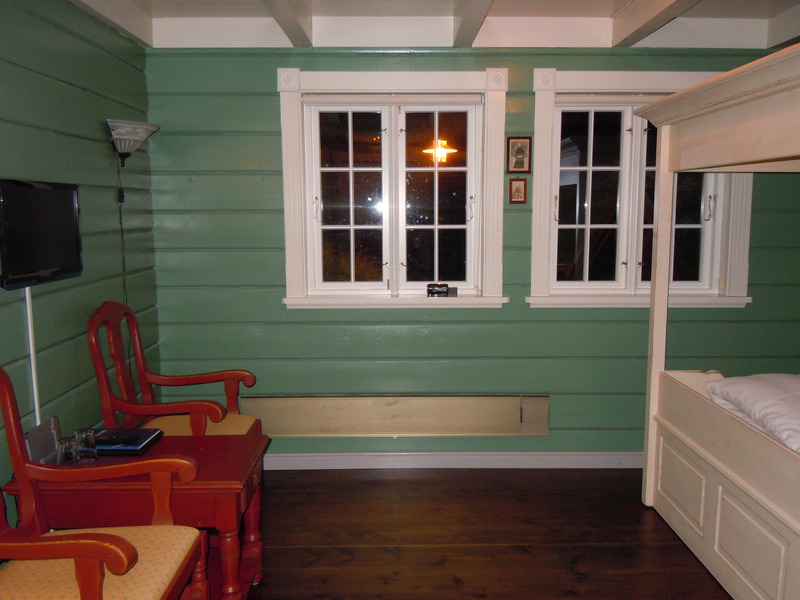 In one of the first places we visited we found the “Little Match Girl” from Hans Christian Andersen’s short story. Next to her, asleep and snoring very loudly, was her father. Such ‘people’ appeared in many of the shops and buildings. It was almost like being in Madame Tussaud’s Wax Museum, they were so lifelike! 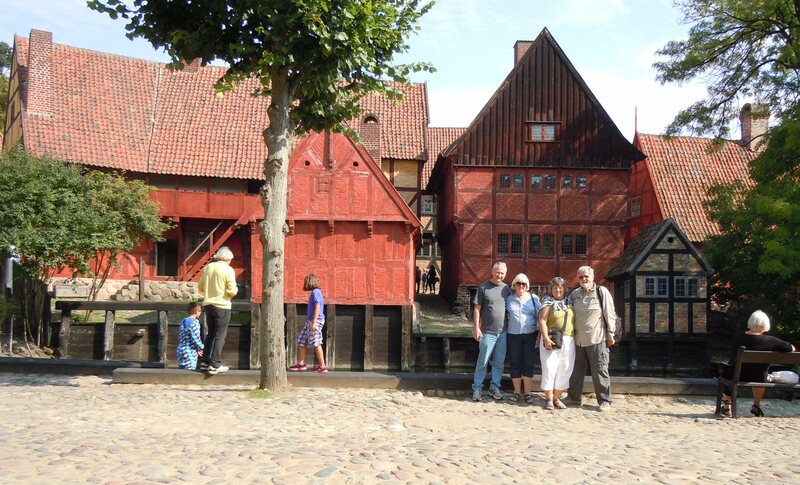 Walking around the old town we had to be careful where we stepped…because of the cobblestone streets, of course! The cobblestones added to the overall charm of the “clippity-clop” made by the horse and carriage, which offered rides to visitors (but we preferred to walk). We took a break from walking long enough to get a selfie in front of the old buildings. 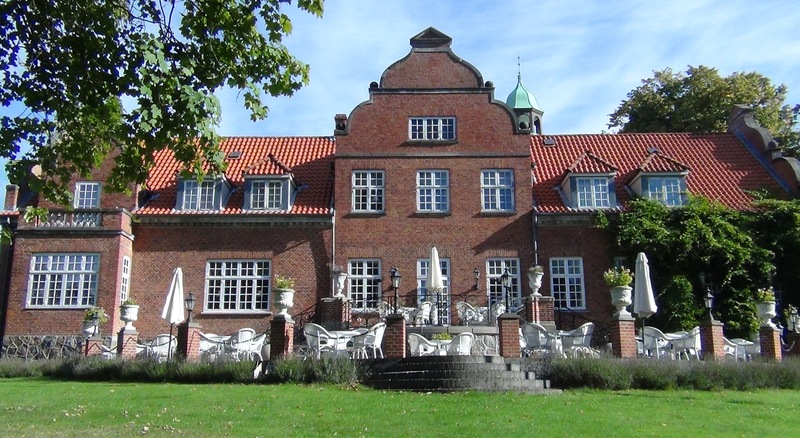 One of the buildings off the big courtyard in the center of the old town is the “Mintmaster’s mansion”. 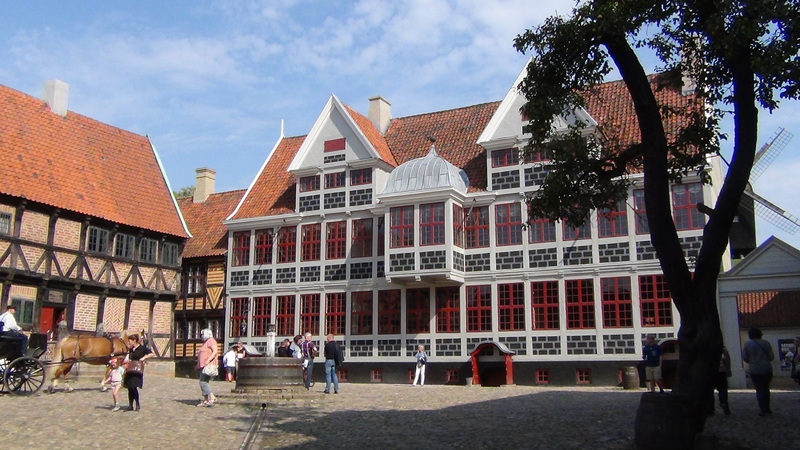 The building was originally built in 1683 and was one of the largest reconstruction projects in the old town. 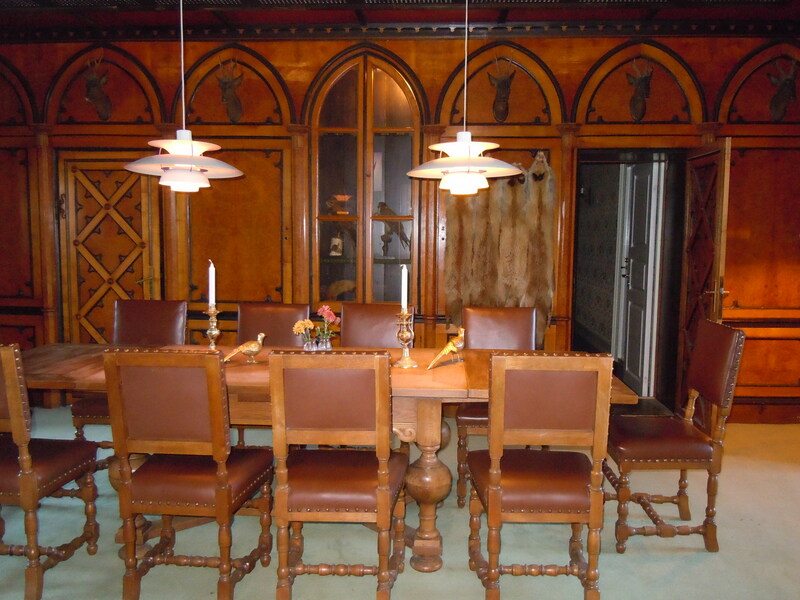 The interior rooms of the mansion are decorated as they would have appeared in the mid-1700’s. 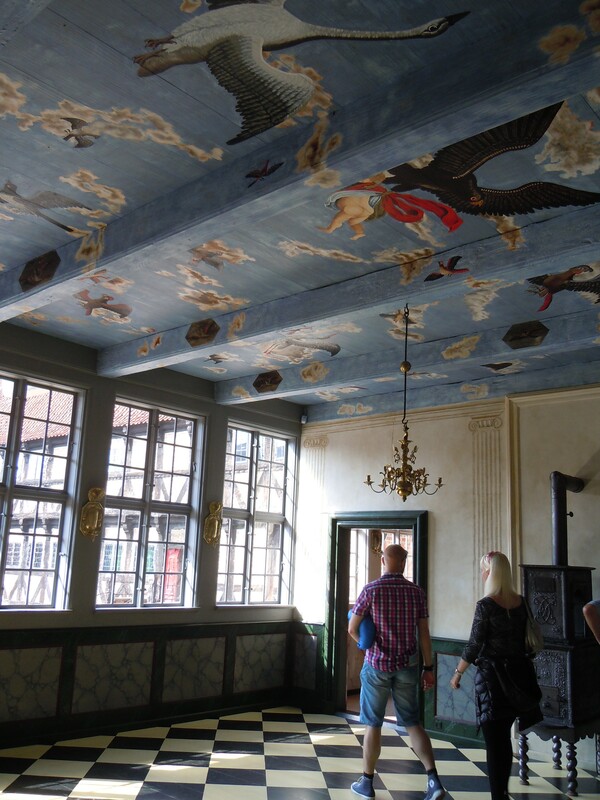 The Avian Ceiling room is appropriately named, having many exotic birds painted on the ceiling, and is ornithologically accurate (according to the guide book). 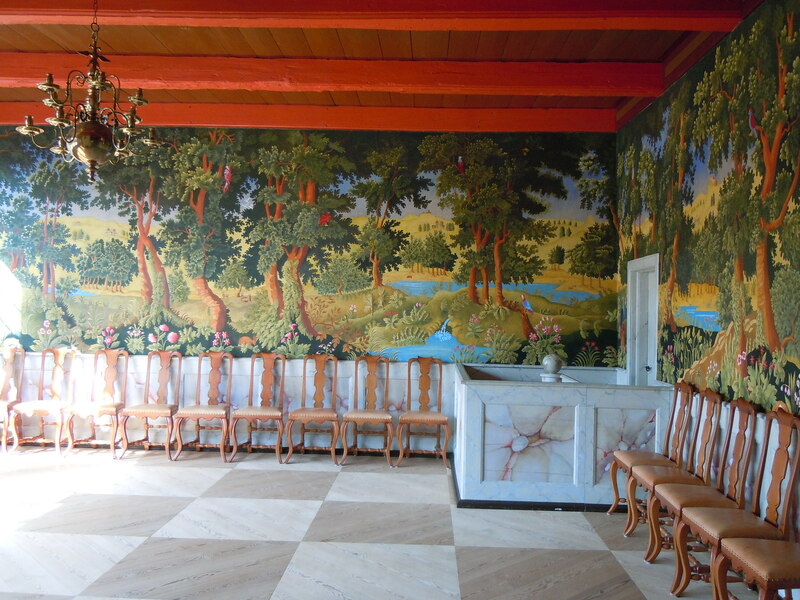 This room demonstrates “Baroque illusionism” where homeowners might paint a marble motif if the home did not have any real marble, or an outdoor scene if the house is in the city. 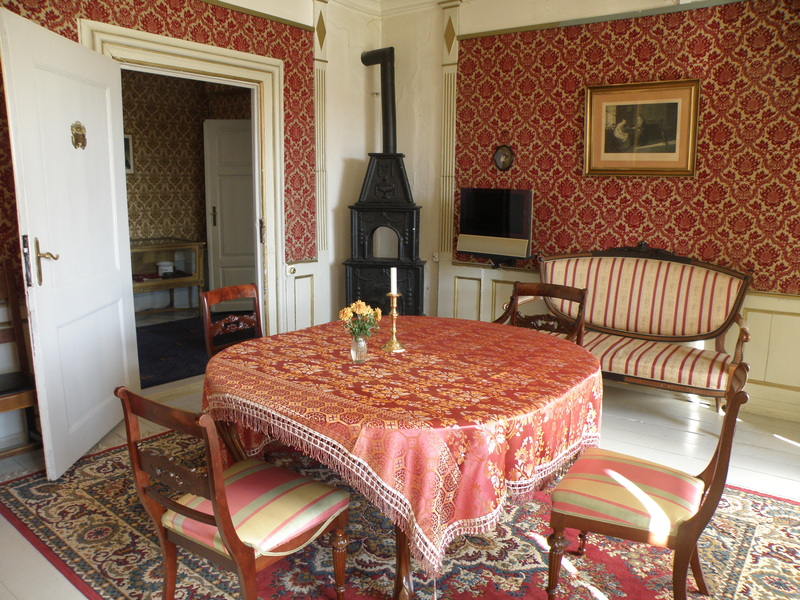 Although it was a bit over the top from a decorating standpoint, it was an interesting idea and nice to see how homes might have been decorated for upper-class Danes around this time period. 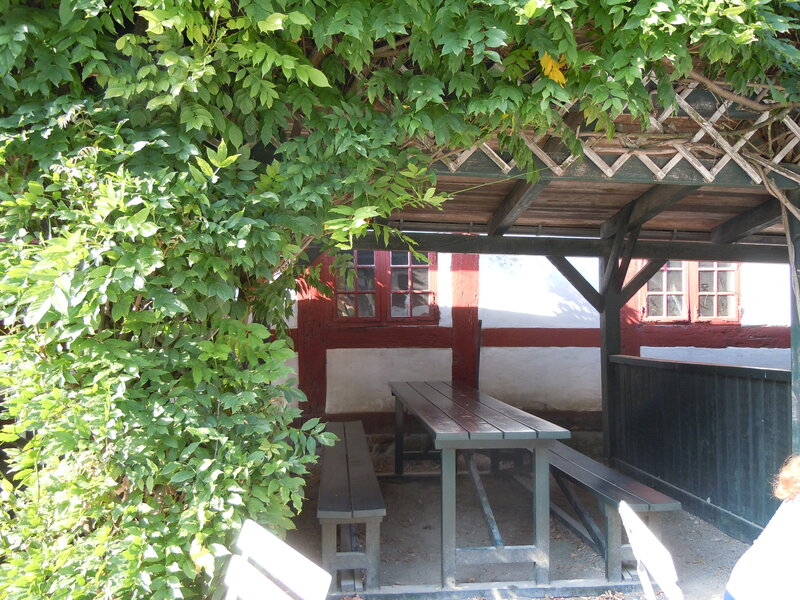 Steen had arranged for us to have lunch in Simonsen’s Tea Garden. We found a nice table in the shade. There were several tables like this in a row. Each seating area was separated by shrubs and covered in vines. It gives a feeling of privacy while still being able to enjoy the natural surroundings and the goings-on at the restaurant. 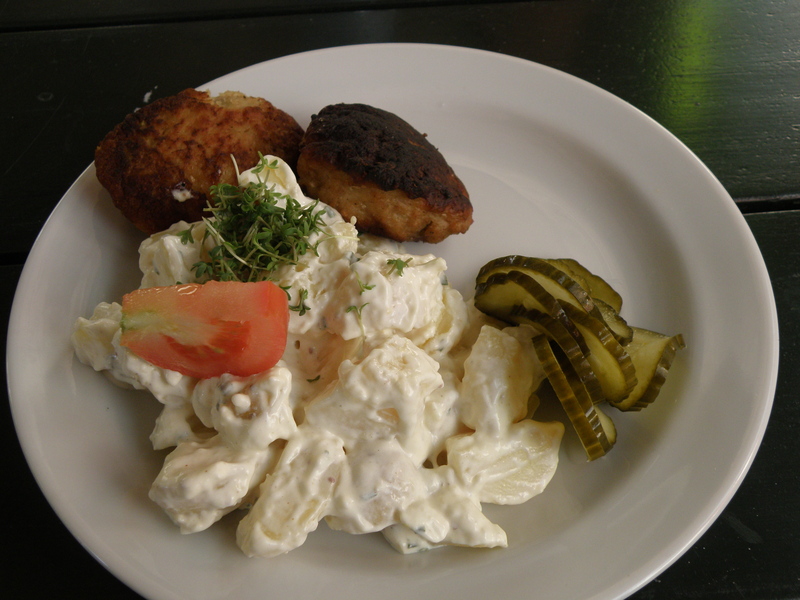 The whole group ordered the traditional Danish specialty “frikadeller” (meatballs made of pork) with potato salad and pickles. It was delicious! Along a quiet street we enjoyed the beautiful reflections in one of several canals throughout the old town…thanks to the gorgeous Danish weather (this day). 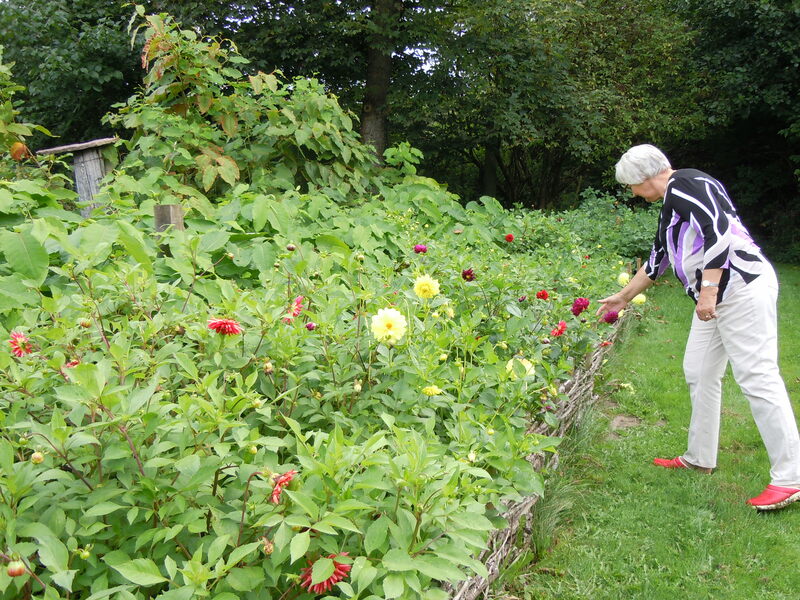 Before leaving old town and driving back to Middelfart we visited the facilities, which happened to be right next to this lovely flower garden. But we found more than flowers! 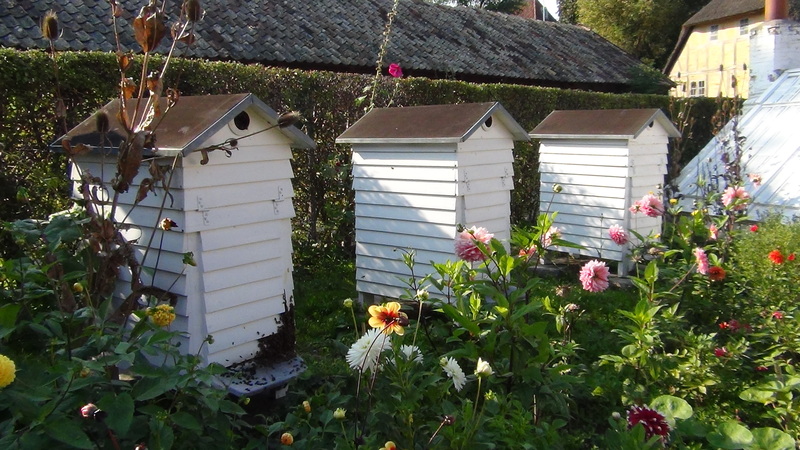 The little white houses are bee houses, and they must have been having a party!! 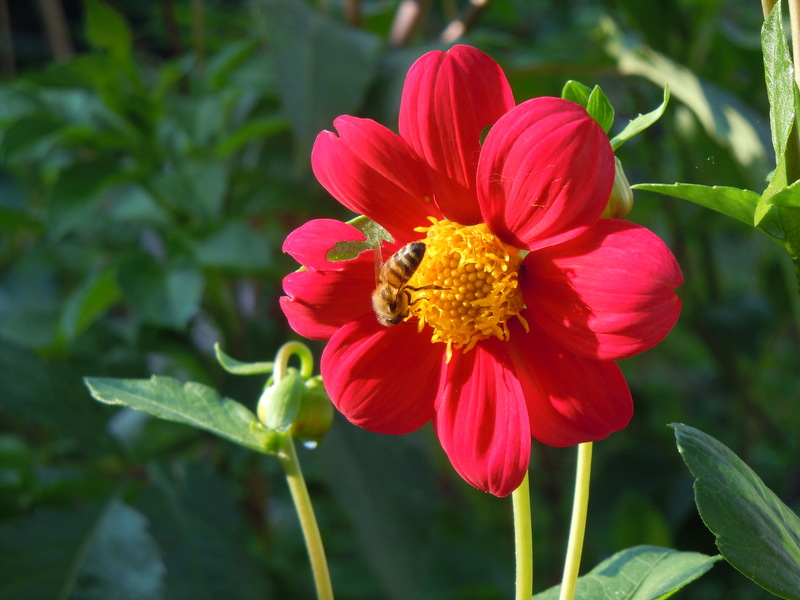 The bees and flowers live together in perfect harmony in this garden. 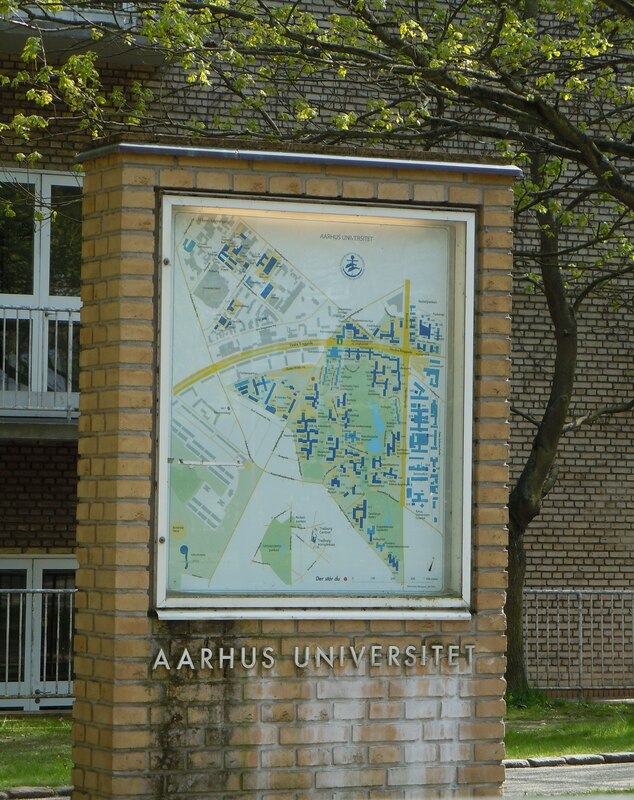 On our way through town Steen drove us past Aarhus University where he studied as a young man. Steen’s great-nephew Rene is attending classes there now. 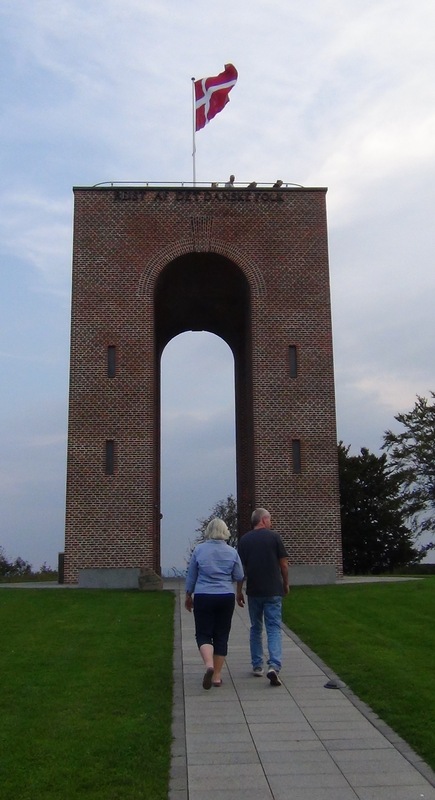 A short ‘on / off’ from the motorway is the highest point in Denmark – 170.95 meters over sea level. Fortunately we were all well adjusted to such altitudes, so no need for Sherpas or oxygen tanks. …but Tim had it even better from the top of the monument. He took the stairs, while the rest of us preferred the elevator. In order to get the elevator to work, one had to insert a coin. We decided it was not worth it when the view could not be much better than from where we stood. Tim made it to the top of the monument in a flash, but unfortunately wasn’t armed with a camera to get the higher view. There was also a coin box for the stairs, so we made sure to pay for Tim’s flight up the stairs once we had him down. Meanwhile, Steen was entertaining the girls with his dramatic (and quite funny) translation of the story of Maram, who among other things, helped kill a dragon, found where the local church should be laid, but in the end when she died she was not treated politely, and was ‘secured’ with a big oak log through her chest (the villagers were afraid of her even though she only wanted to help). 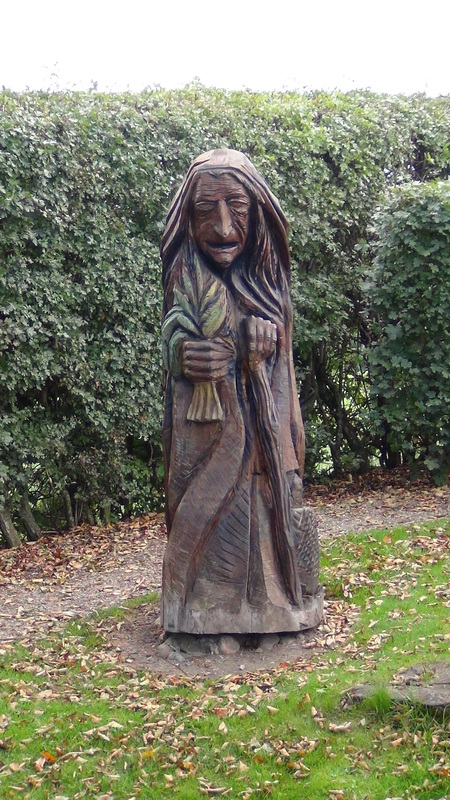 Near the monument, there is a reconstruction where this “good witch” is displayed along with several of her witch tools. 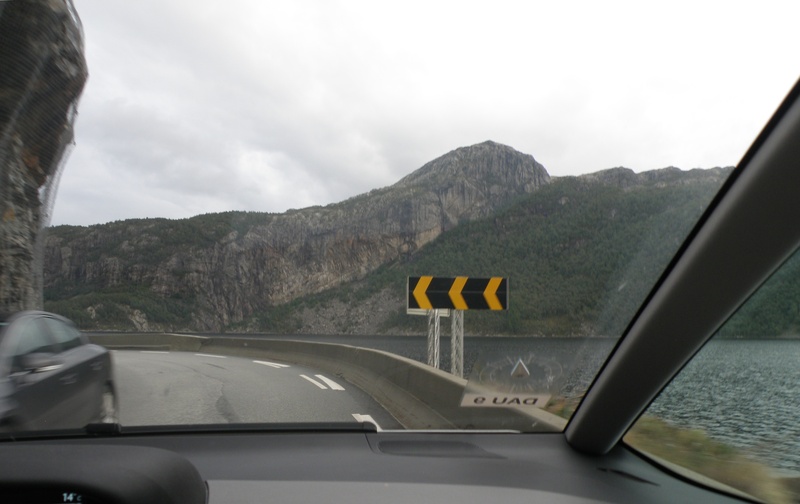 There is still an urban legend that Maram is the cause of all accidents on the nearby highway we left to visit here. 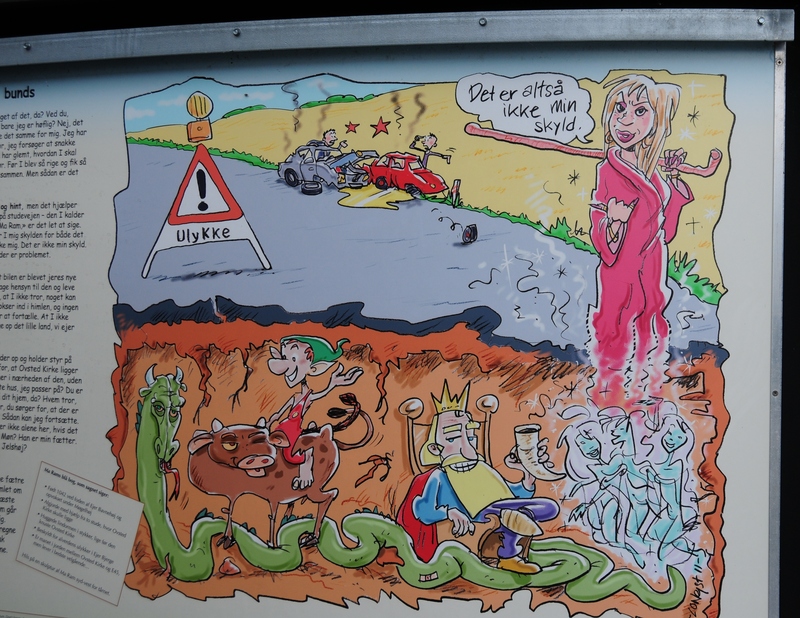 This poster at the visitor center depicts Maram being blamed for the motor accident and she says “It is not always my fault”. 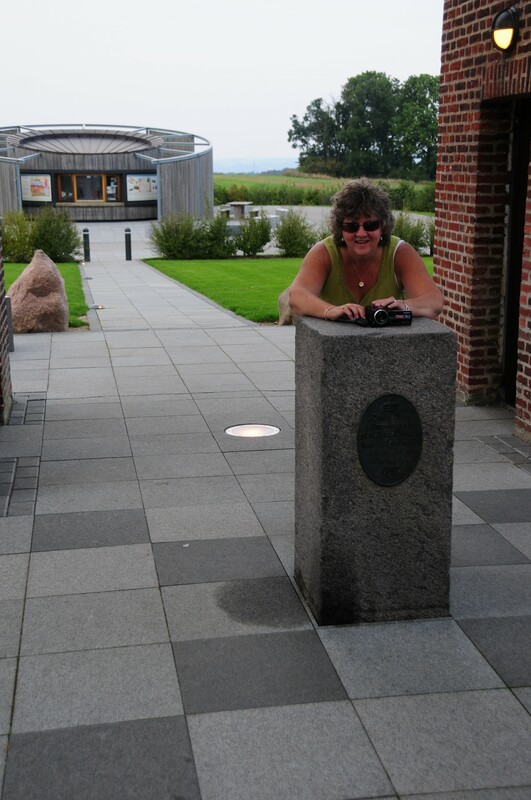 Here you can see the Visitor Center behind Jennifer while she lines up her camera for a selfie from the highest point in Denmark. We did the selfie with the video camera, so we got to do some silly stuff and then choose which frame to keep. Fun stuff. 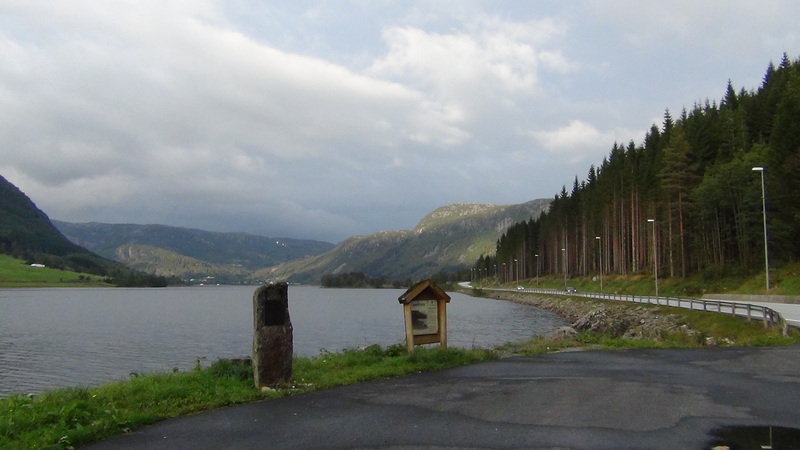 Back on the road and we were soon near our feriebyen. 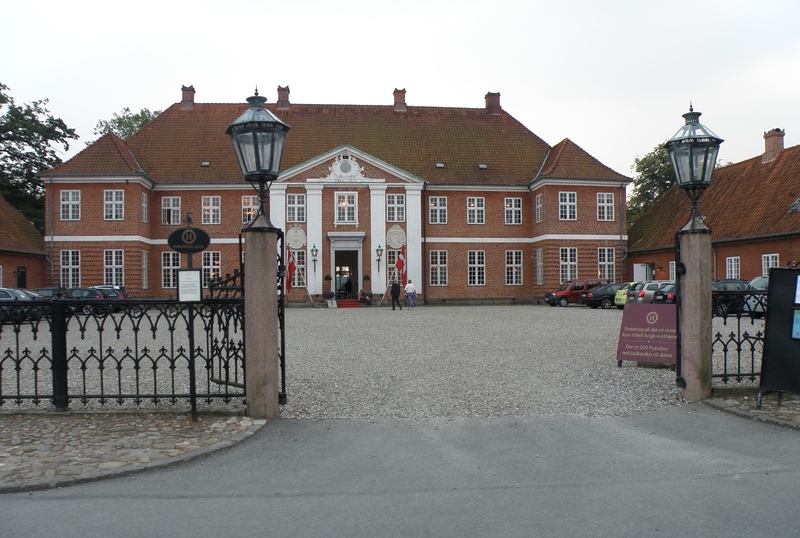 Since it wasn’t yet dark, we drove in a back way past Hindsgavl Castle and then through the Deer Park. The castle has a restaurant that is open to the public (we have not been there…yet) and also for special events such as weddings and that sort of thing. This is all a short walk through a path from our vacation house. 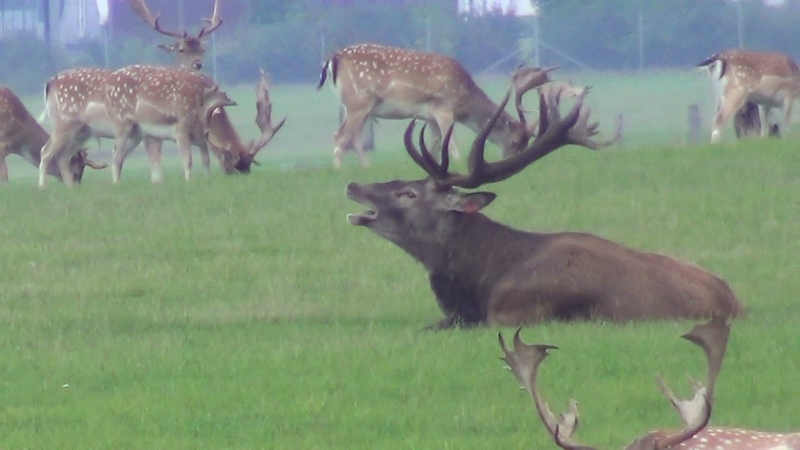 We were very lucky to be able to see a lot of deer, including a large male Red Deer n the middle of the group of males of another species. 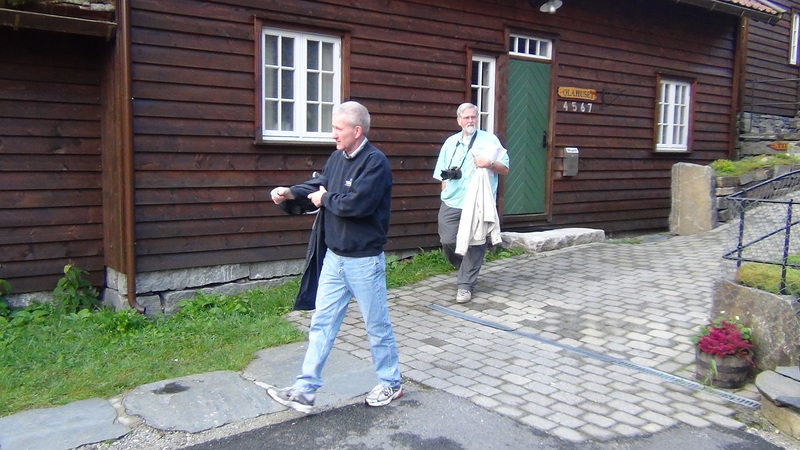 The highlight was when he let out a call for the girls, who we found walking in the opposite direction of the boys as we drove out of the deer park and into the feriebyen property. 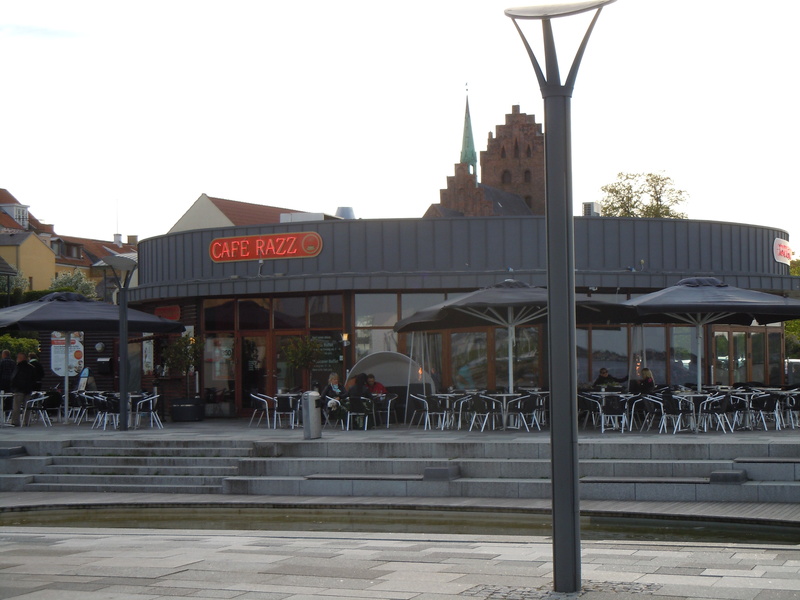 We had decided to take dinner at Café Razz in Middelfart and were going to meet up with Berit and Lars again if we could manage it. We arrived quite late but they were nearby enjoying the evening on a friends’ boat and popped in to see us one last time before our trip to Norway tomorrow. We were all pretty tired and “hit the sack” as soon as we got “home”. 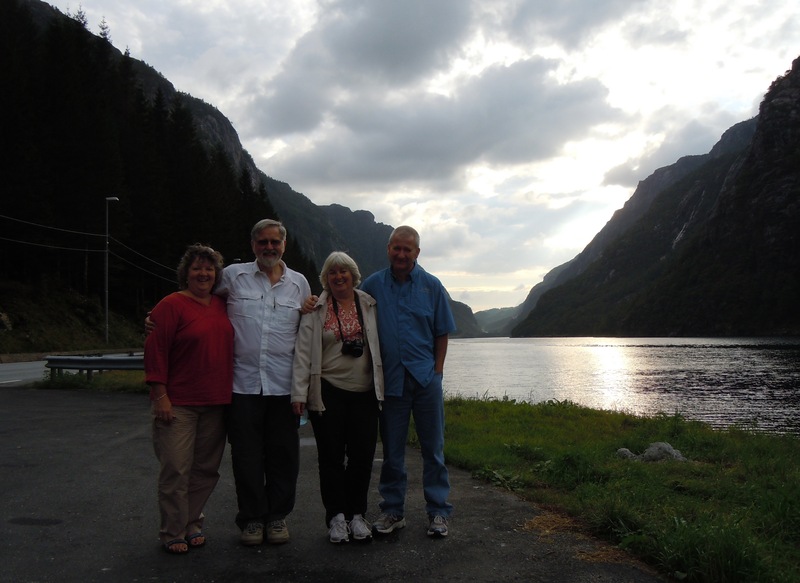 Today we were invited to spend the day with Steen’s brother Peter and sister-in-law Margit. We met at their home at 9 AM. 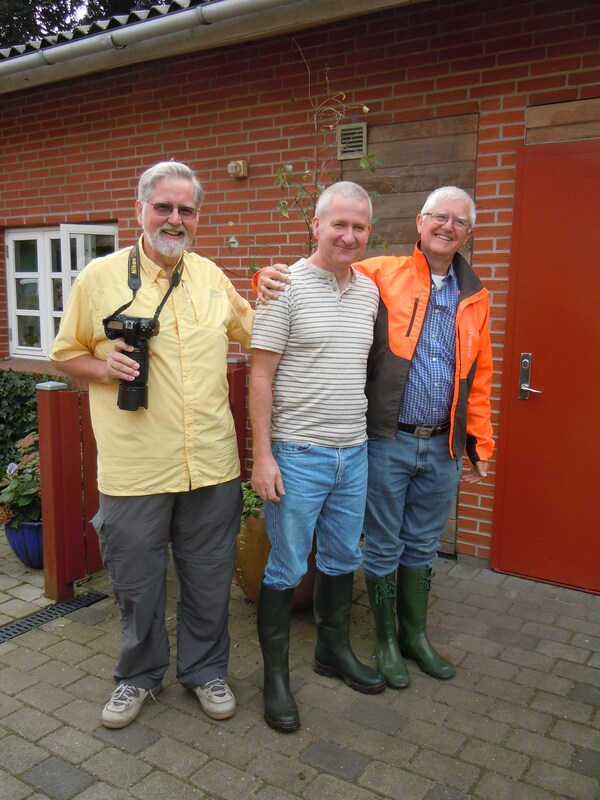 We had arranged, as a surprise for Tim, that Peter would take him to his friend’s dairy farm to show Tim how a Danish farm operates (Tim has a farm in Sullivan County, PA and is very interested in farming things). Peter wanted to make sure Tim wore clothes and shoes that could get dirty. He hadn’t really packed anything like that, and if Amy had insisted he wear dirty clothes, he would have known something was up. Fortunately Tim is the same size as Peter, so Peter loaned him a pair of rubber boots for a walk around their property. These boots would come in handy later for the tour of the dairy farm, but Tim still doesn’t know anything is up. 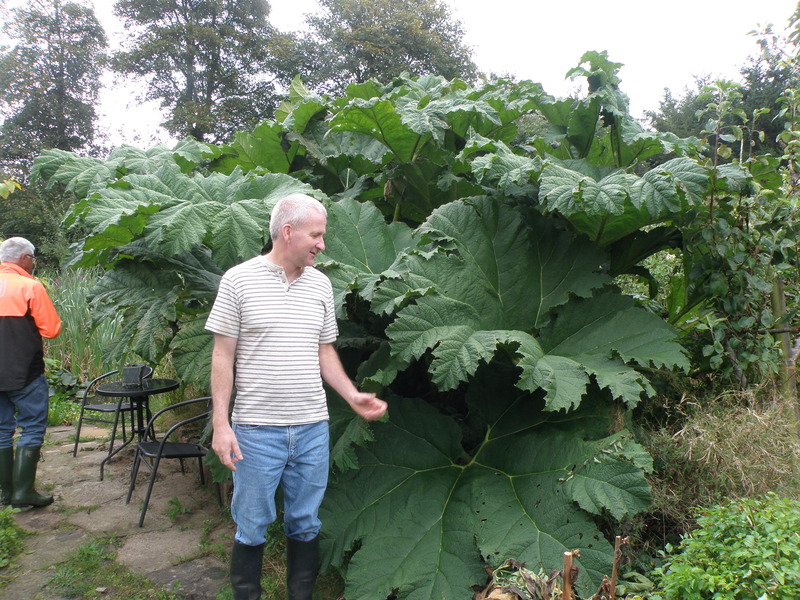 Near the big pond there is a giant flowering plant (from the Gunnera genus). 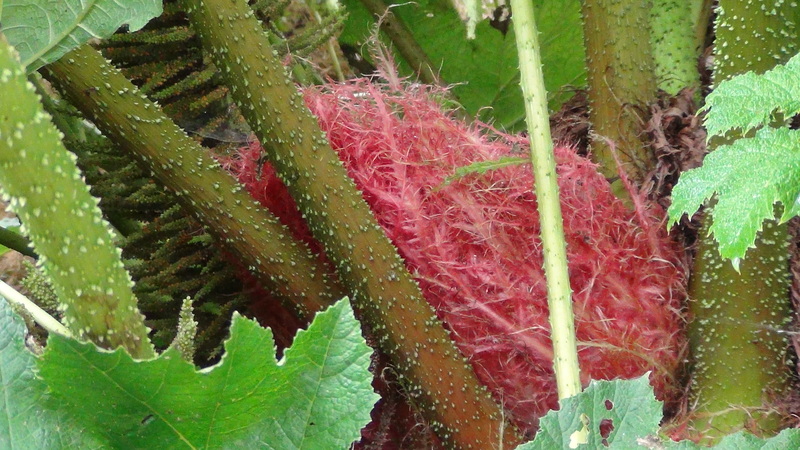 The leaves are huge, and there is a giant pink flower in the center. Margit and Peter have a smaller version of this one near the smaller pond. Tim was quite taken with this and wants to know where he can get one. Perhaps we will next time we visit Sullivan County, PA see one of these next to Amy and Tim’s pond. Margaret then showed us her beautiful flower gardens (notice the natural twig fence built by Peter). And then to show you what fine specimens there are, indeed. 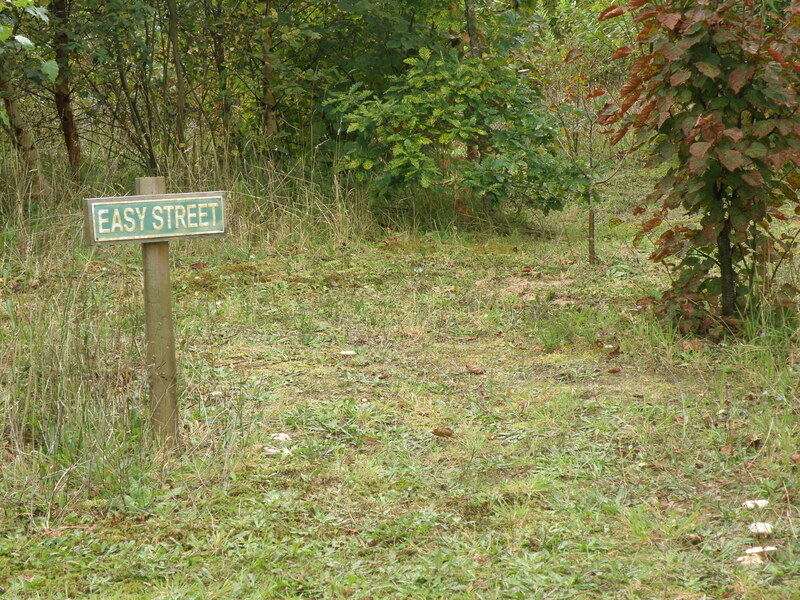 We then took a walk down Easy Street. 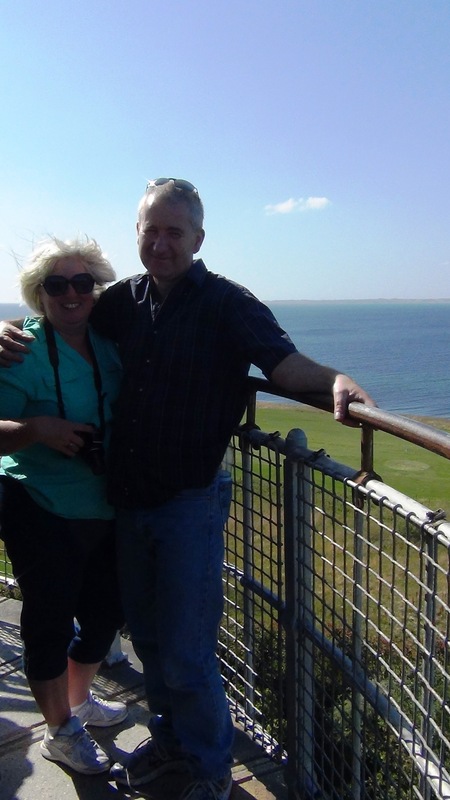 Margit and Peter live on a farm with a lot of property and they have planted many trees and have a real forest now. 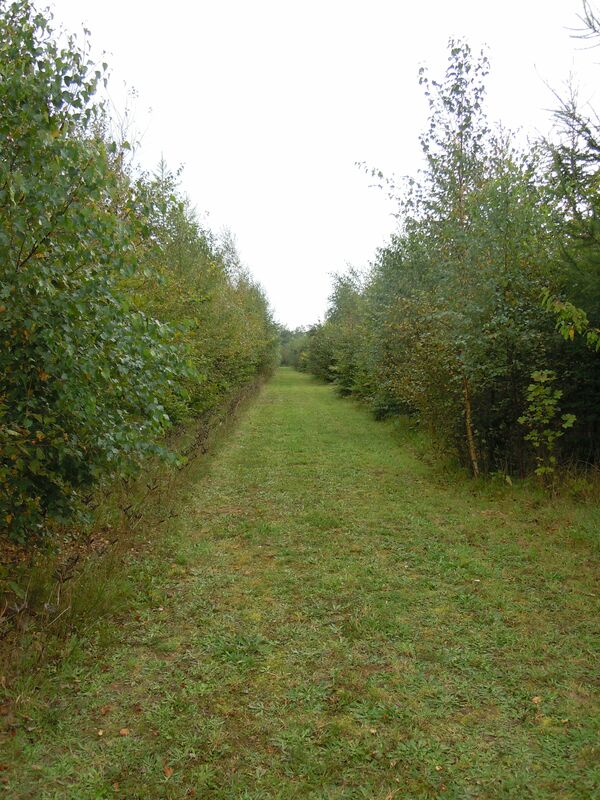 But they have maintained nice grass walking paths so that it is very pleasant to walk all around (Peter also hunts deer in this forest). Peter has a wonderful sense of humor and has placed street / road signs of famous places (Route 66, Sunset Boulevard, Broadway, etc.) at each of the intersections. 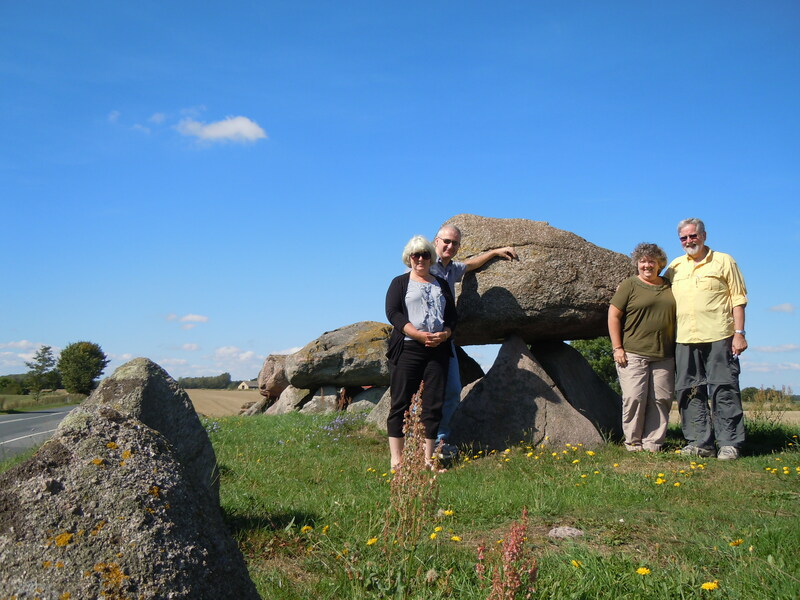 While Margit stayed at home preparing a wonderful lunch for us, Peter took us around in the area to see a few interesting things. 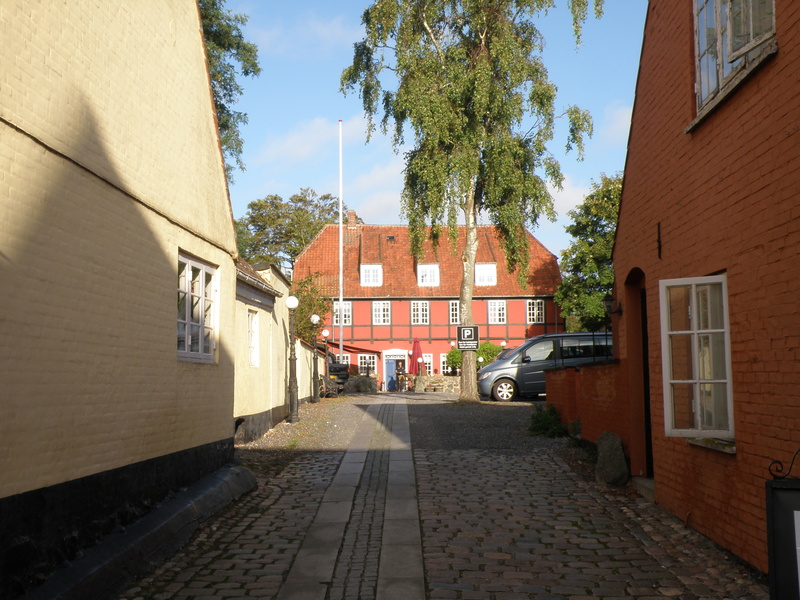 The first stop was the town of Jelling (pronounced “Yelling”) which is a very significant historical site for Denmark as well as a UNESCO World Heritage site. 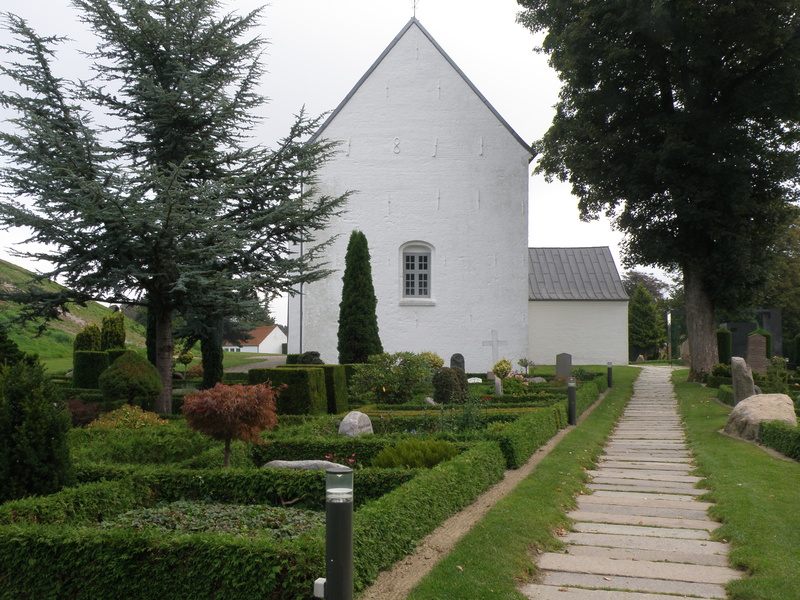 There is a nice church and this gave Jennifer and Steen an opportunity to show Amy and Tim a traditional Danish cemetery. 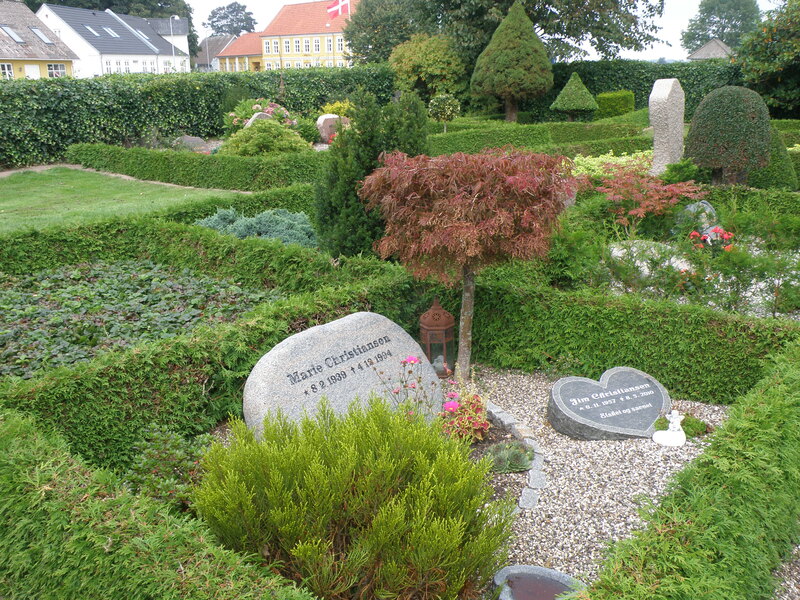 Each plot is surrounded by a low hedge, and they are all decorated very nicely and uniquely with headstone (most carved on natural stone, unlike the ones we are used to in US), shrubs, flowers, and many times with a lantern (with real candle). 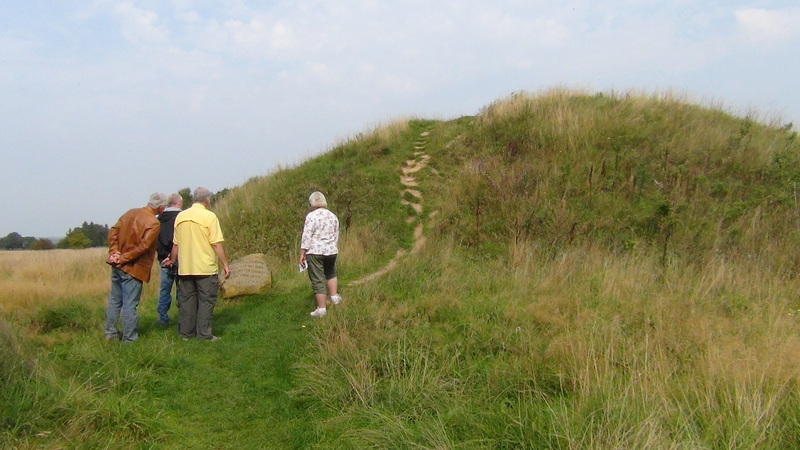 The church is situated between 2 large burial mounds, one to the north and one to the south. 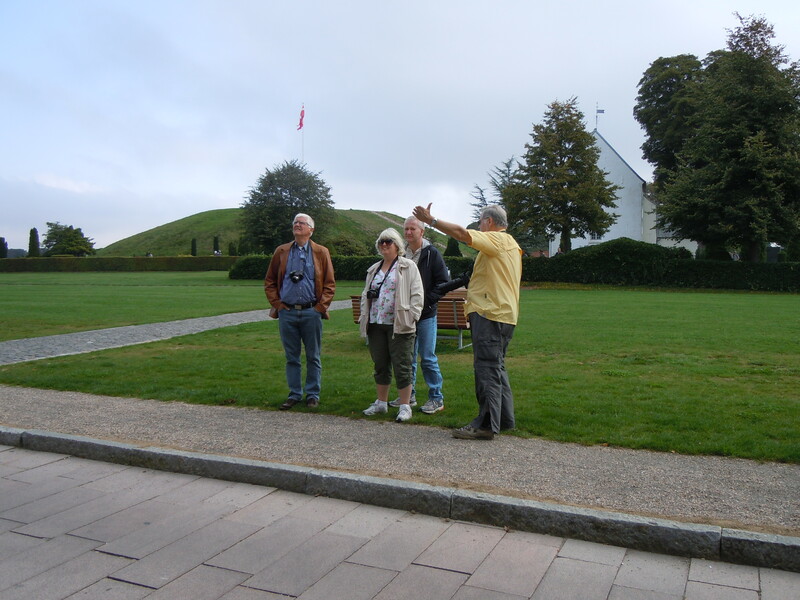 Behind the group getting a history lesson from Steen is the North Mound. 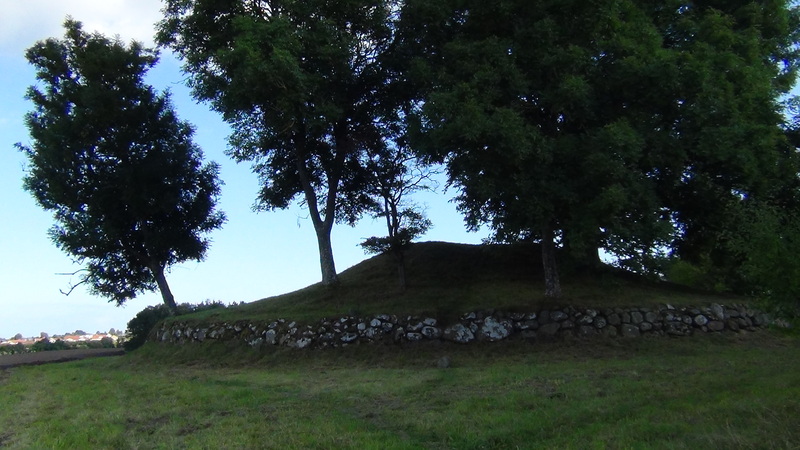 The church and cemetery are situated halfway between the 2 mounds. 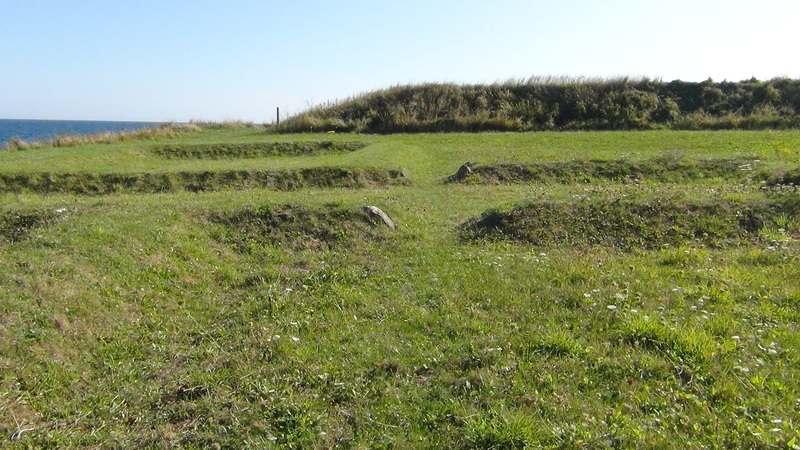 Also dead center between these mounds is 2 runic stones (writings from the Viking Age). 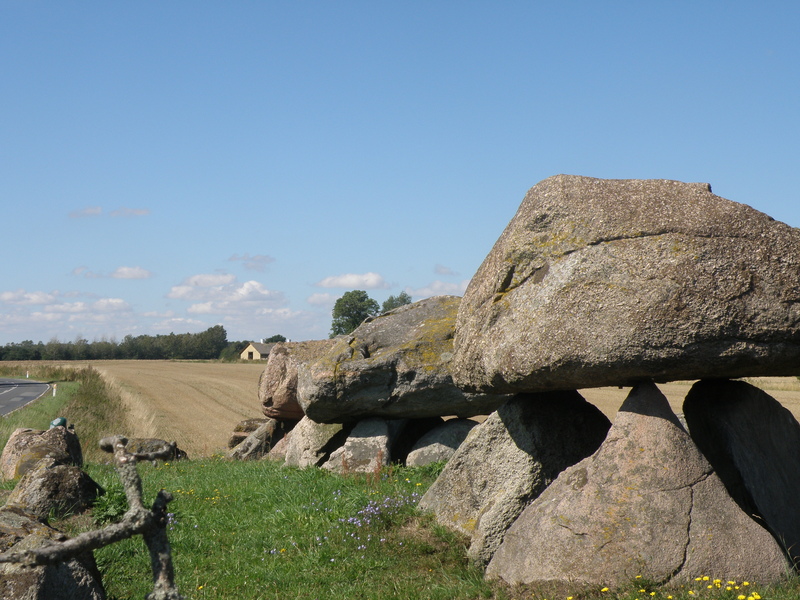 One of these stones has been standing in this spot since the 10th century. 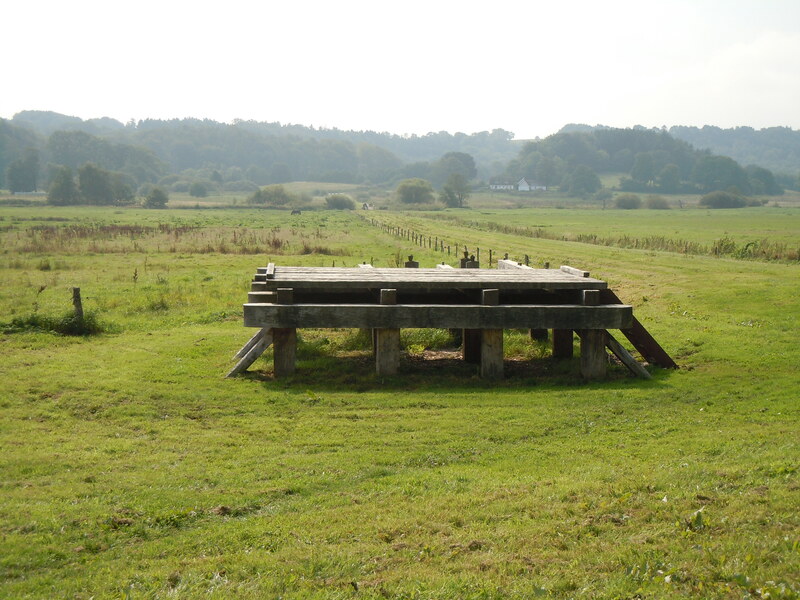 The smaller of the 2 seems to have been moved, and there is only speculation as to where it originally stood, but it has been confirmed that it has been standing in the spot it is currently in since the 1600’s. The smaller of the 2 is the writing of Gorm the Old (historically the first King of Denmark) to honor his wife Thyra who died before him. 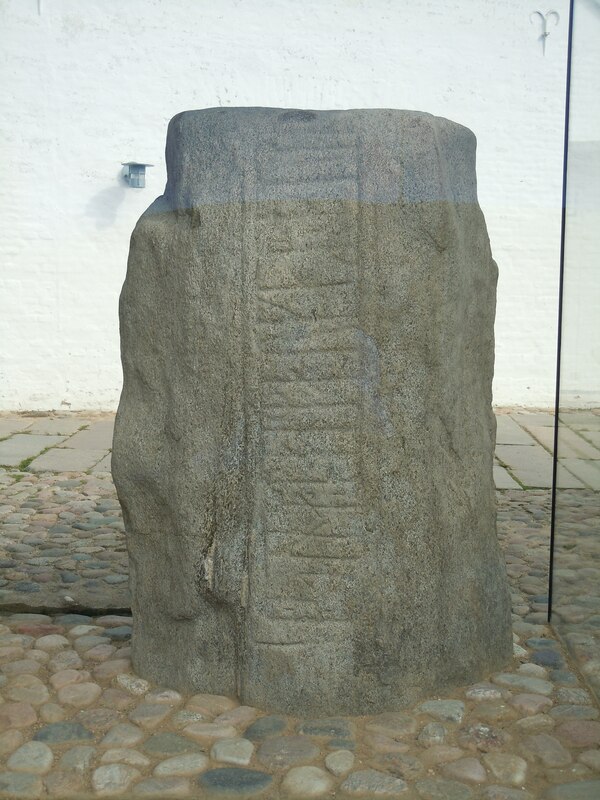 The larger of the 2 stones was written by Gorm’s son Harald Bluetooth who became King after Gorm’s death, and is credited for not only conquering Denmark and Norway, but also for converting Denmark to Christianity. 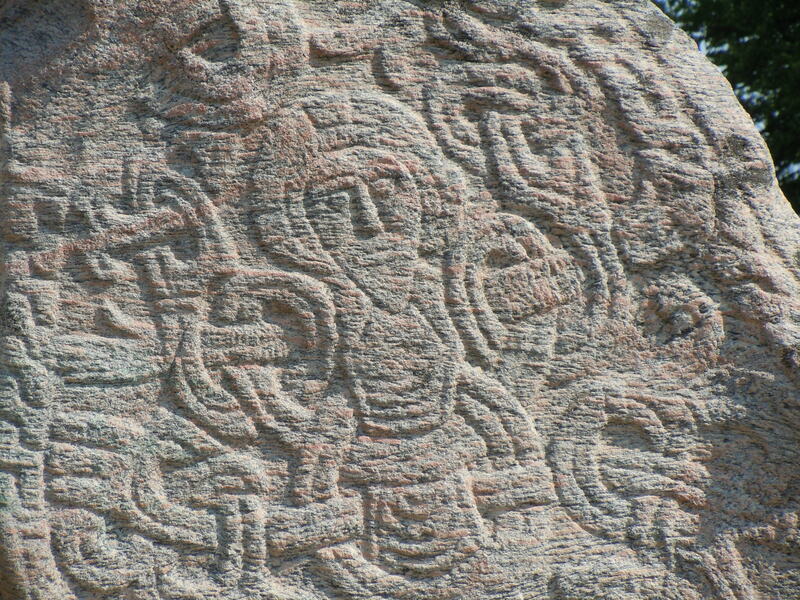 In the large stone, there is a carving of Christ which is thought to be the first recorded image of Christ in Denmark. 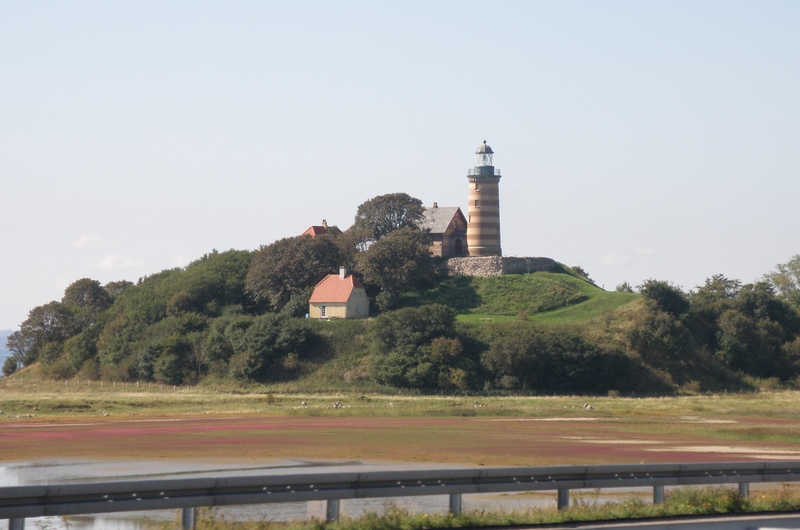 Also attributed to Harald Bluetooth is the Ravning Bridge, a 760 meter long bridge built during the time of King Harald (late 10th century). This is a reconstruction of what a small portion of the bridge looked like and how it was built. 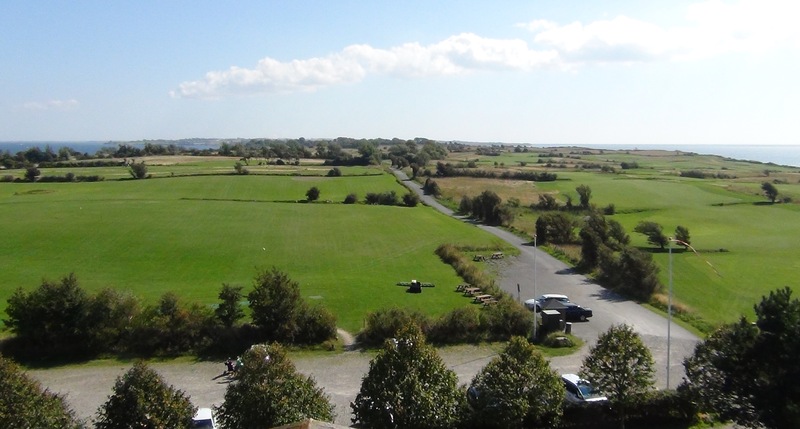 This is located approximately 10 km south of Jelling and due to it’s size, the timber used, and the manpower needed to build it, is thought to have been built by a major power of the time (Harald). 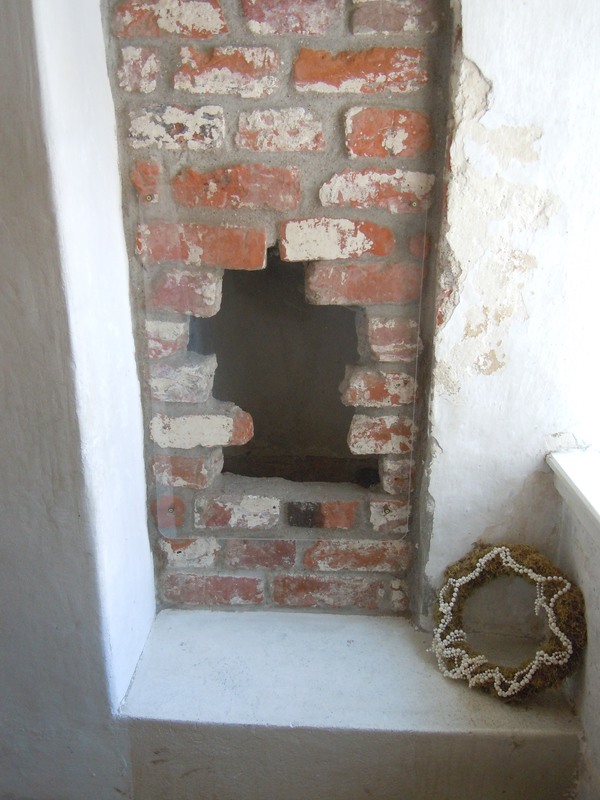 An original piece of the bridge (imagine this, from around the year 980) is preserved and is inside the building that Peter and Steen were peeking in the windows of. So you see, it’s not just the girls who like to peek in windows. After a very short drive we arrived at yet another fascinating bit of Danish history, the Egtved Girl museum and excavation site. The Egtved Girl was a slim girl, aged 16-18 years, from the Bronze Age. Her burial has been dated to around 1370 BC. In the 1920’s a farmer was excavating his field and found a wooden coffin. 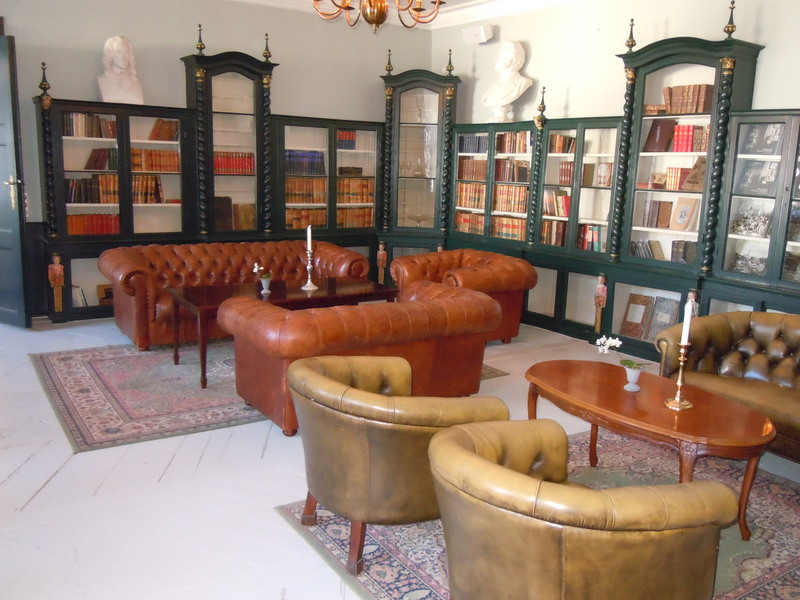 He contacted the National Museum in Copenhagen. 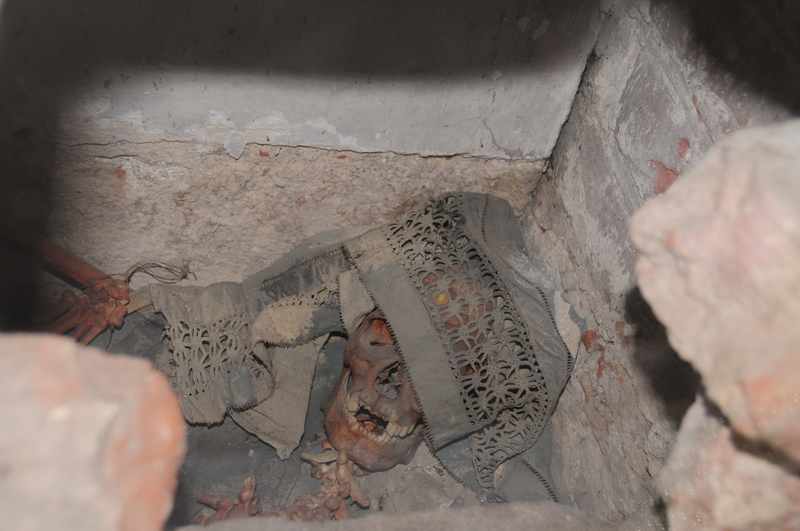 The sealed coffin was transported to the National Museum and when it was opened the Egtved Girl was discovered. This created quite a sensation in 1920 Denmark due to the dress she was found to be wearing. 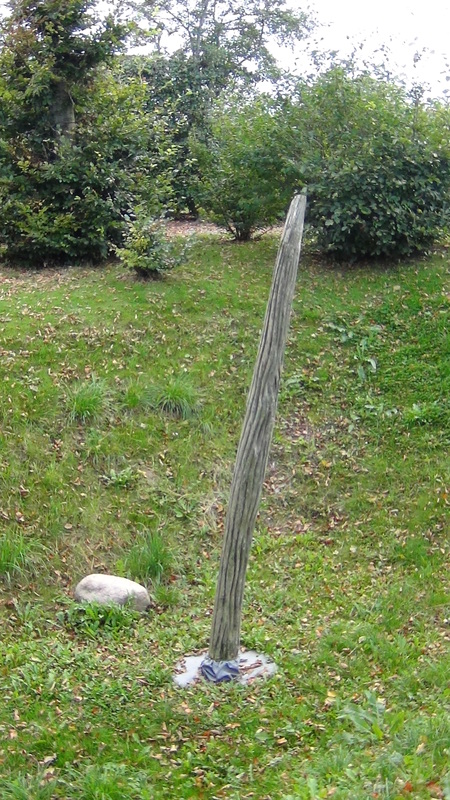 However, it was later understood to be the best preserved example of a style now known to be common in Northern Europe during the Bronze Age. 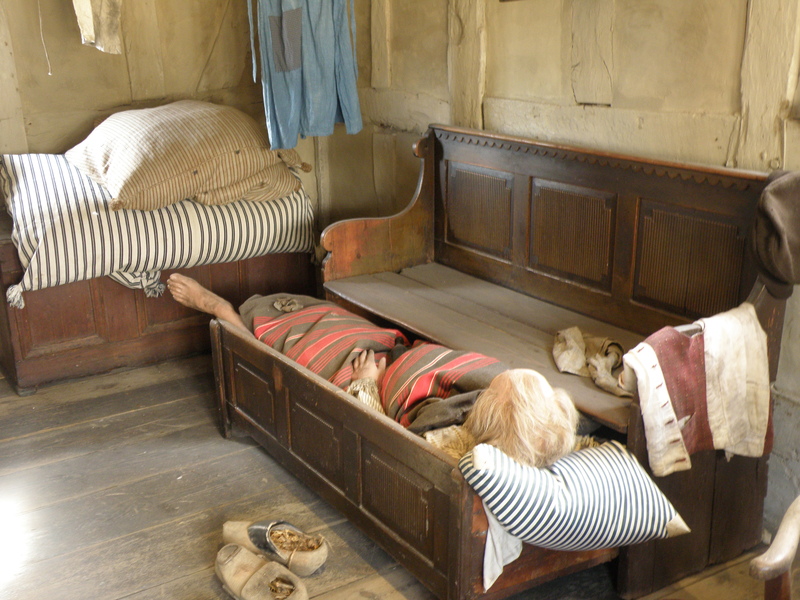 This is a photo of the actual coffin and remains of the Egtved Girl which is on display at the National Museum in Copenhagen. The items buried with her just add to the mystery surrounding her: she was buried fully dressed and placed on a cowhide. She wore a loose bodice with sleeves to the elbow. 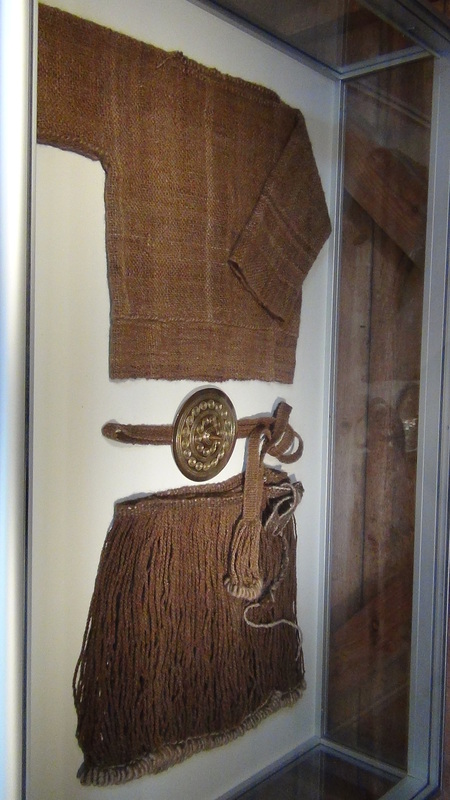 She had a bare waist and wore a short string skirt with bronze bracelets and a woolen belt with a large disc decorated with spirals and a spike. At her feet were the cremated remains of a child age 5–6 (her relationship to this child is unknown, but it was not her own child). By her head there was a small birch bark box which contained bronze pins and a hair net. Before the coffin was closed she was covered with a blanket and a cowhide. Flowering yarrow (indicating a summer burial) and a bucket of beer made of wheat, honey, bog-myrtle and cowberries were placed atop. 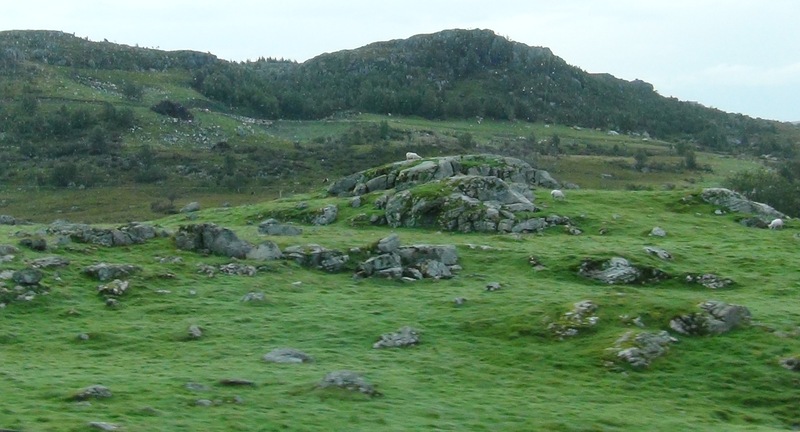 The acidic bog conditions of the soil in this region are the reason she has been so well preserved. 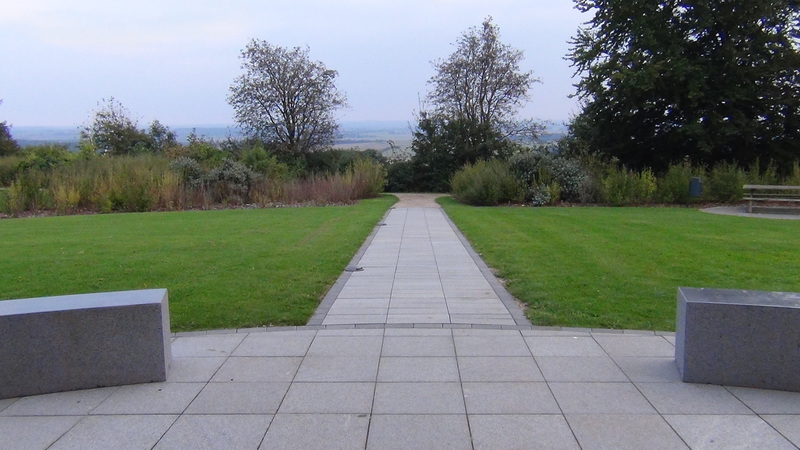 This is a reconstruction of the bronze age hill where she had been excavated from in 1920. 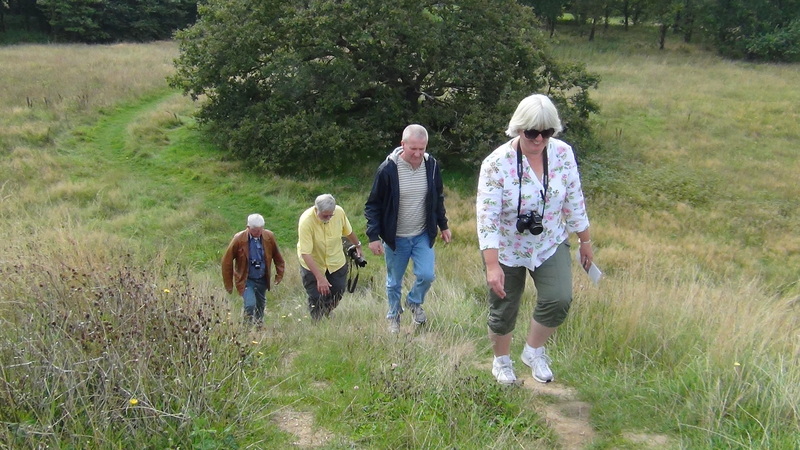 We couldn’t resist climbing up the hill to get a good look at the countryside. 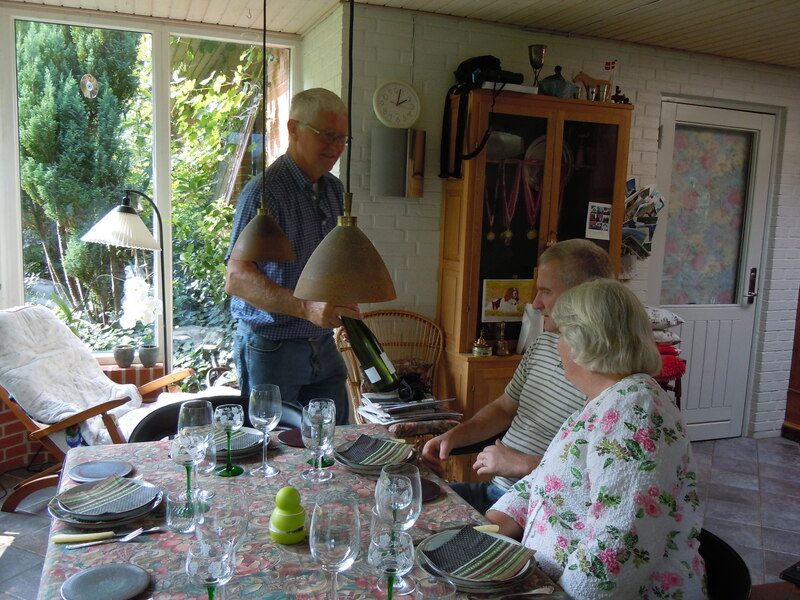 This also contributed to working up a good appetite for the delicious lunch that Margit was cooking up for us. 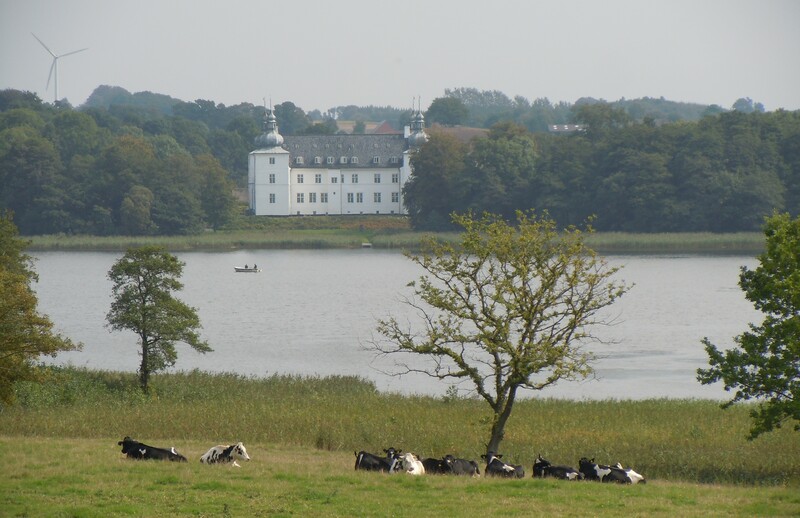 On the way back to Margit and Peter’s farm (“Chateau Ryholl”) we passed Engelsholm Castle, also known as “The Onion Castle” due to the onion-shaped towers. 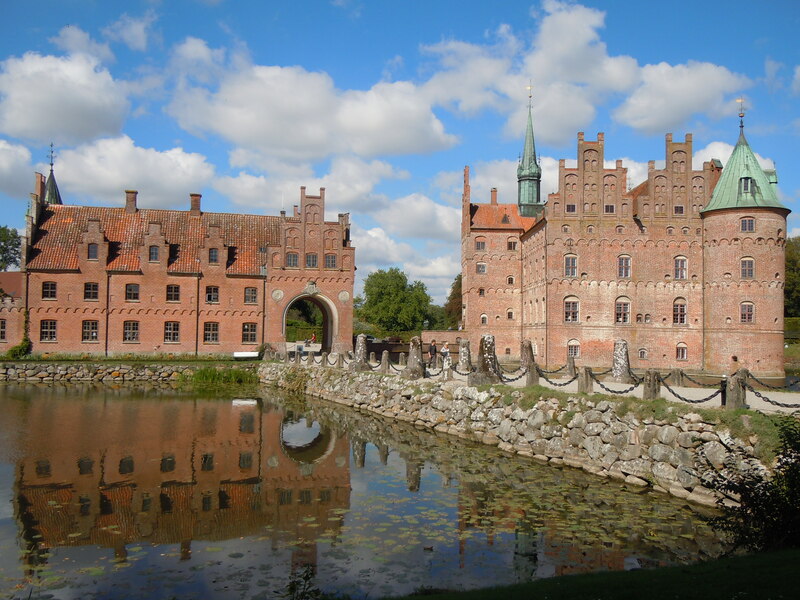 The castle is from the 15th century and sits on Engelsholm lake which has a very nice trail around it. We will have to save this for next time. Lunch is waiting…and then a surprise for Tim! Every fine lunch should be accompanied by a good wine. Here Peter presents the guests with the selection. After a wonderful lunch it was time for the surprise to be revealed. 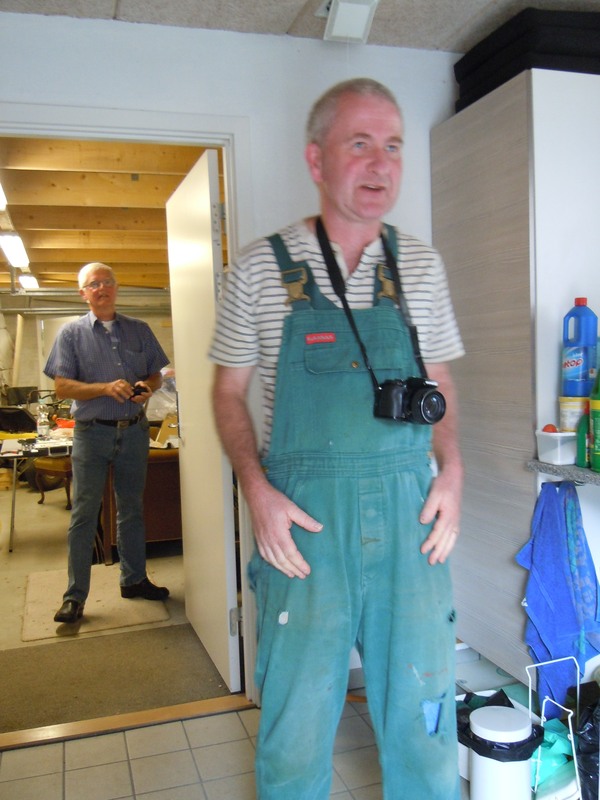 Peter took Tim out to the work room and gave him the rubber boots from earlier and a pair of overalls to keep his clothes clean. Amy gave him some quick instruction on how to use the camera, and he was ready to go to the local dairy farm. 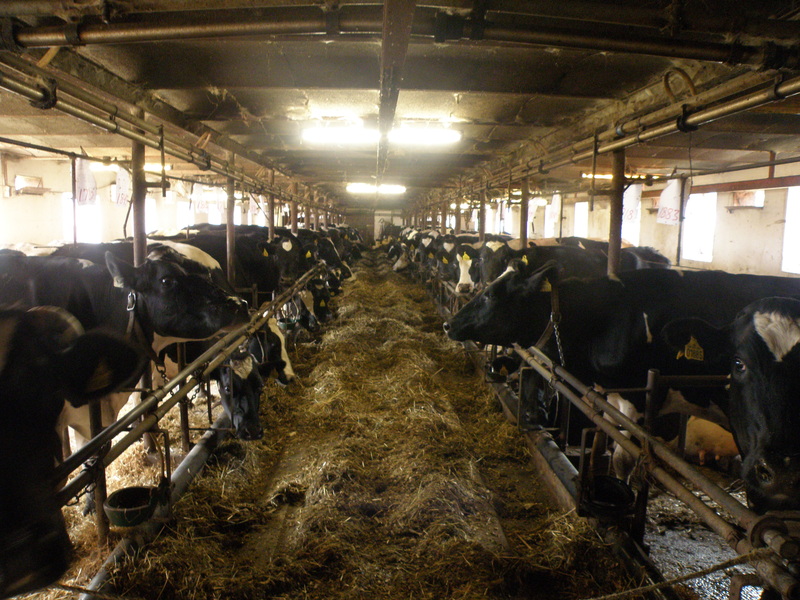 Tim mastered the camera instruction and got this nice picture of the dairy cows inside the barn. After Peter and Tim returned from the farm, Tim enjoyed telling the girls (and Steen) all about what he saw and experienced. He even milked some cows. 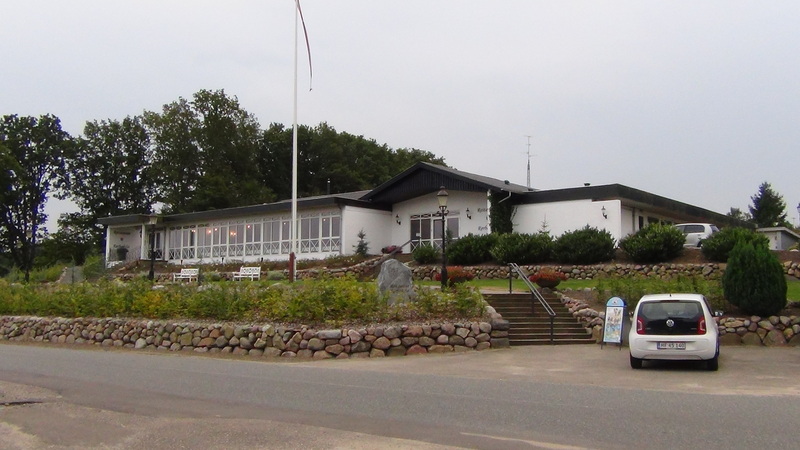 Soon it was time to go to the restaurant where we would have dinner with Steen’s family. 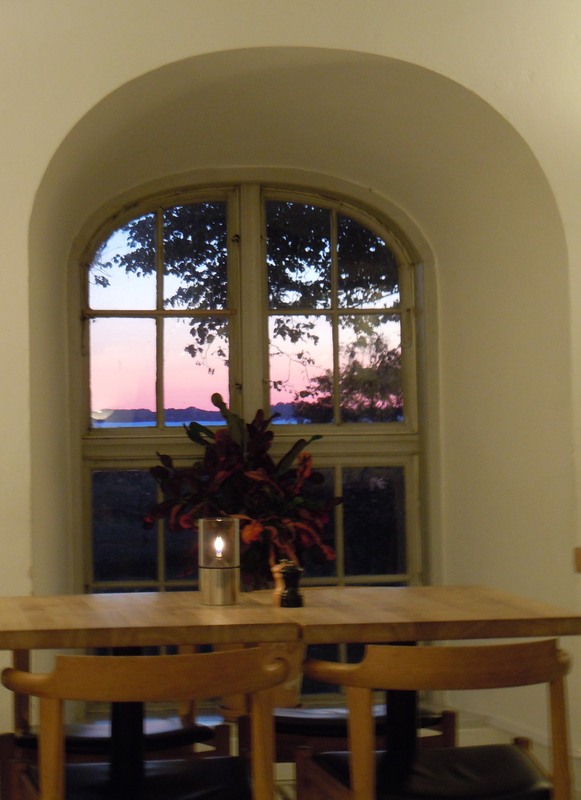 This is the restaurant Rørbæk Sø. As long as Jennifer and Steen have been together, each year on Steen’s mother’s birthday we would meet at this restaurant to celebrate with her and all the family and friends. So this was a nice place to bring the family together again to see Amy and Tim. 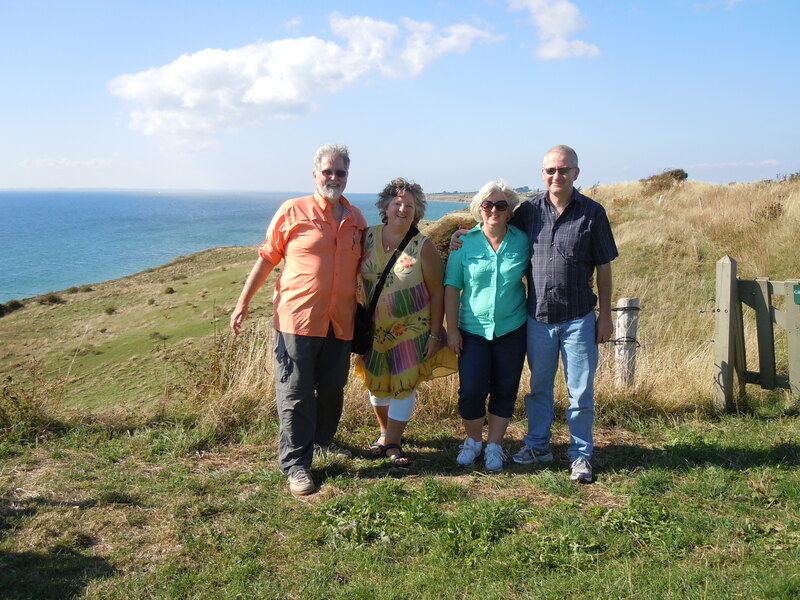 Most have already met them in US except Jan (Steen’s oldest nephew) and his family, wife Gitte and twin sons Mark and Rene. No family gathering would be complete without the group photo. We had a lovely time seeing the whole family together (even though we were missing Sebastian and Laura [Steen’s great-nephew and great-niece], the son and daughter of Lars and Berit) despite that it was a very short visit this time. We said our fond “Farvel” and all went home with a smile. Early to rise for this group! 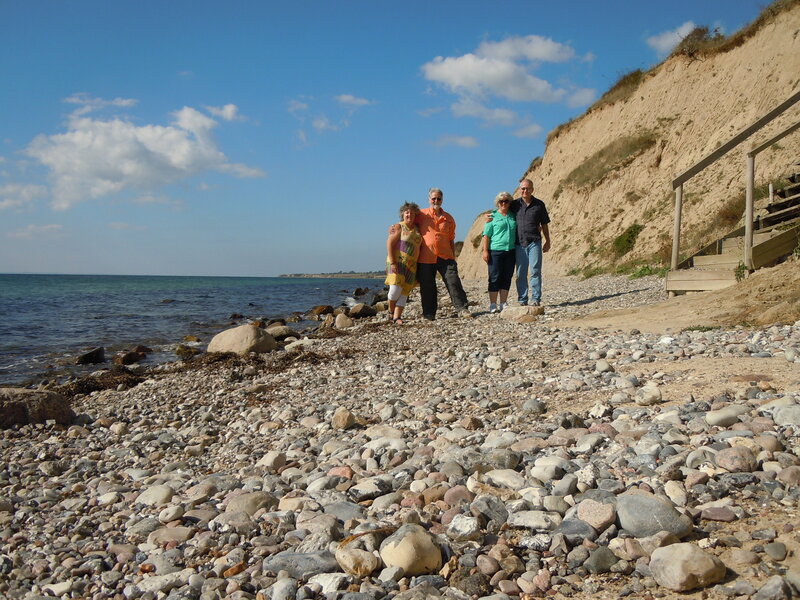 We had a 7:00 reservation on the ferry to one of the most beautiful Danish islands, Aerø. 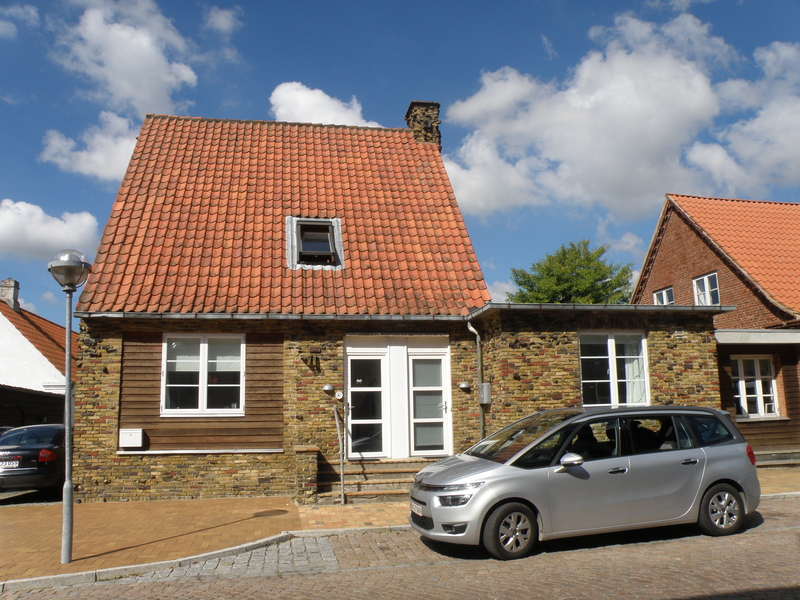 It would take about an hour to drive to the ferry from our “vacation city” in Middelfart. 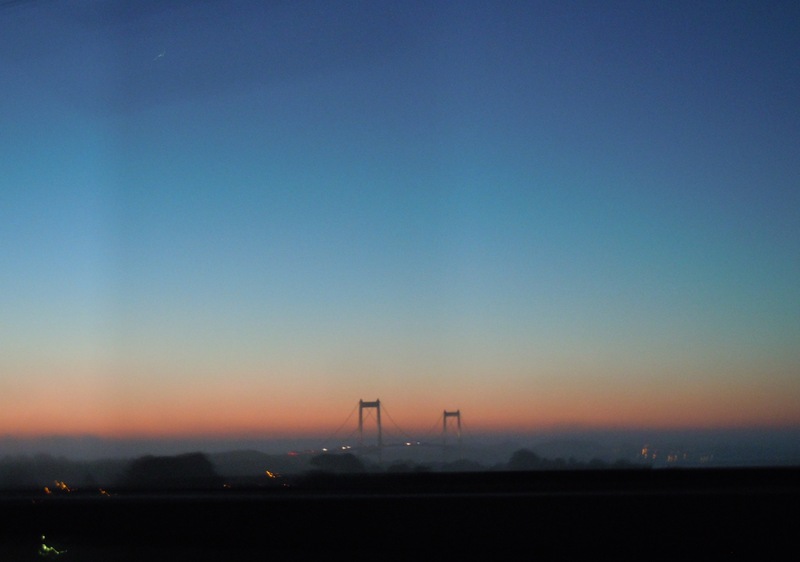 The colors of the sunrise were beautiful, with the Lillebæltsbroen (“Little Belt” bridge) in the foreground. 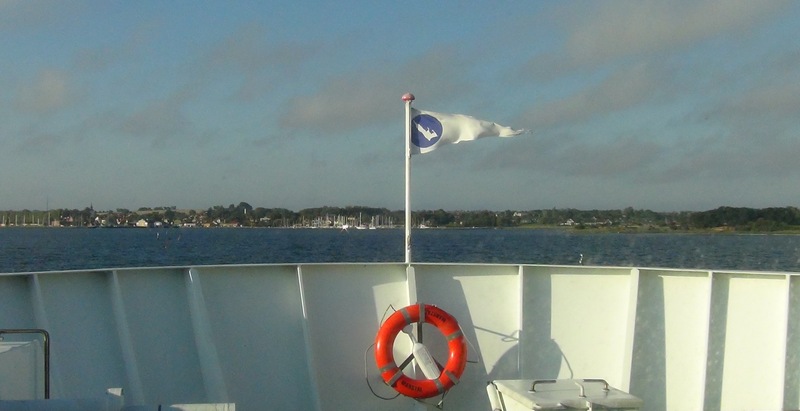 The Lillebælt is a smaller version of the Storebæltsbroen we passed yesterday when we crossed from Zealand to Funen. The ferry was right on time (maybe even a few minutes early) so we drove on to the ferry, left the car and found a nice spot inside by the window for the 90 minute crossing. Steen ordered some “wienerbrød”, a traditional sweet Danish “danish” and some tea and coffee to wake the weary travelers. 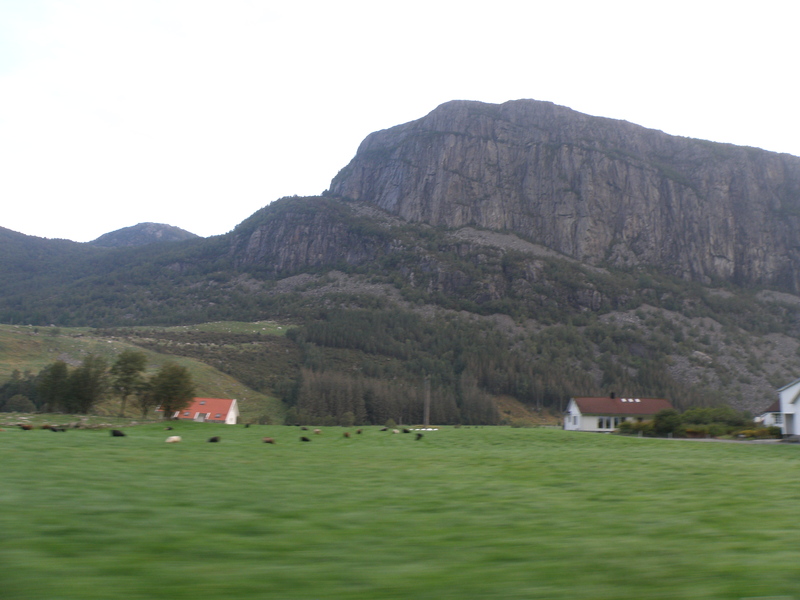 The sun was shining when we made the approach to Aerøskøbing, the town where we would disembark. 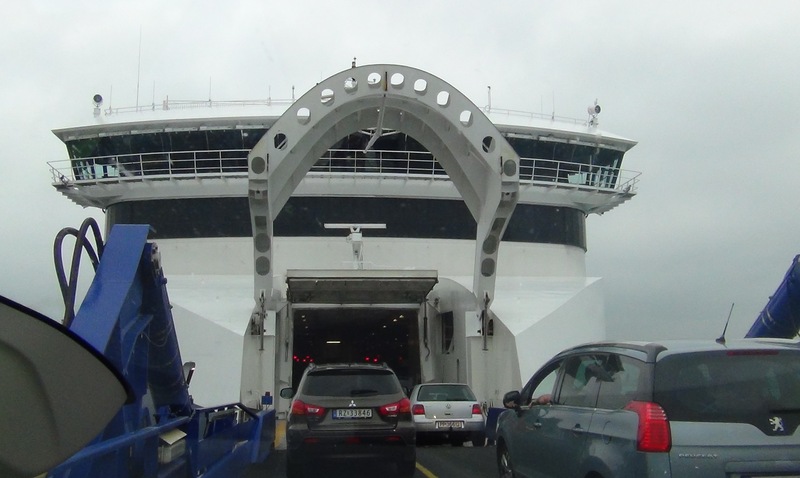 Here is what the ferry looked like, looking back to it after it had spit us out. 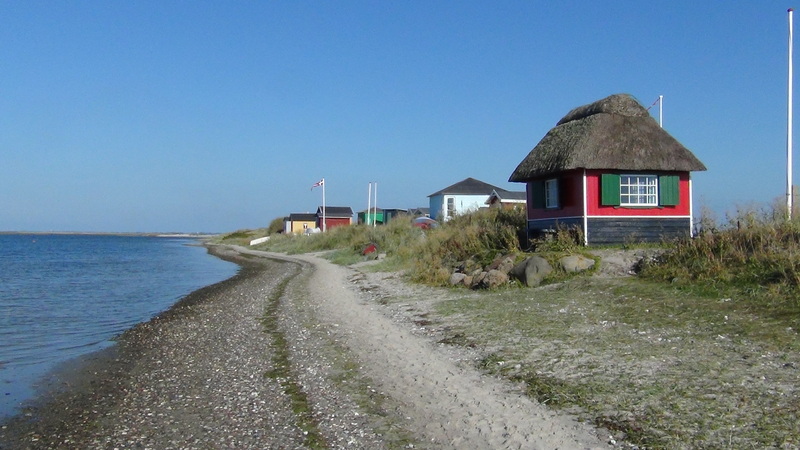 Why would someone wake up before the sun to travel to the island of Aerø, you ask yourself? One reason is because it is a town lost in time. The time period would be the 18th century. 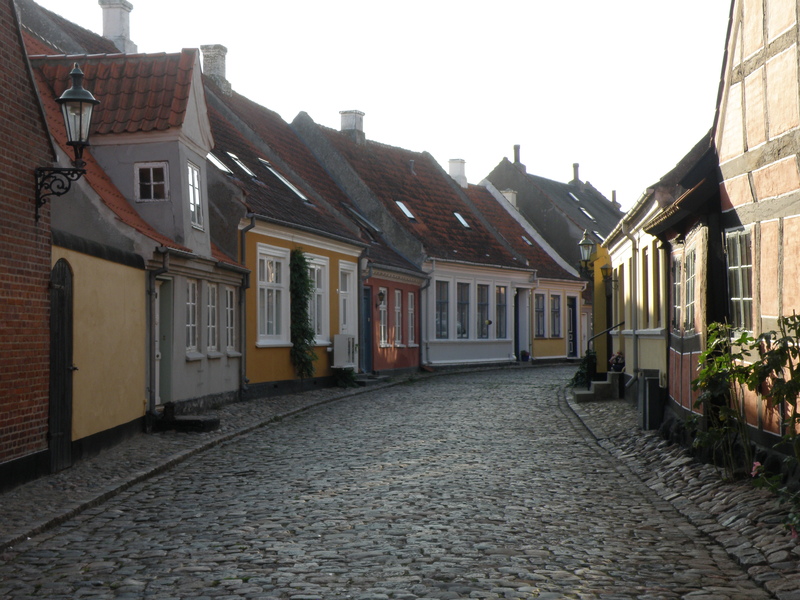 The houses are painted in bright colors and are built on foundations of stone. 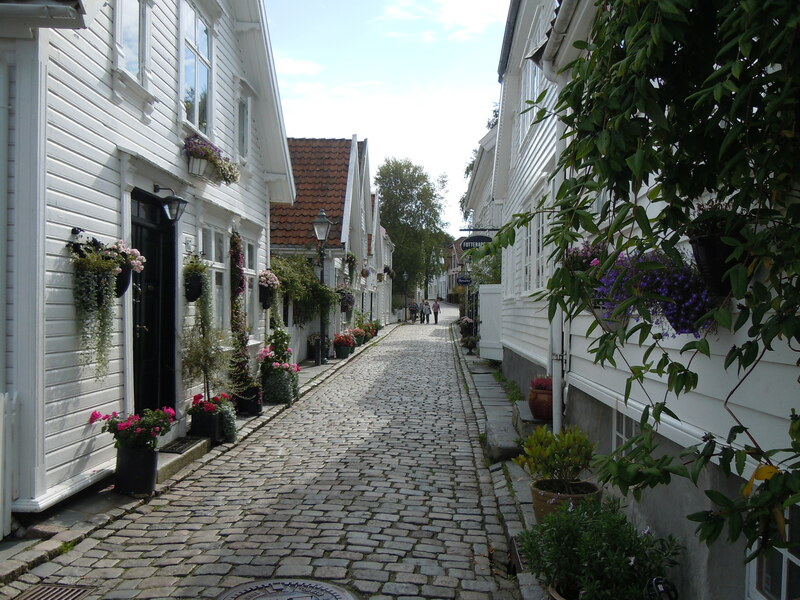 The streets are cobblestone. And walking these streets really gives you a feeling of having been transported back in time. 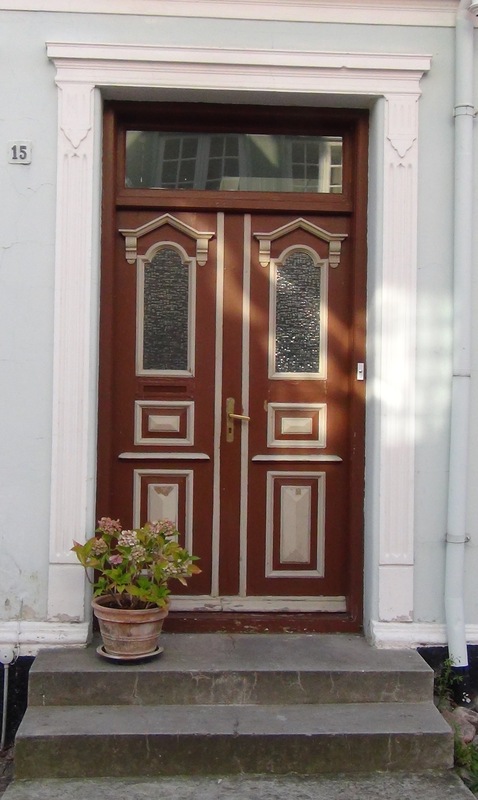 One very distinctive feature of this charming town is the different door styles. 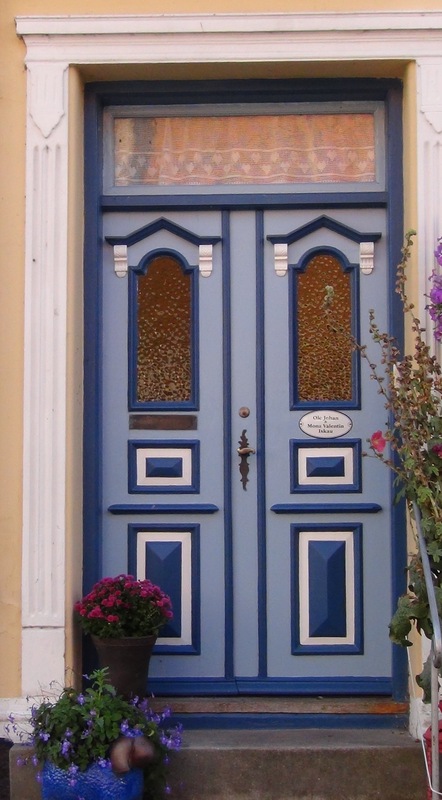 Almost all of them are different, painted bright colors with nice trim and often an interesting door-knocker. 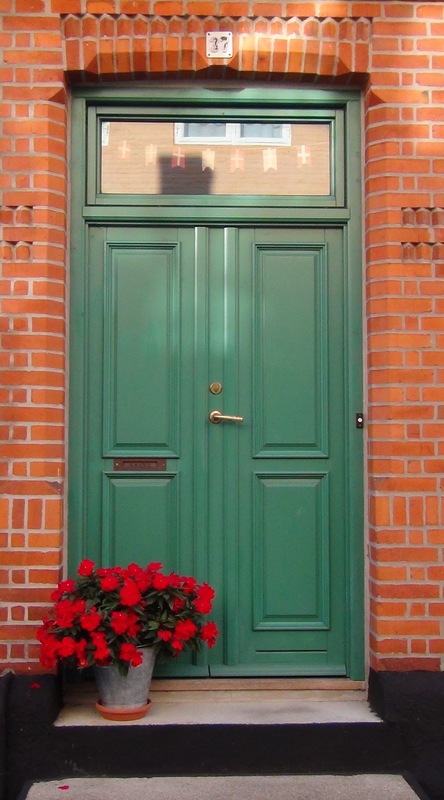 Doorways are adorned with fresh flowers, vines and lanterns (with real candles). 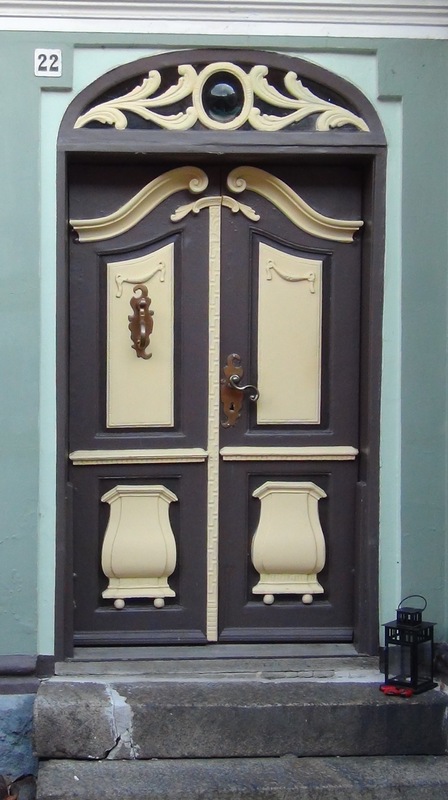 This is just a small example of the many interesting doors. 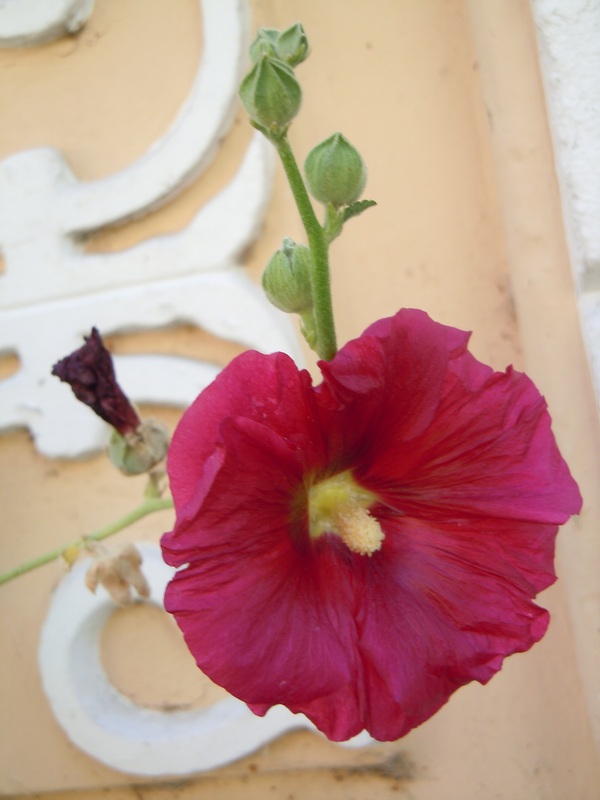 Another beautiful and distinctive feature in Aerøskøbing is that many of the homes in the old section are growing Hollyhocks along the house next to the street. 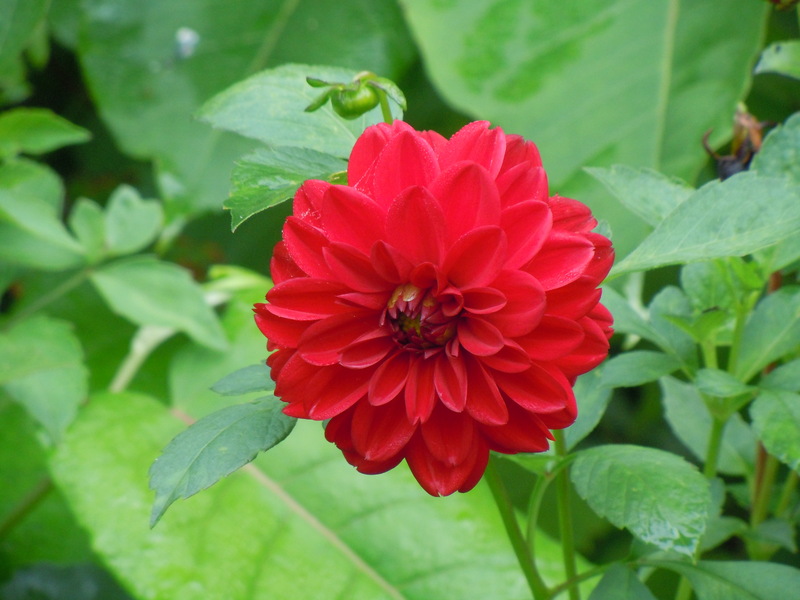 The main blooming season for them is June, but we were very fortunate to find some that had not finished blooming yet. We could only imagine how stunning it must look when the flowers are all in bloom. It is always nice to have a reason to return another time. 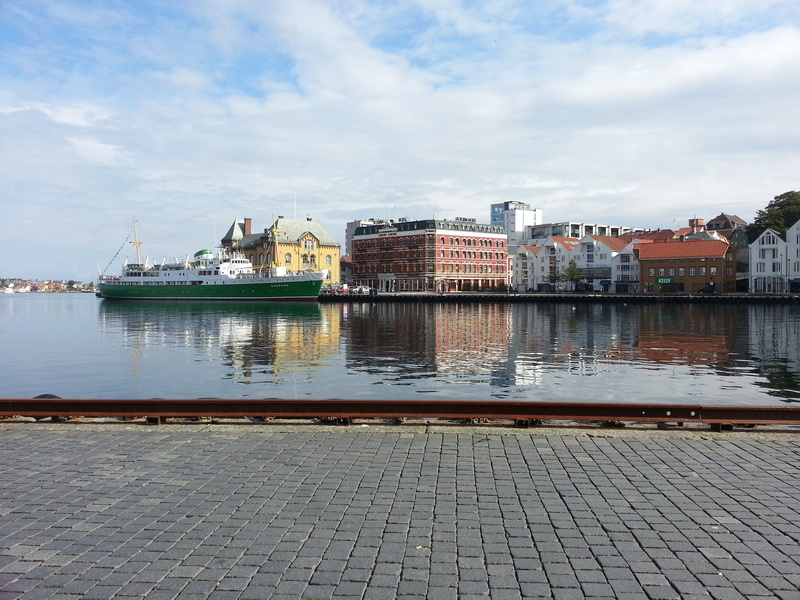 We walked around the town, did a little window shopping (as it was still too early for the shops to open), took a self-guided tour through the old town church, and then walked back toward the water. 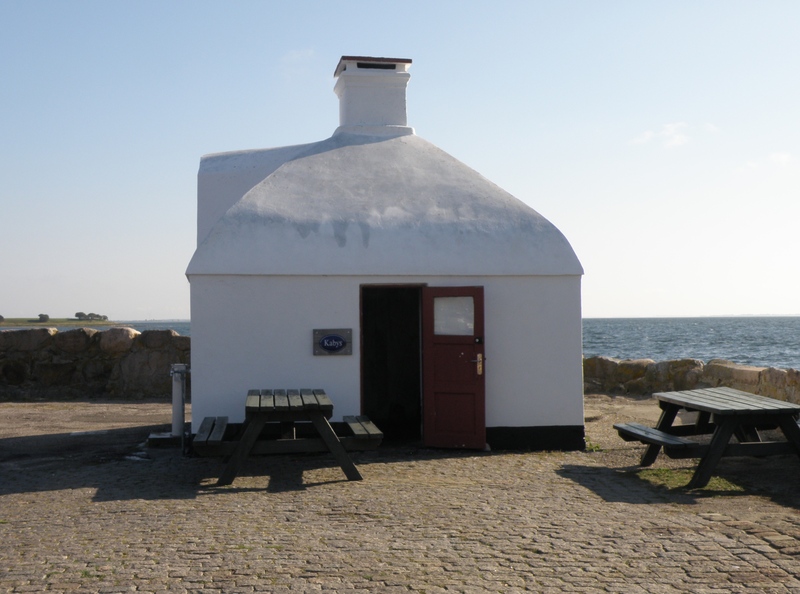 This small, whitewashed building is from 1810 and is called “Kabys” (cook house), an old smoke kitchen used by sailors when they came ashore. Up until the middle of the 19th century it was forbidden to cook over an open fire on a ship moored in the harbor. The danger of fire on wooden ships was simply too great so this town cook house was built to serve as the harbor cooking facility. 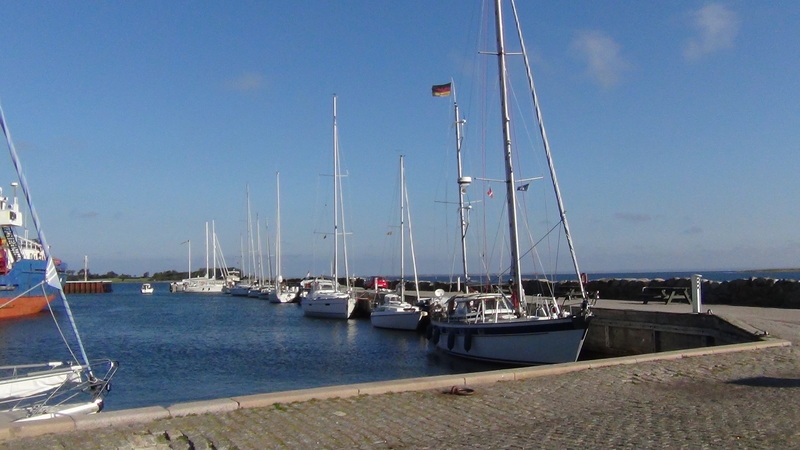 It was restored in 2001 and is still used today by yachtsmen who come ashore to prepare food. The Yachtsmen (mainly from Germany). Along the way Jennifer was inspired by the reflection of the group in the old, wobbly glass pane and after a few failed attempts finally managed to get a selfie of the group. Can’t find us? OK, then here is a cropped version to help you find us. Now can you see us? Probably the most ridiculous selfie of the trip…but that remains to be seen. 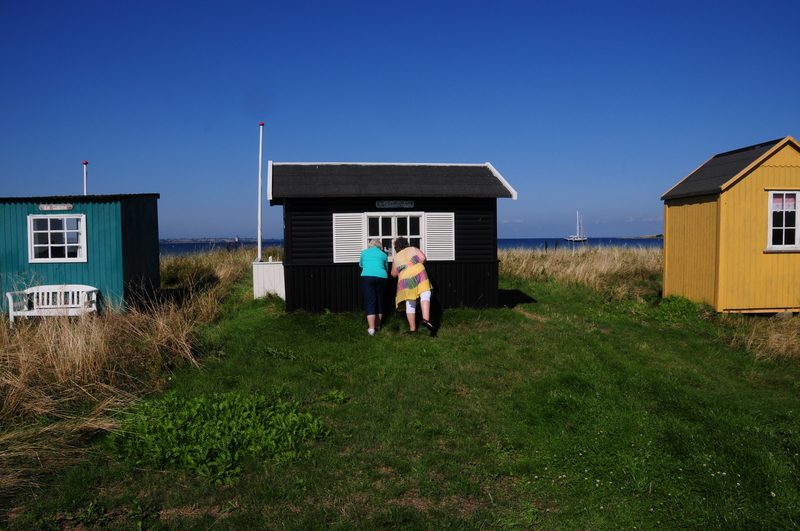 Yet another unique thing on this island is the beach huts. They are handed down from generation to generation, so some of them have been in the family for many decades. It is really difficult to buy one, because all family members would have to refuse it, and we imagine that to be a very rare occurrence. If one were to become available for purchase, we were told that it would be in the six-figure price range and even so a long waiting list. 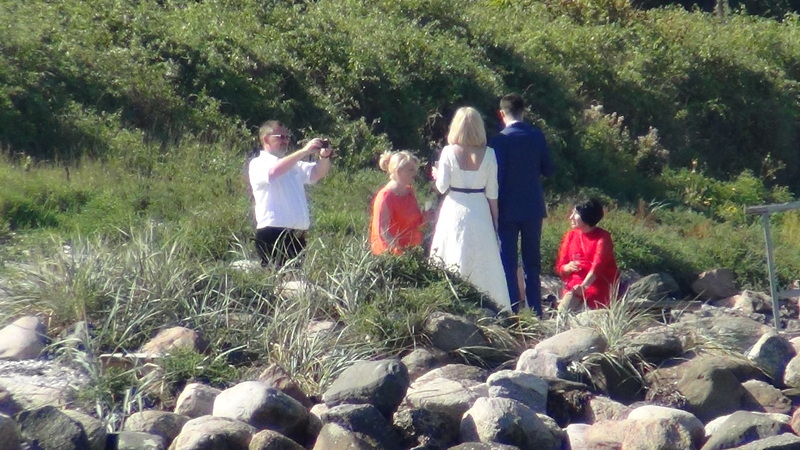 It was indeed a lovely day, and lovely setting, for a beach wedding. 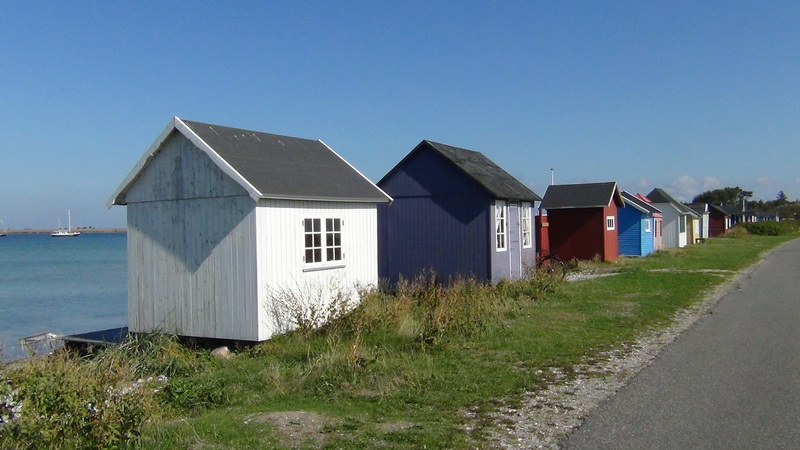 When the beach huts are viewed from the beach, we can see that many of them have a nice deck and even some storage sheds built into the back of the hut. Some of the beach hutters were actually at ‘home’. The girls could not resist peeking in the windows of some of the huts whose residents were not there. The boys pretended not to see us, but this photo is proof that at least one of them was keeping an eye on us. 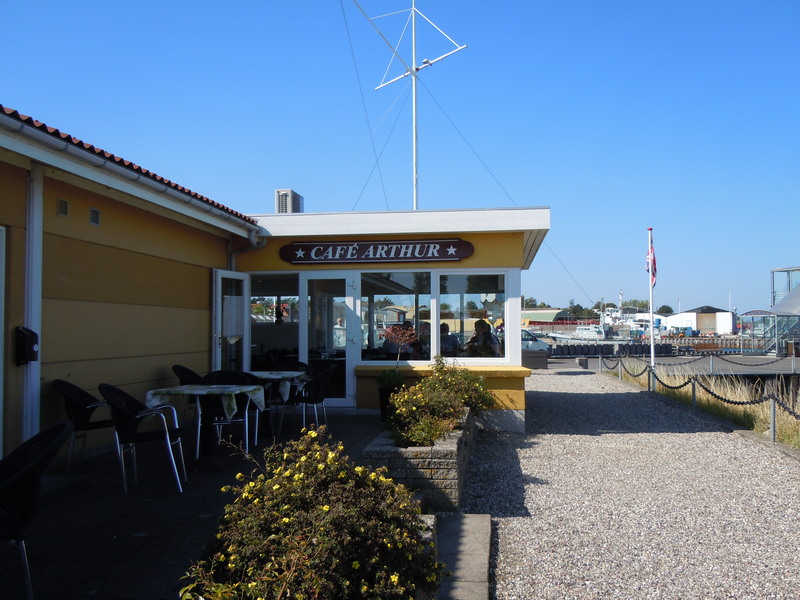 The gang was hungry since we hadn’t eaten since the ferry, so we stopped at Café Arthur in the port town of Søby. The café is right at the water’s edge with the marina just in front. 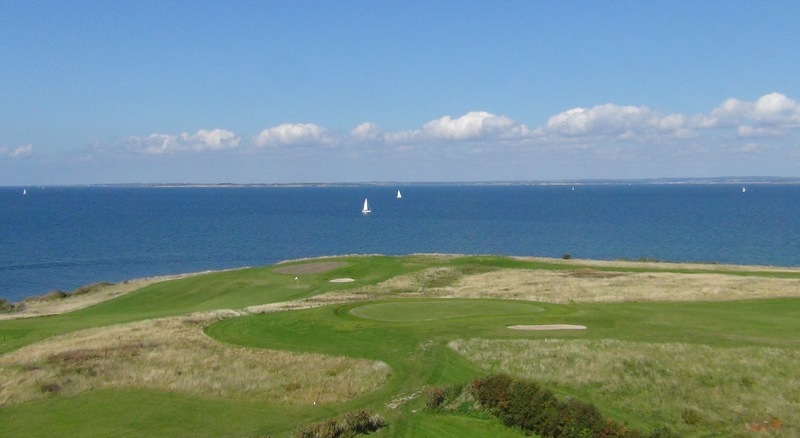 No doubt that we are still in Denmark! All of our lunches looked very nice, but Tim’s monster burger and fries were the most photo-worthy. We used Jennifer’s hand to give perspective to the size of that sandwich. 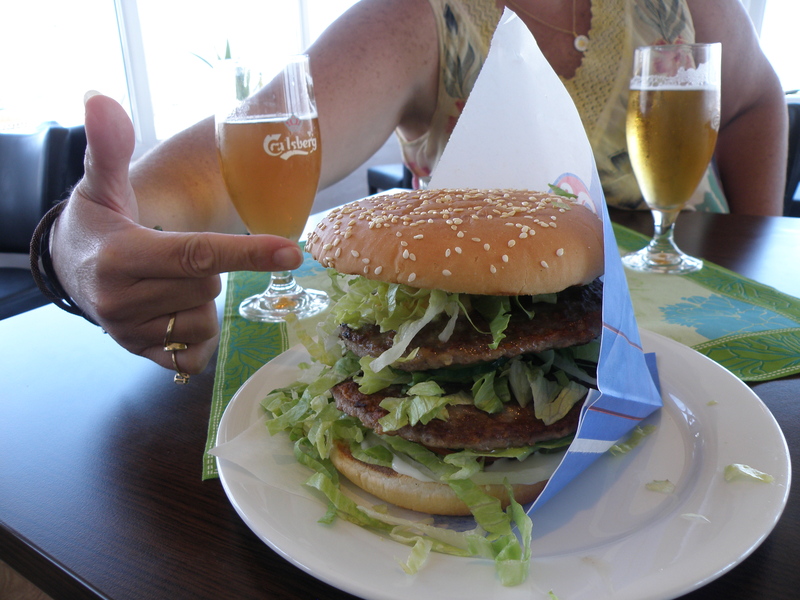 The Americans may be maligned at times because of their portion sizes, but we did get some huge burgers in Scandinavia! 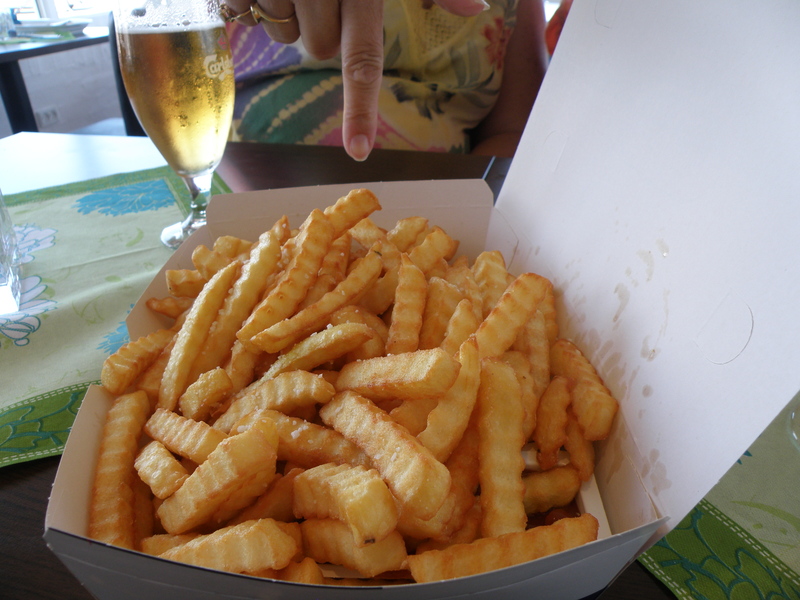 The fries were served with ketchup, but it was squirted on the bottom of the container and then covered with the fries. 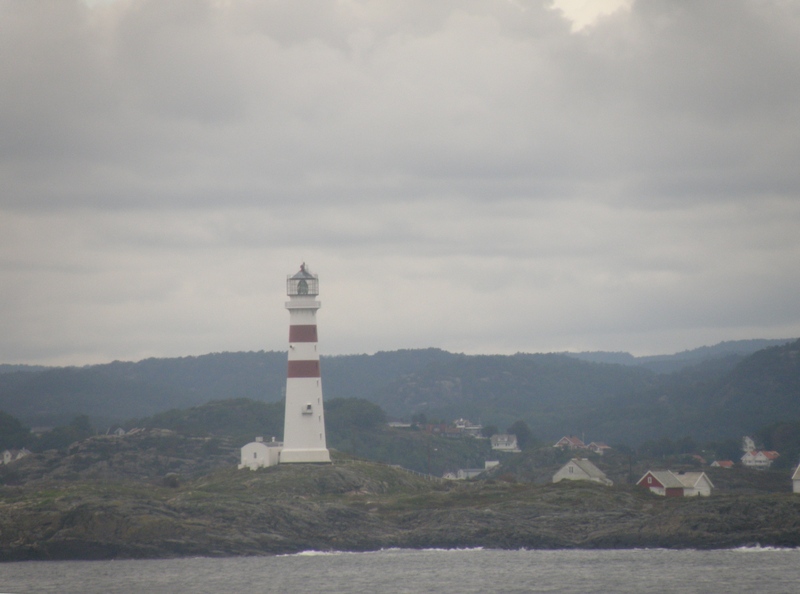 Our next stop was at the Skjoldnæs Lighthouse. 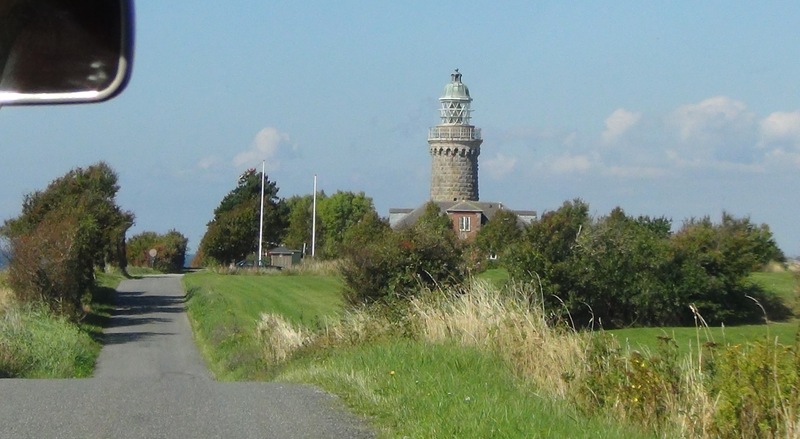 The lighthouse was built in 1881 by Swedish stone-masons – some of whose descendants still live on the island. 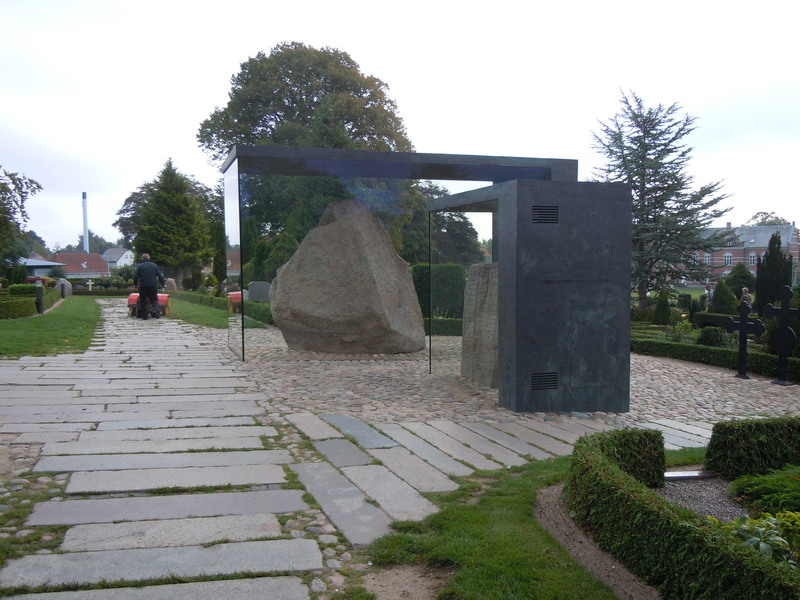 It is built of very finely cut granite stones from the Danish island of Bornholm. 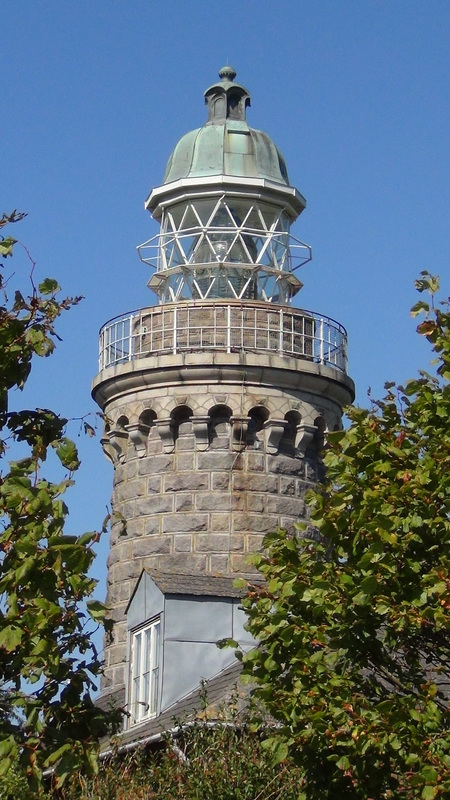 The light tower stands 32 meters above sea level. 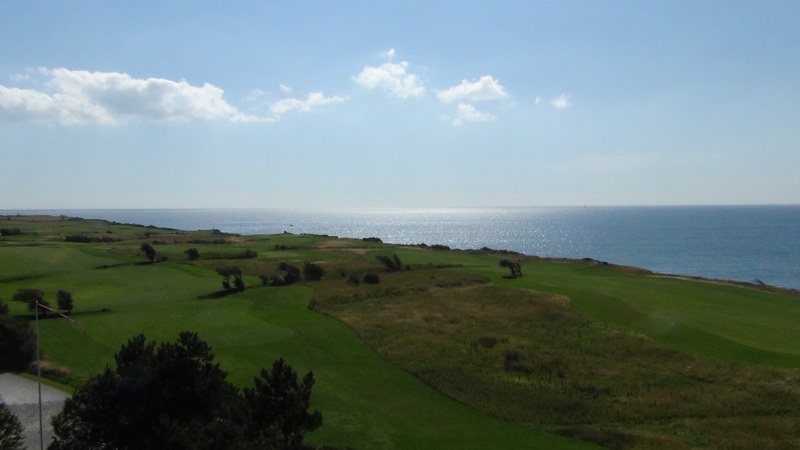 In 2006 a golf course was built around the lighthouse and the house is now the golf club. 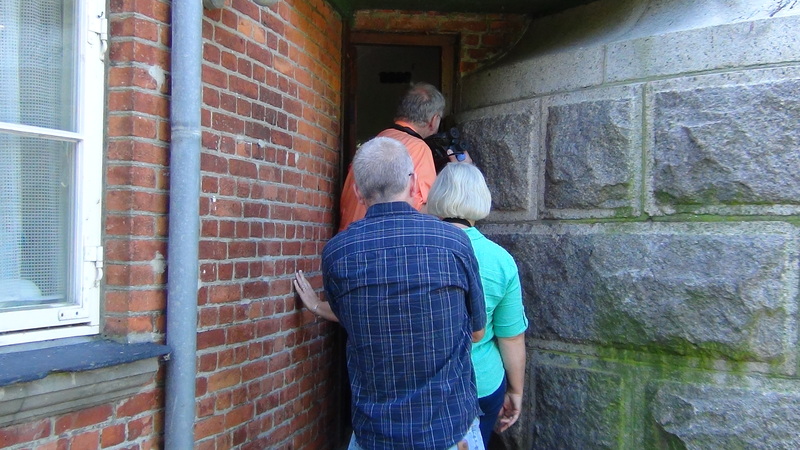 Since the tower was open (for a small fee) we passed through the very narrow door into the tower. 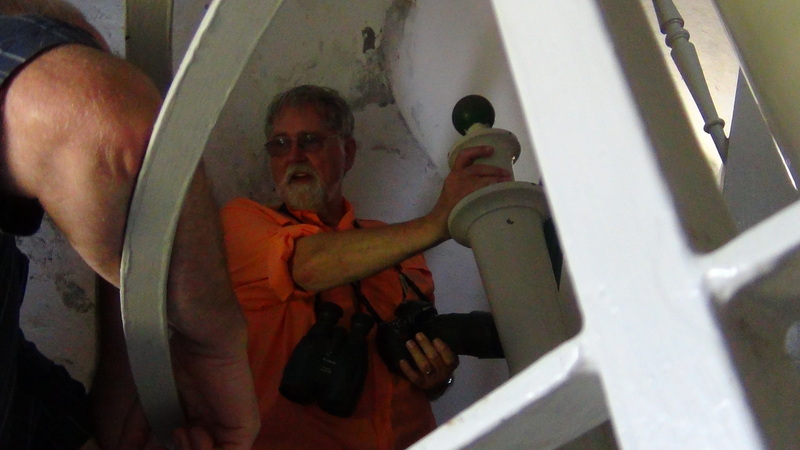 Steen led the way up the narrow spiral staircase, occasionally stopping to tell stories (and maybe to catch some breaths too). 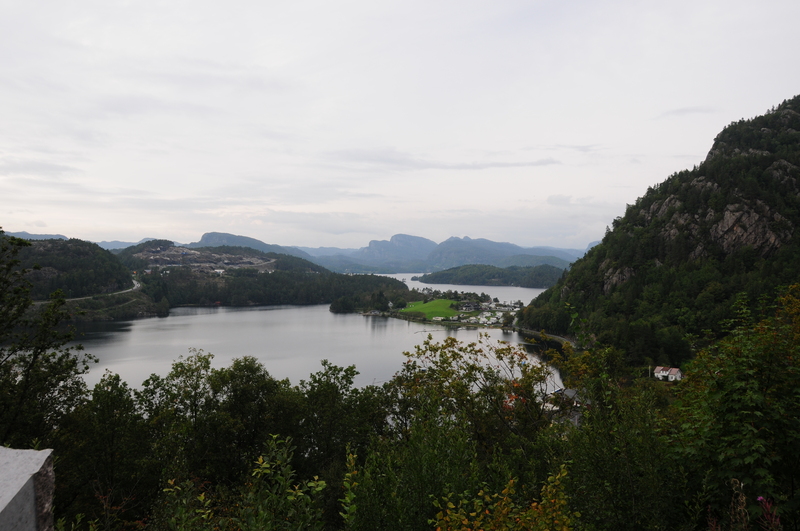 The climb to the top was worth it once we looked out over the spectacular view, surrounded on 3 sides by water. We all did our best to ruin the view. 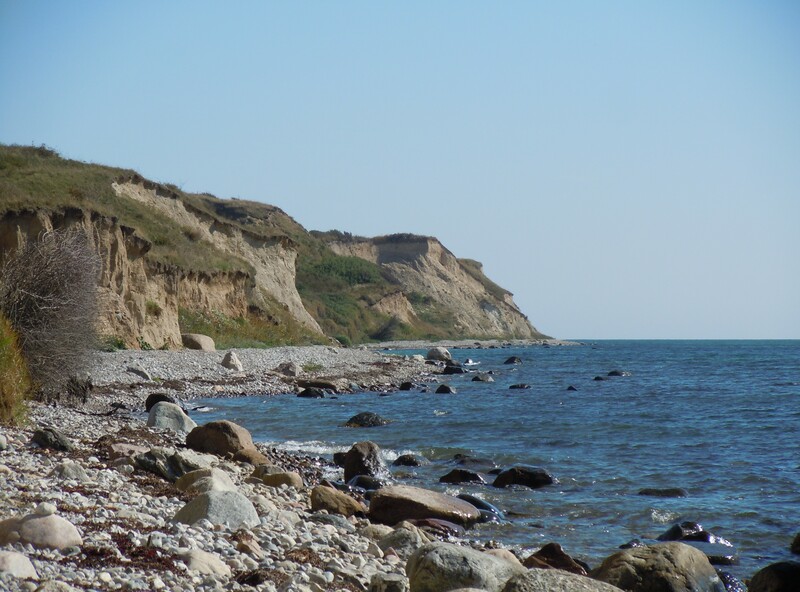 The next stop on the tour came highly recommended as one of the most beautiful places on Aerø, Voderup Klint (klint = cliff). The view from above is amazing. 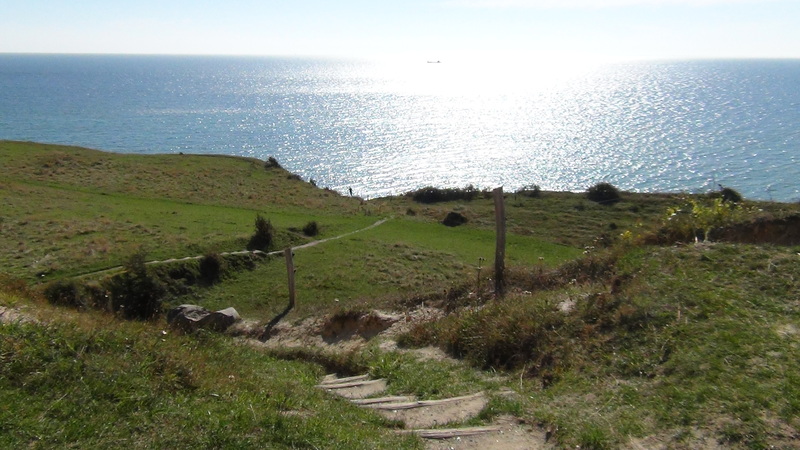 Then a fairly steep walk down dirt path and steps took us to the water’s edge. 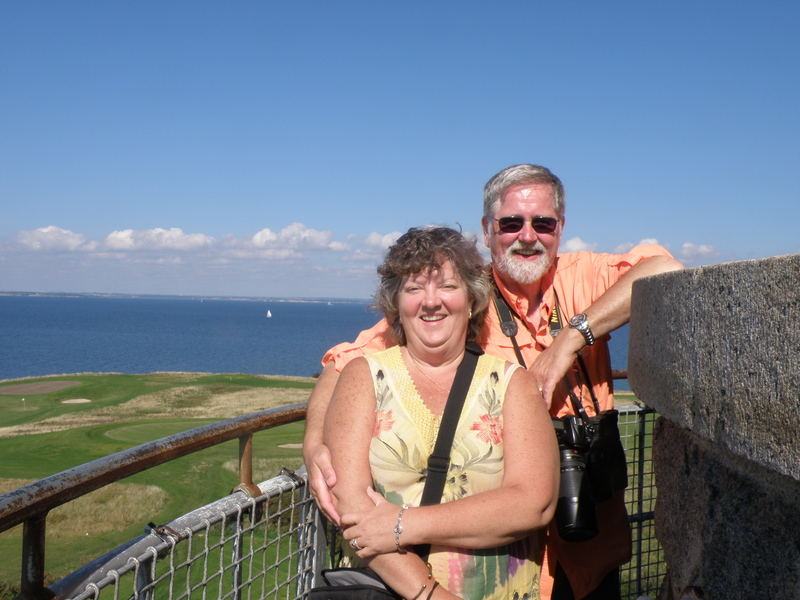 Here is our water’s edge selfie, as well as a view of the cliffs to the other side. We wanted a selfie from the top of the hill which showed how high up we were (or how far down it was to the water). 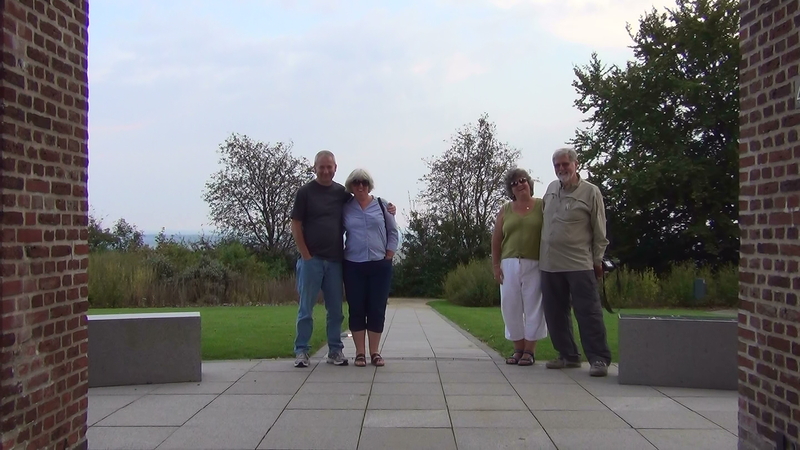 We asked some nice people sitting at one of the picnic tables to take the photo (first one). 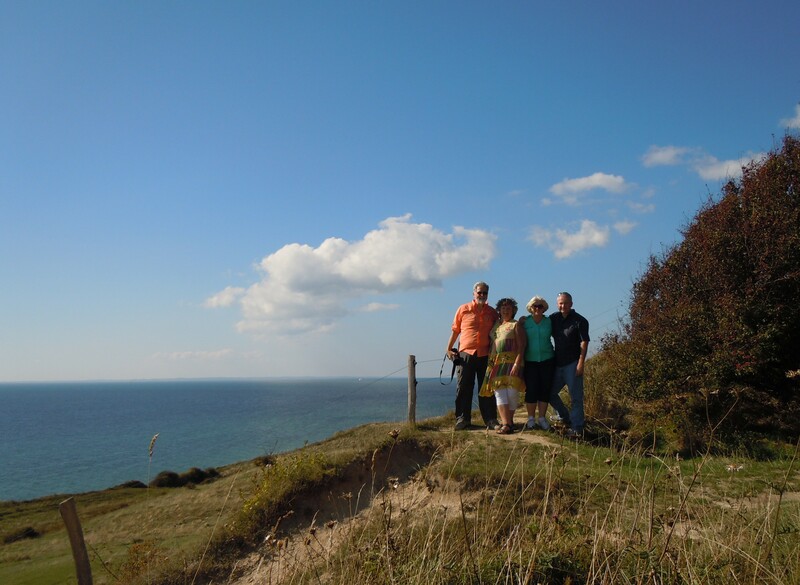 It’s a nice photo, but we weren’t completely satisfied that it showed how far down it was to the sea. The second one is our own attempt using the self-timer. Not sure either one really captured what we were going for, but we now have some nice photos of our little group in this beautiful place. Then something unusual happened. 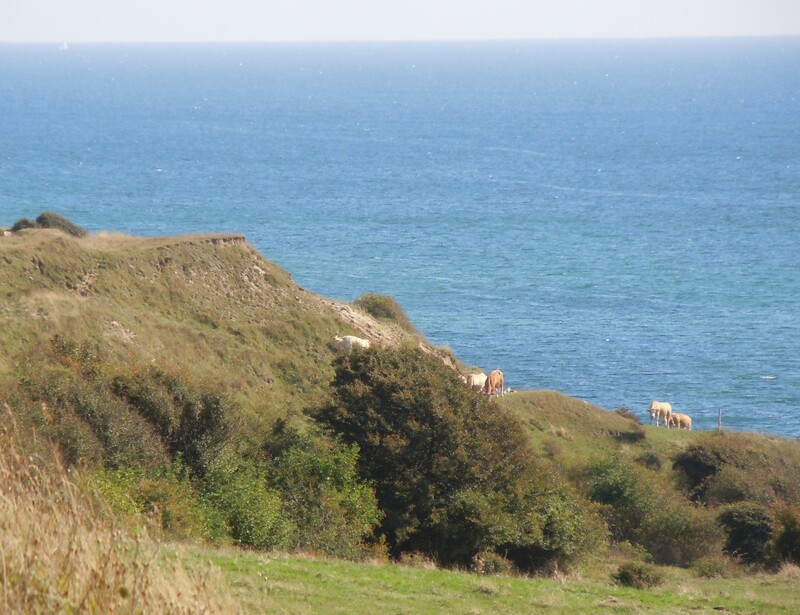 Someone pointed out that there were cows on the hillside, on what seemed to be the top of the cliffs. Then more and more cows came over the hill. None of us had ever seen cows climbing such a hill, and with the glistening water in the background, it was really amazing to see. We made a brief historical stop at the ancient ruins of Saint Albert’s church. 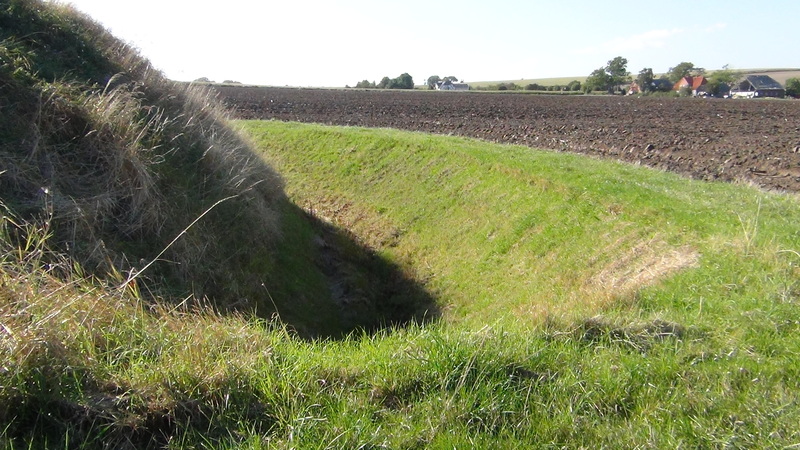 This is the remains of an old defense tower with a ditch from around 1250. Later in the 1300s a church was built in the same place, but this also fell to ruins, and only by studying an old map (from the 1600s) did archeologists find that there might be remains – previously unknown until excavations in the 1970s. Now the walls are marked by low earth walls and the ditch and the inner earth wall are reconstructed. 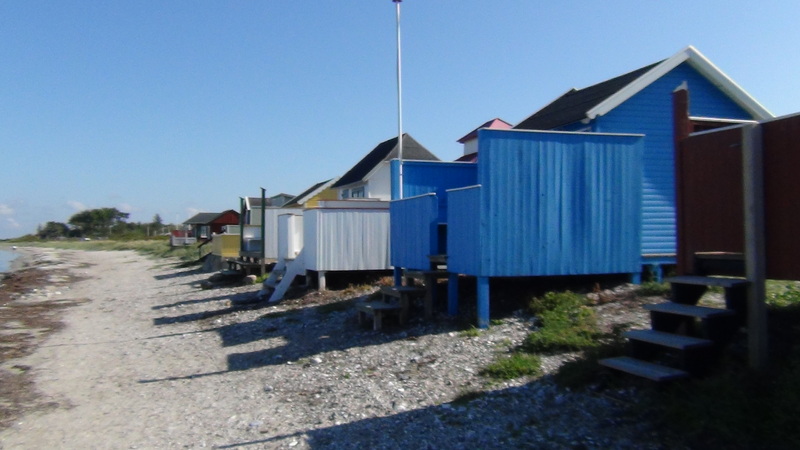 There are more beach huts in another port town (Marstal) which we paid a short visit to. 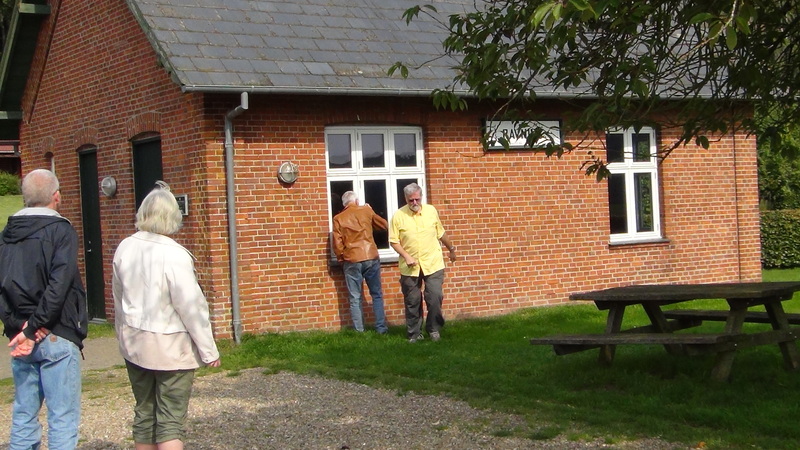 In this group there is one (foreground) with a thatched roof. 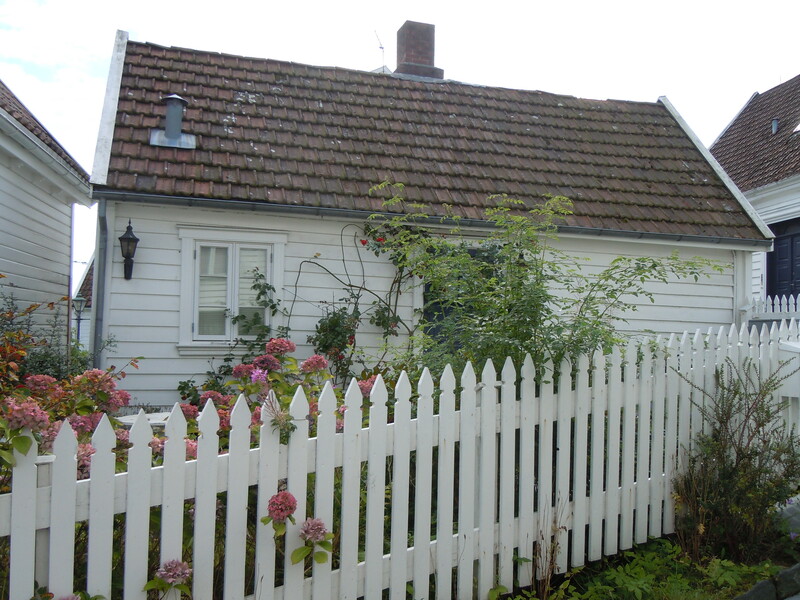 This is the only hut with this type of traditional Danish roof. Jennifer liked this location better than the others, as they had water on both sides. There were actually a couple of people swimming, but we could imagine the water was rather cold. 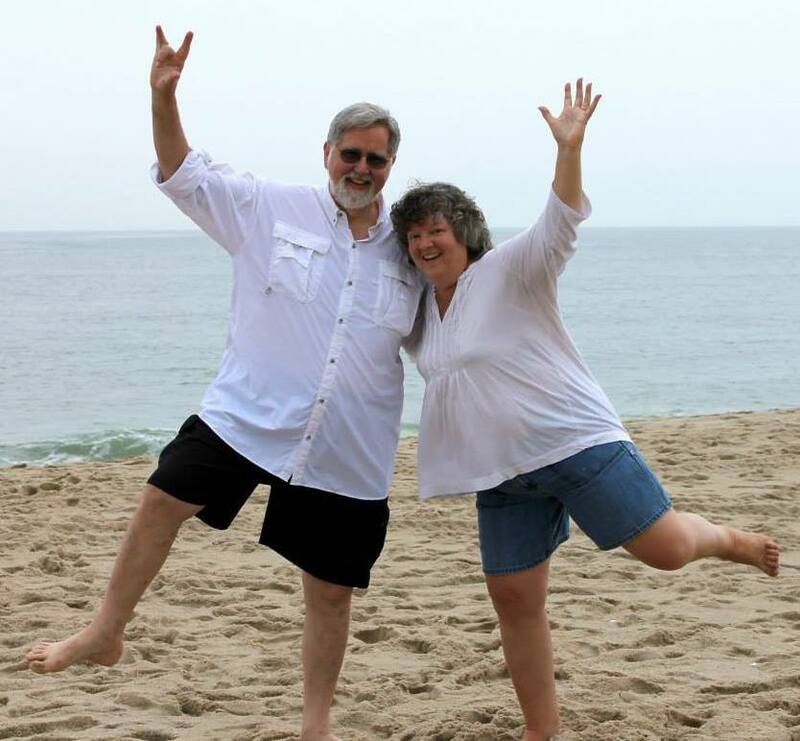 Jennifer did manage to dip her toes but Steen warned her to watch out for the stinging jellyfish which were all along the shoreline, and some were washed up on the beach. After a long day filled with many beautiful things, it was now time to fill our bellies. 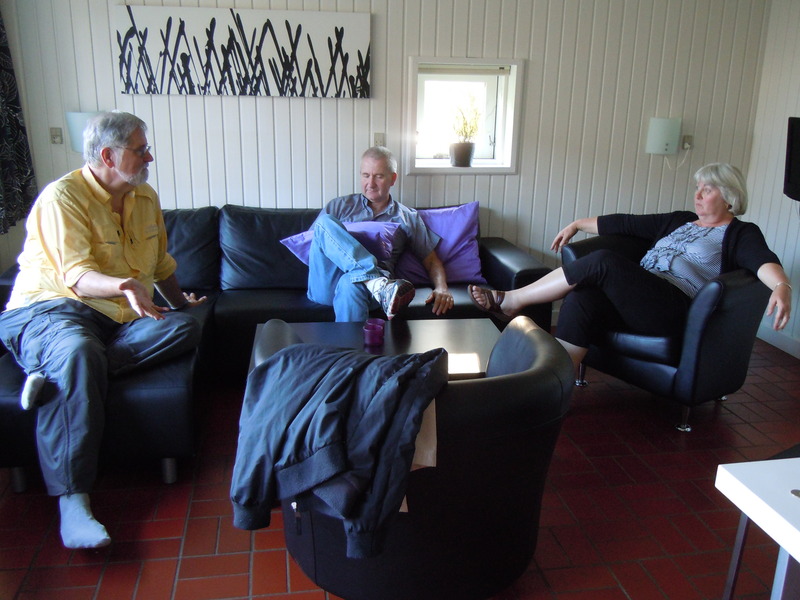 We returned to the town of Aerøskøbing and had dinner at the Hotel Aerøhus where Jennifer and Steen stayed over last year when they visited Aerø. 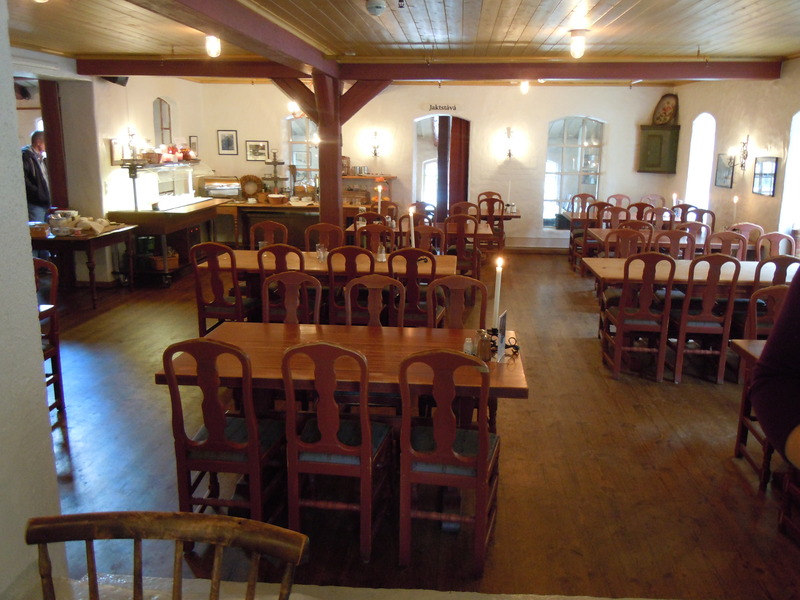 The restaurant was very busy so the service was a bit slow, but the food was very good. 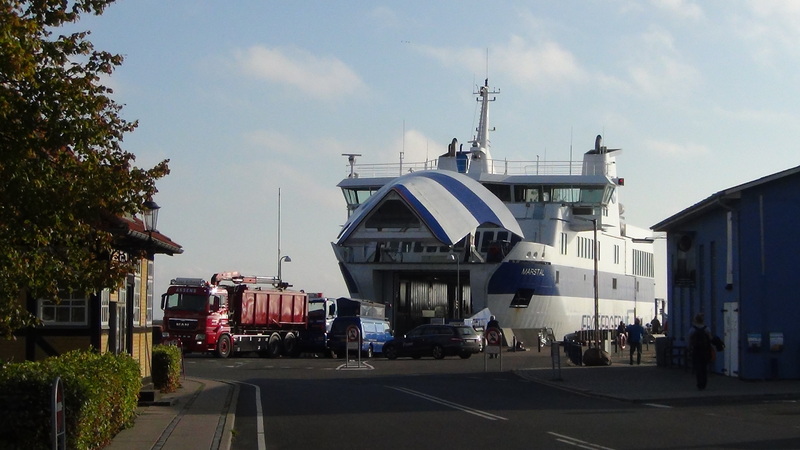 We managed to be in the queue for the 20:00 ferry to return to the mainland and to our “vacation city” in Middelfart. We need to rest up for another big day tomorrow. 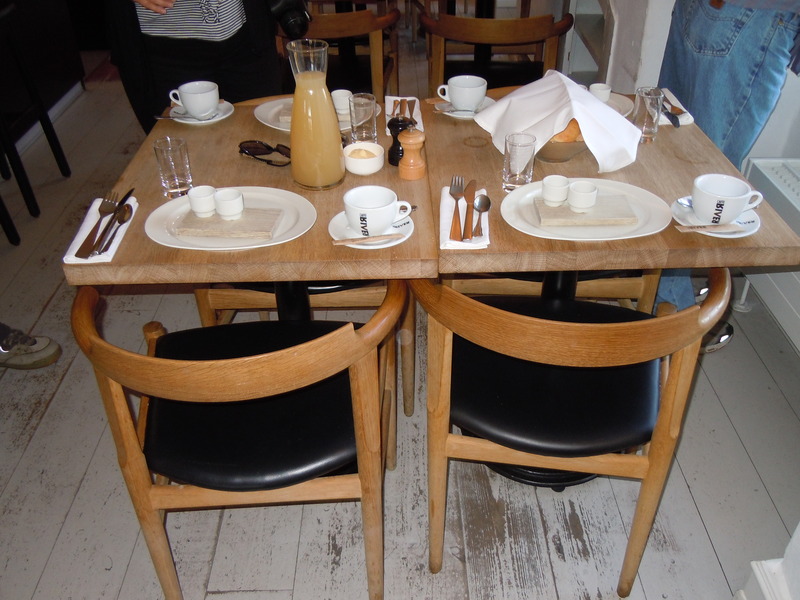 After getting an early wake-up call, so that we could see and do many interesting things and also squeeze in travel time to our next destination, we found a breakfast table in the same restaurant where we had dinner. 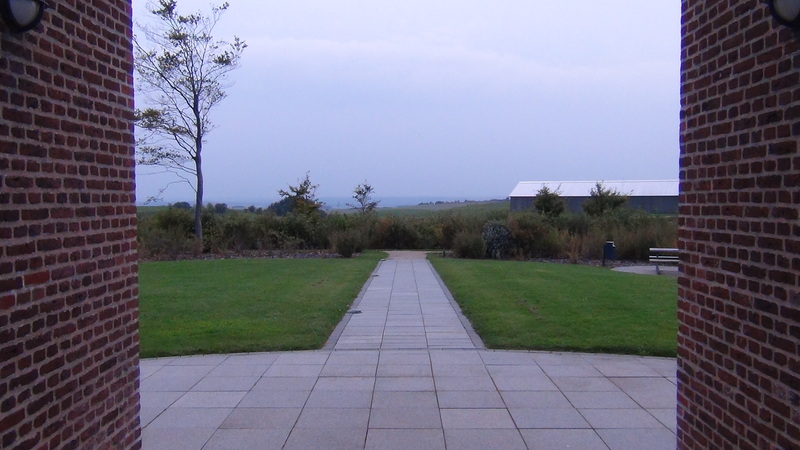 This morning we had a lovely view out to the kitchen garden. Despite the lovely setting, Steen would come to refer to this breakfast as “a complete disaster”. Besides the fruit juice, we were uncertain what to do, as there were small cups with powdery, flaky stuff and nothing more. There was no server in the dining room (only a few other patrons). 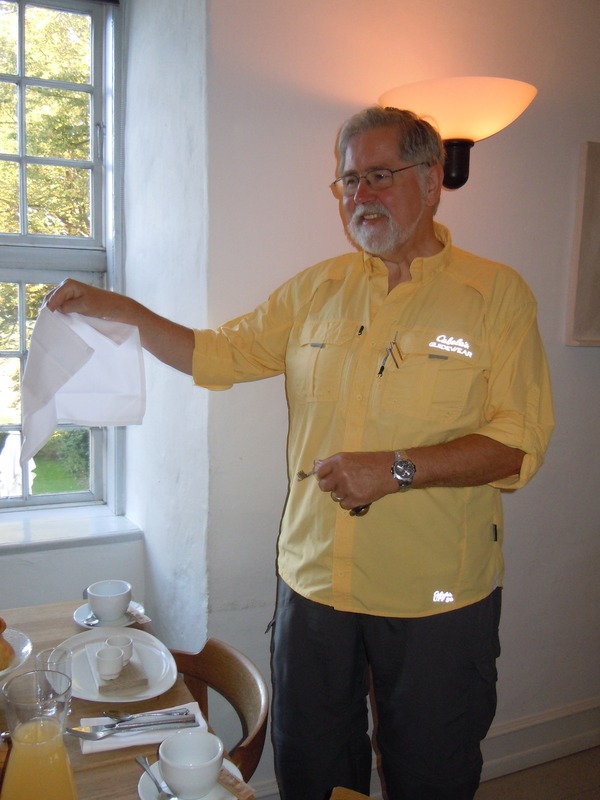 Steen, being used to the European style of breakfast, saved the day by removing a white napkin from a basket which we found held some lovely breakfast breads. Very soon after, our server came with a small jar of white yogurt (?) which is what the powdery content of the small cups was to be mixed in, and also a plate with meat and cheese. There were exactly 2 pieces of everything, no more and no less. Steen found this to be very odd, and thus labeled this breakfast “a complete disaster”. Read on, we will have better breakfasts later. 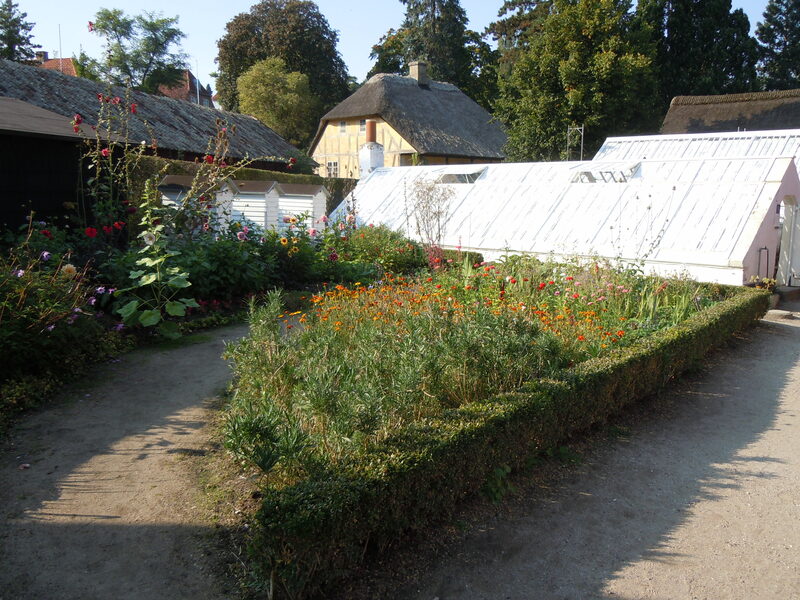 This is our view to the kitchen garden where they grow herbs and flowers that they use in their dishes. 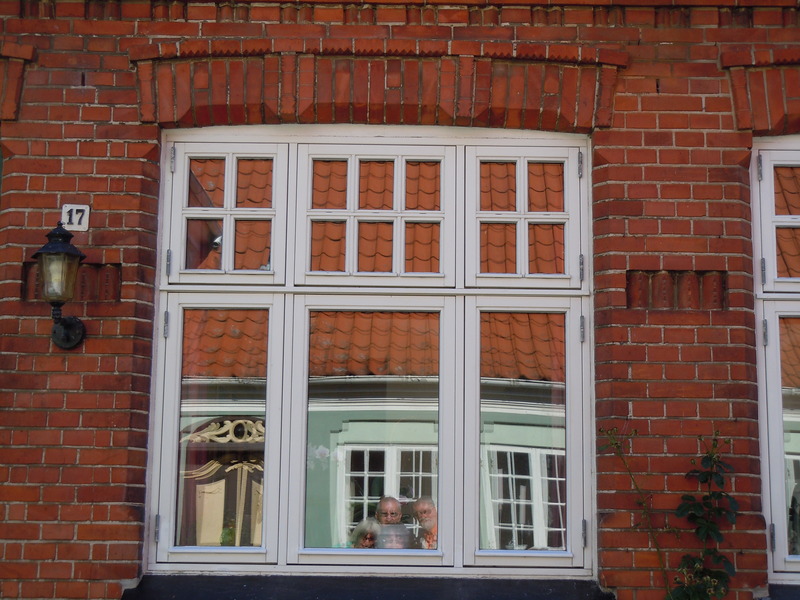 Before our final trip down the wobbly stairs, we needed to stop to pay our respects to the girl in the wall so that she doesn’t haunt us the next time we stay at Dragsholm. 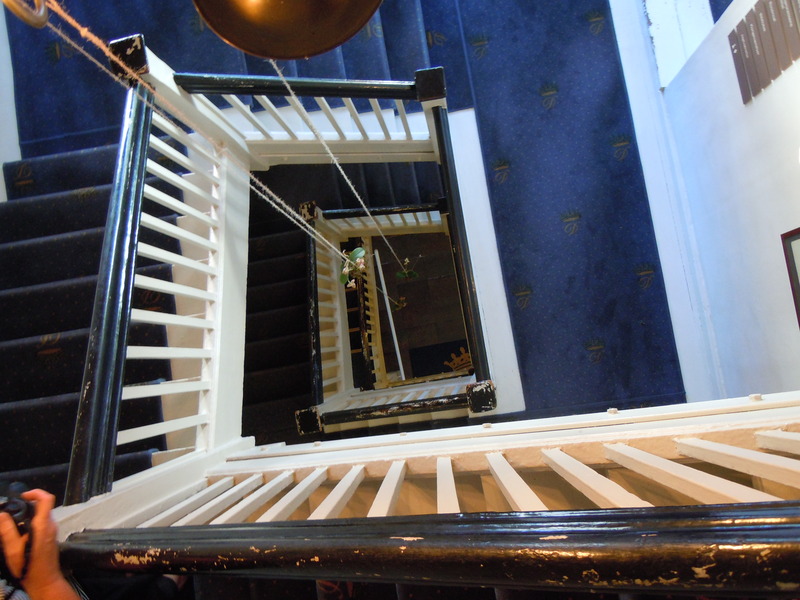 Our rooms were on the top floor of the castle (3 flights from ground floor) and the steps were crooked and oddly spaced. We had to make several trips up and down these stairs, as the restaurant was on the second floor, and to get out of the castle into the courtyard you had to go to the first (ground) floor. 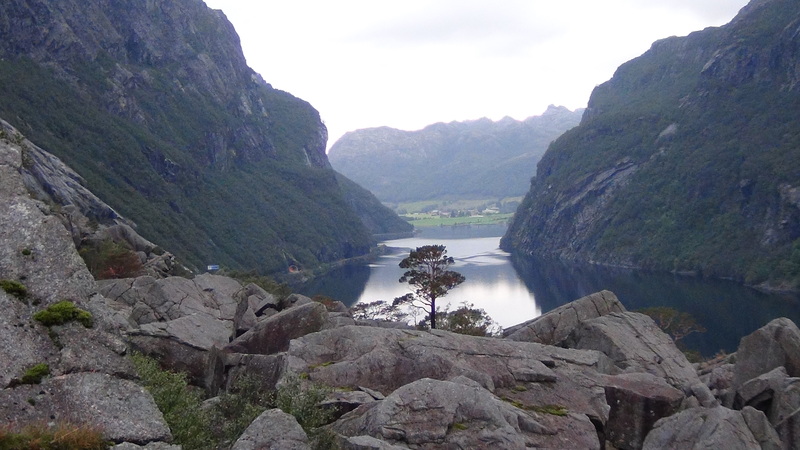 Even though we kept most of our luggage in the car and just packed overnight bags for the one night stay, we still managed to have to make a couple of trips up and down. The extra exercise made up for all the delicious food we ate last night (and wine) and, well, breakfast. 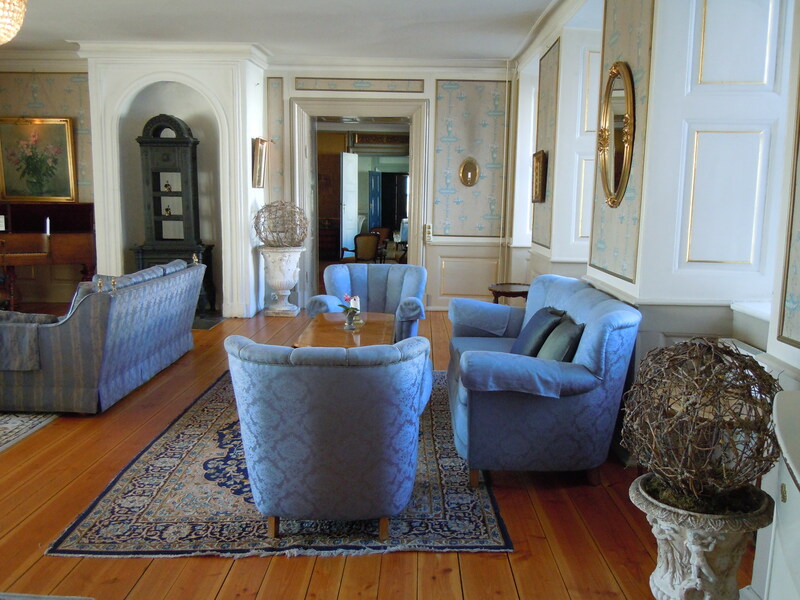 Before we could leave Dragsholm, we took a walk through the castle rooms. 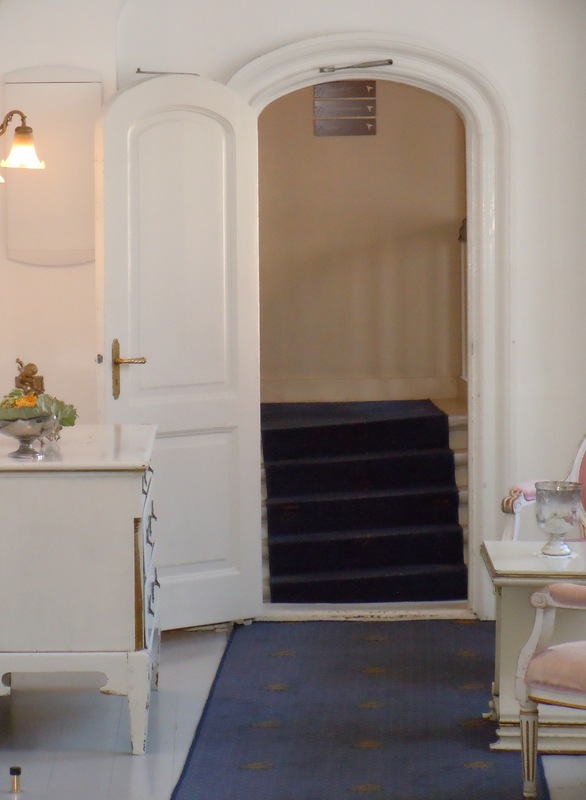 Each room was uniquely decorated and had a special charm of its own. Here are just a few of our favorites. We also wanted to take a quick tour around the grounds of the castle since we had not managed that the evening before. 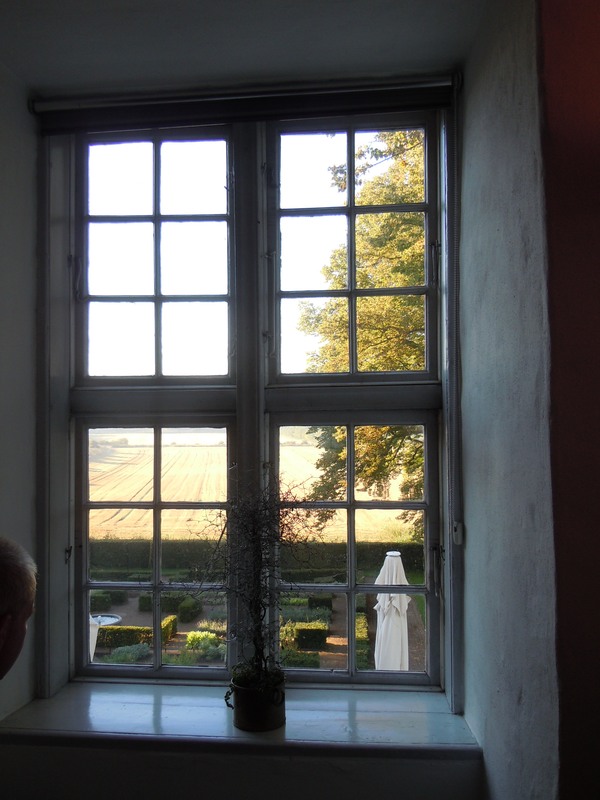 We strolled through the kitchen garden, and then walked around the side to where Amy and Tim had the view from their room. On the way we passed over the moat, and this was a beautiful reflection we caught. The buildings straight ahead are belonging to the castle but are not part of the main building. The white reflection on the left is the castle. When the castle is viewed from this side the tower is evident and we believe that this makes the castle look a bit more like a ‘traditional’ castle. 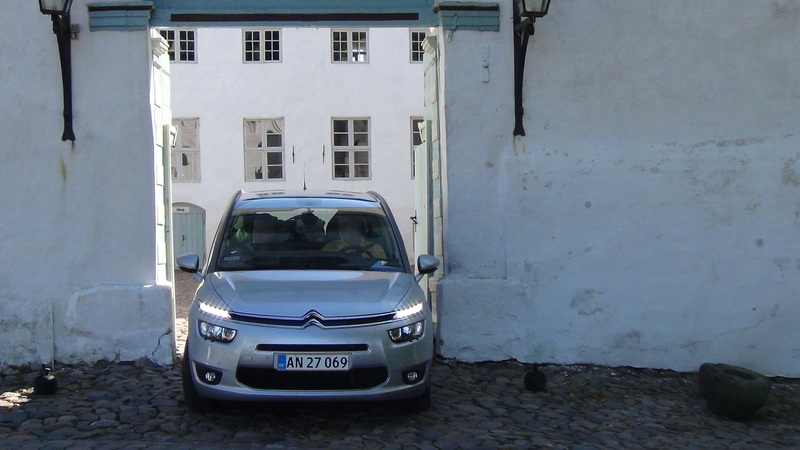 After packing the car, Steen finally managed to squeeze the car through the castle arch (coming from the courtyard) and we were on our way. 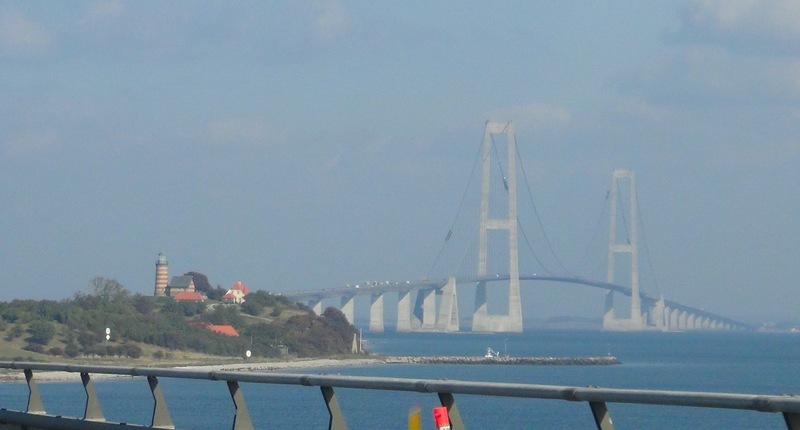 To pass from the island of Zealand to Funen we had to cross the 18 km long bridge called “Storebaeltsbroen” (Great Belt Bridge). This is actually a photo taken coming the opposite direction (on our return trip to Zealand) to show you what the bridge looks like. The photos taken of the bridge, while on the bridge, don’t say much. To pass the time driving over the long bridge, there were some nice things to look at: This pretty lighthouse to the left, and then the beer train on the right. We can’t label it the “Tuborg Train” because several Tuborg cars were followed by Carlsberg. It was a long train. Notice the windmill farm in the water behind the train. 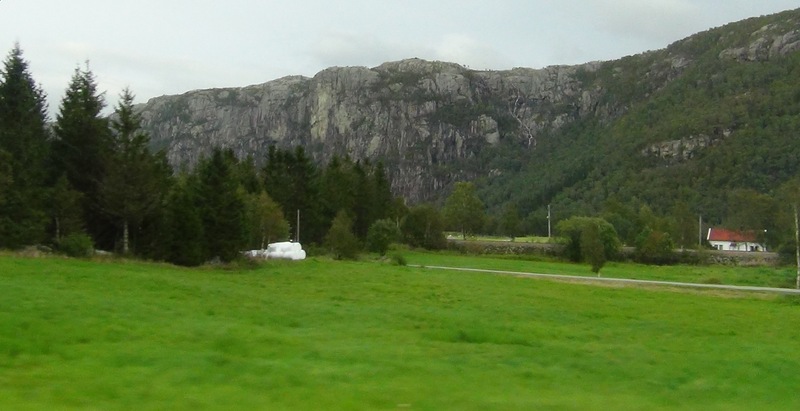 After driving for a bit in the beautiful Danish countryside we came upon some strange rock formations along the road. 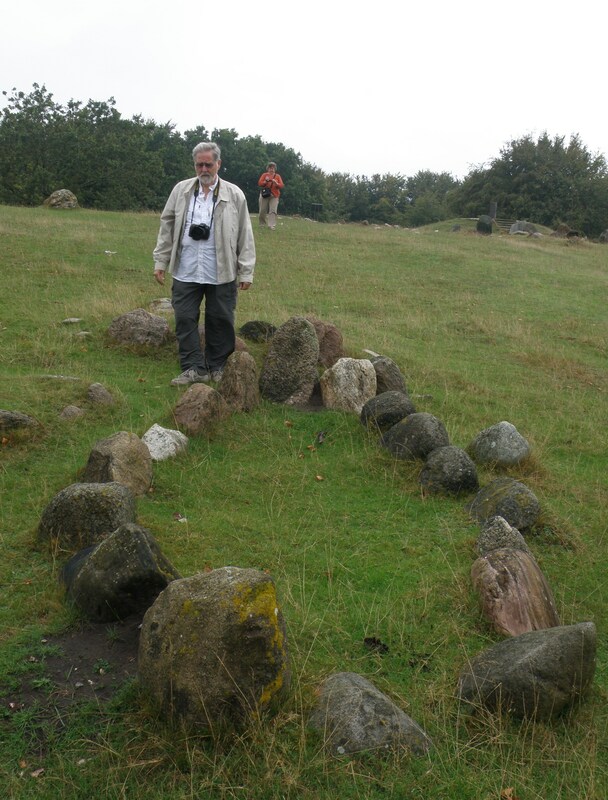 Steen explained that these were Stone Age burial chambers. We made a selfie next to one of them to give you the perspective of how large they are. 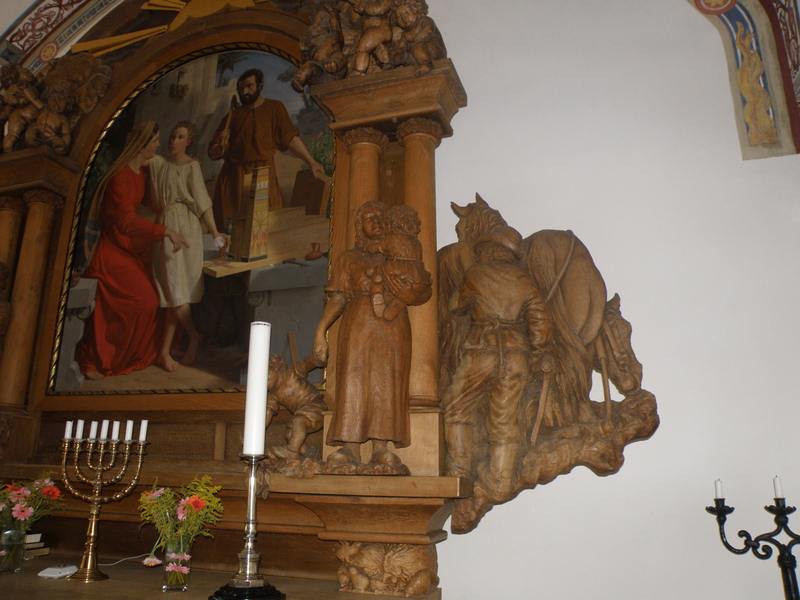 The next stop on the tour was the Nazareth church, where there are many wood carvings by the same man who carved some of the pieces of furniture in Steen and Jennifer’s home. The artist was a friend of Steen’s father, who was also an artist (painter), and the pieces in their home were commissioned by his father for different events (e.g. wedding, birthday, etc.). 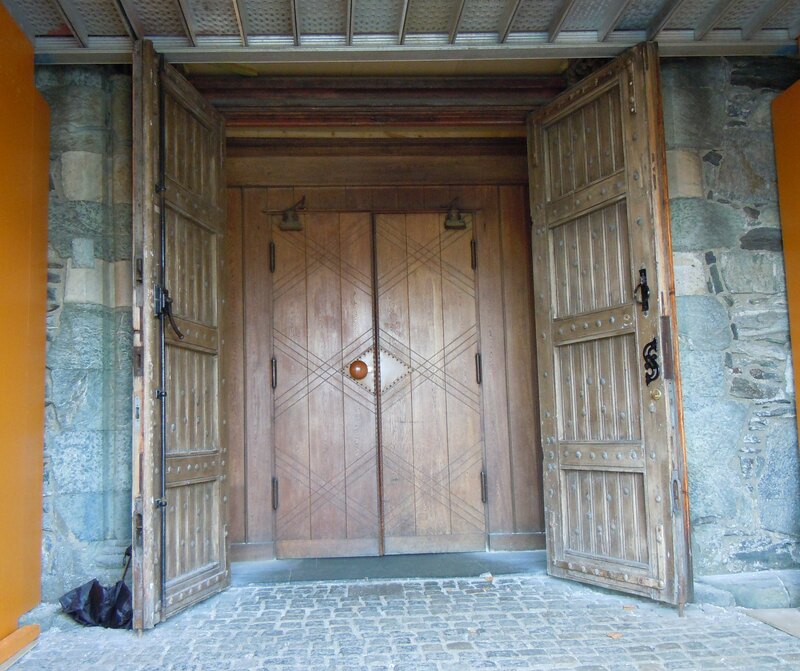 The church was locked, but Steen walked to the grocery store next door and was able to obtain the key. The first thing to really hit you when you walk in the church is the pulpit. 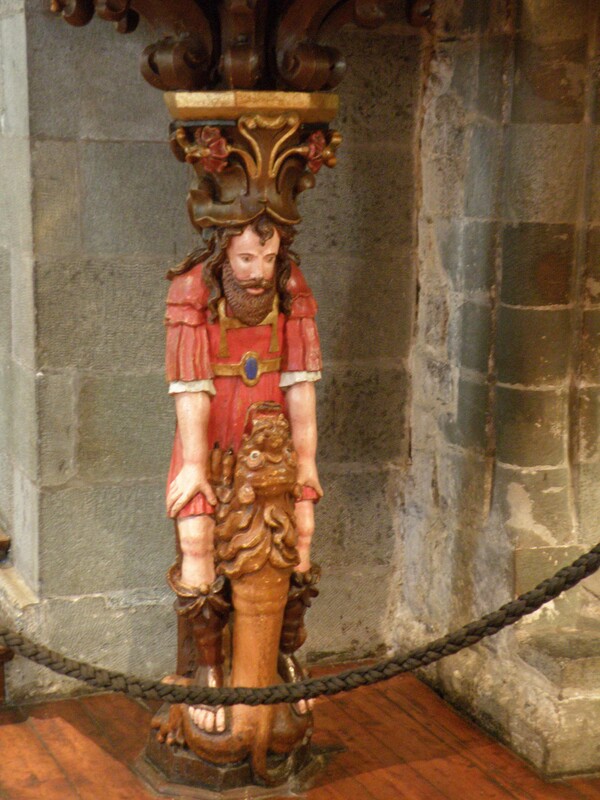 The entire pulpit was built by the wood carver and all of the detailed carvings are his. There are many cherubs, each holding a different musical instrument. Each panel tells a story from the bible with amazing detail. The iron work in the railing along the steps of the pulpit were made by a different man (an iron worker / artist) and if you look carefully, you can see a scene depicted where the son is at the feet of the father, and the second son is turning away (to the left). 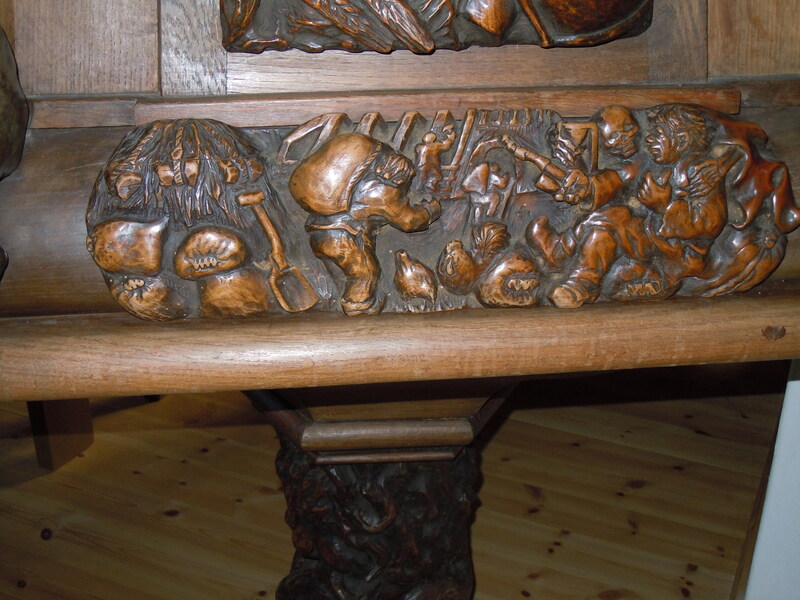 This is just one panel / side of the pulpit showing the detail of the carvings. 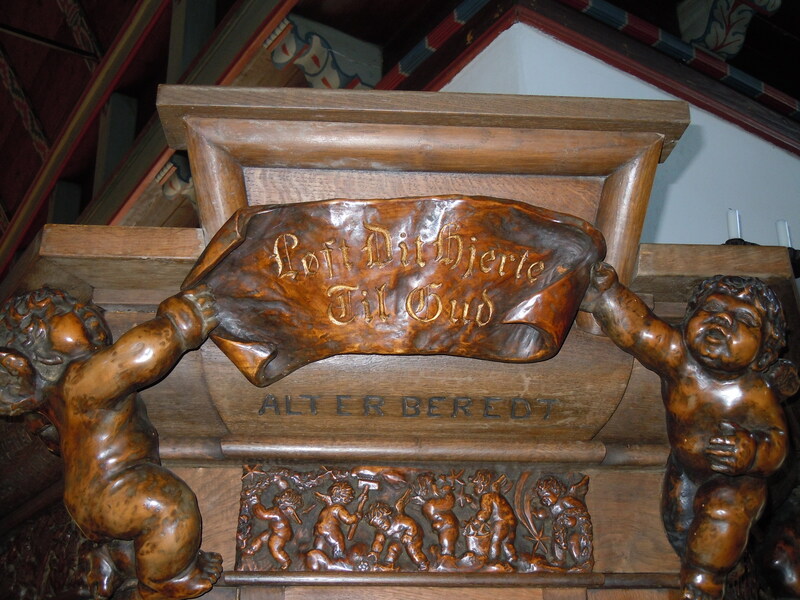 The first (top) has 2 cherubs holding a banner which says “Raise your heart to God” ; the next rectangular panel (middle) shows a farmer with a scythe being invited to come to the church, but he declines ‘as he just have bought an extra field and need to harvest this’, and the last rectangular panel (bottom) shows the farmer with death’s arms around him, to show what happens when he only worked instead of taking time out for God. 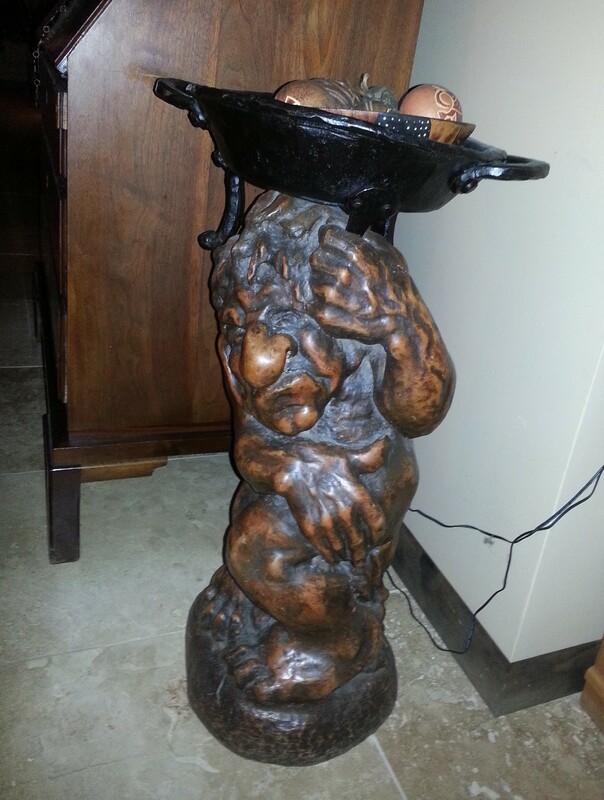 The troll holding the pulpit is very similar to our troll at home (at home he holds a cast iron bowl above his head). 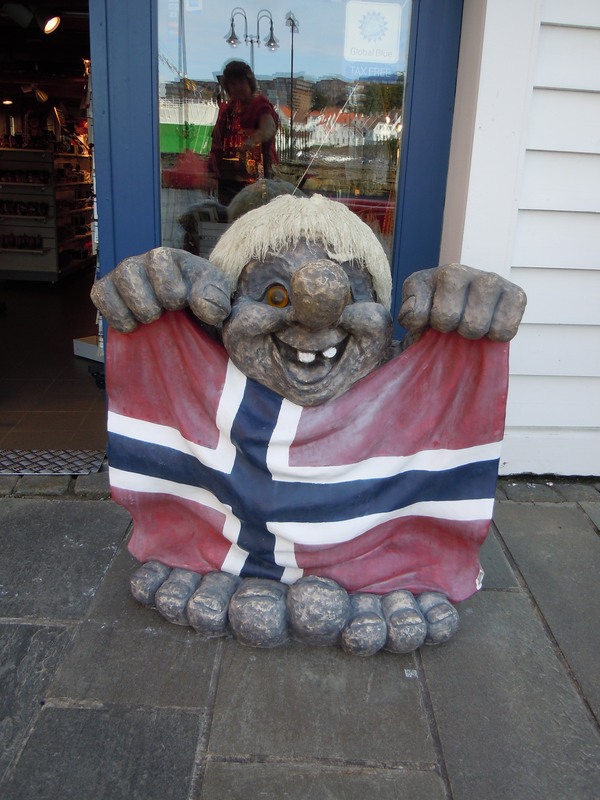 Jennifer says she likes our troll better. 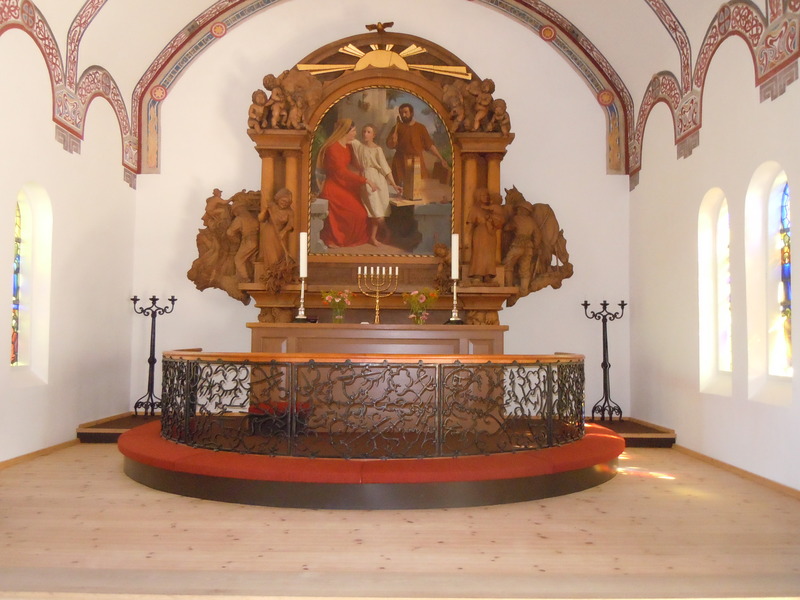 The altar was also made by the same wood carver. 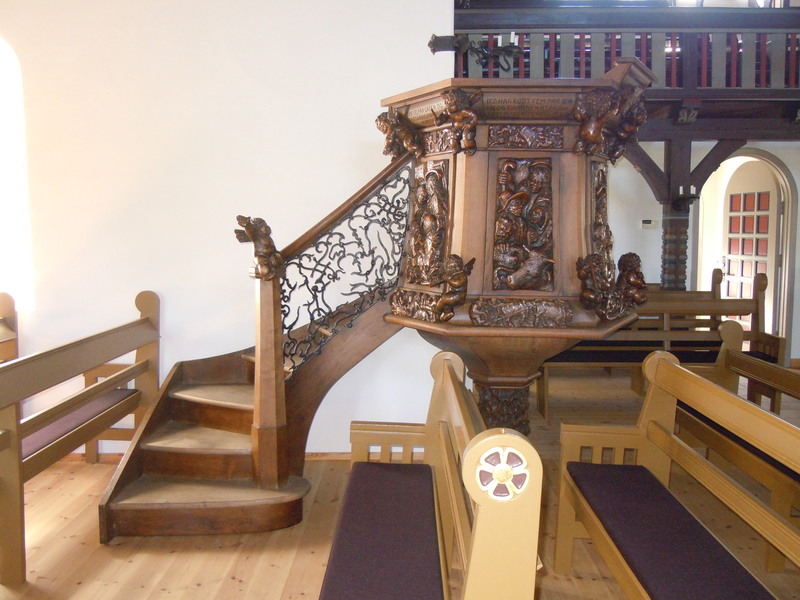 The railing around the altar was made by the same iron worker, and each section again tells a story from the bible. 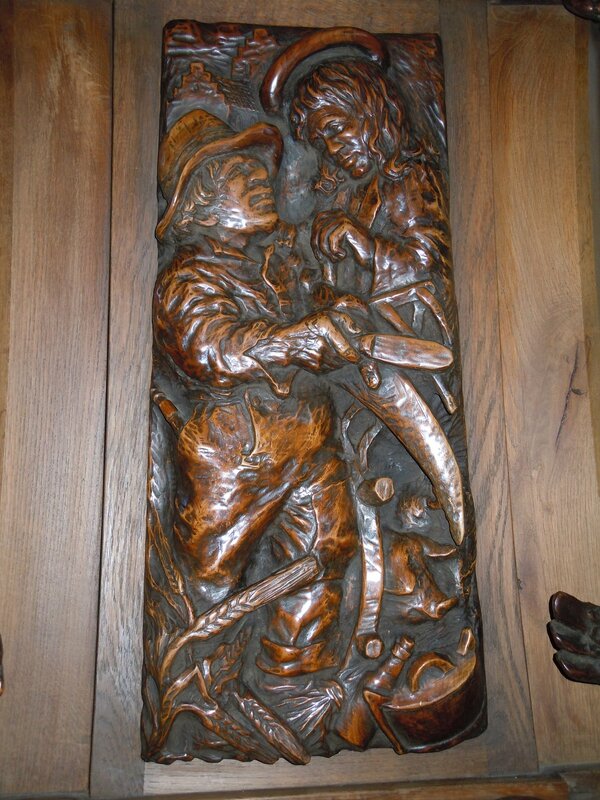 A cabinet that Jennifer and Steen have at home is based on the man plowing in the altar scene (detail on left). 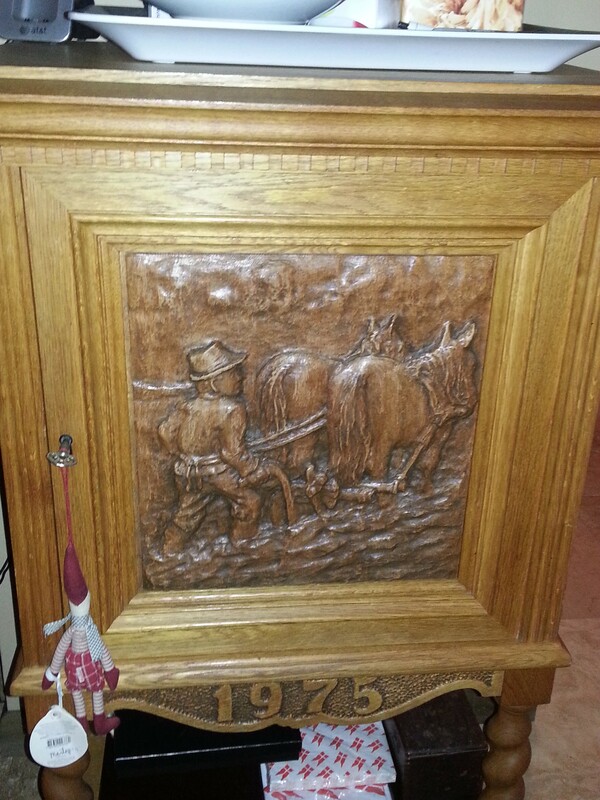 This was the last piece that the carver made and it was commissioned by Steen to show a farmer with his plow and horses. 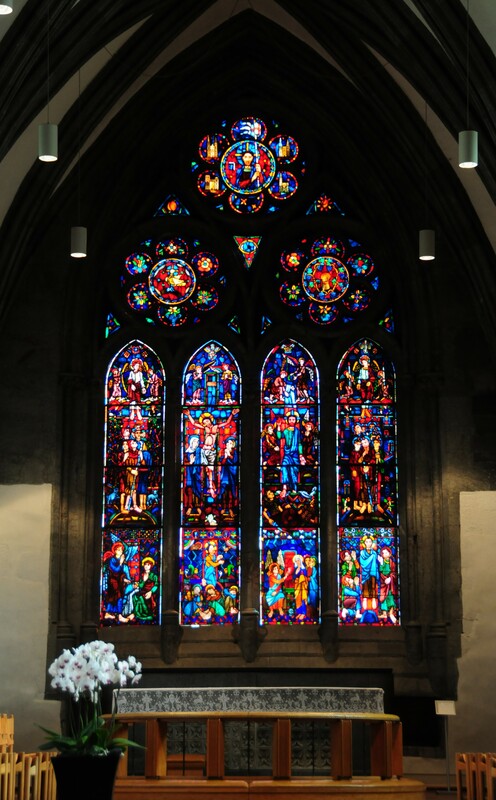 We feel extremely fortunate to have such beautiful works of art in our home, with the very special link to this beautiful church in Denmark. 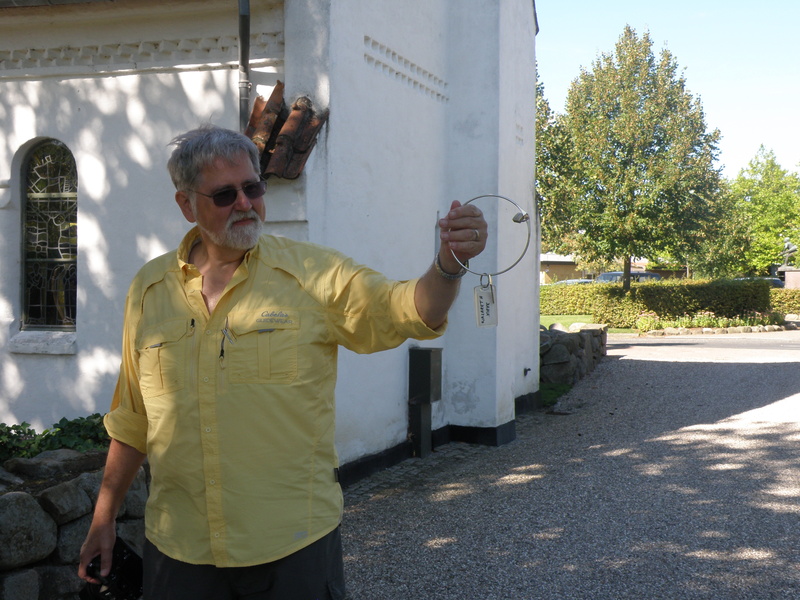 We could not pass the town of Ringe without paying a visit to the home where Steen was born. His father built this house himself and especially liked the yellow bricks because (a) they were unique as not many homes were made of this and (b) they were not as expensive as the red brick. The neighbor in the adjoining house lived alone and Steen’s mother Ella took meals to him and the family looked after him. 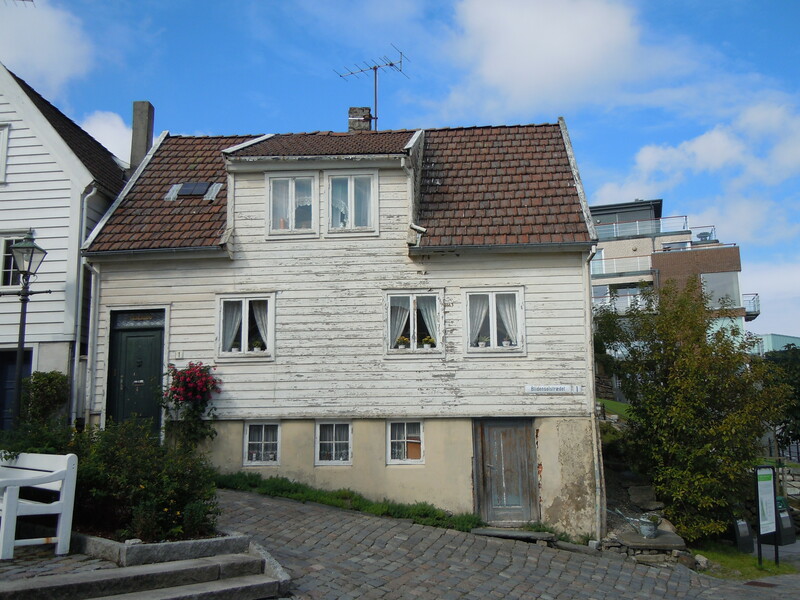 He willed his home to the Jensen family, so the family joined the 2 houses together, and eventually moved into the home on the right. 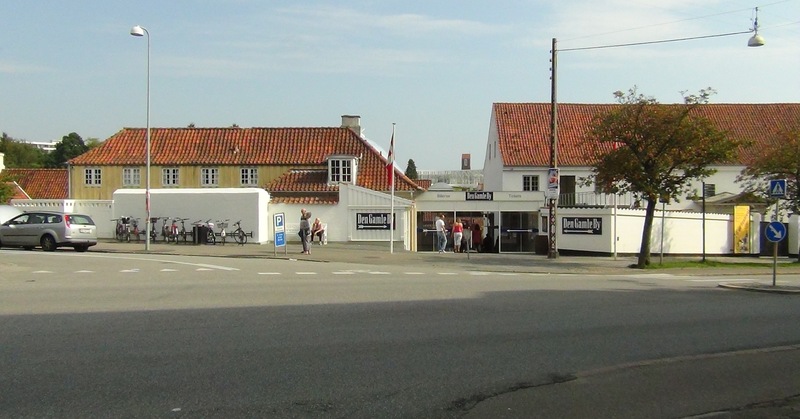 The windows in the front sticking out a bit are where Steen’s father had his hairdressing salon. 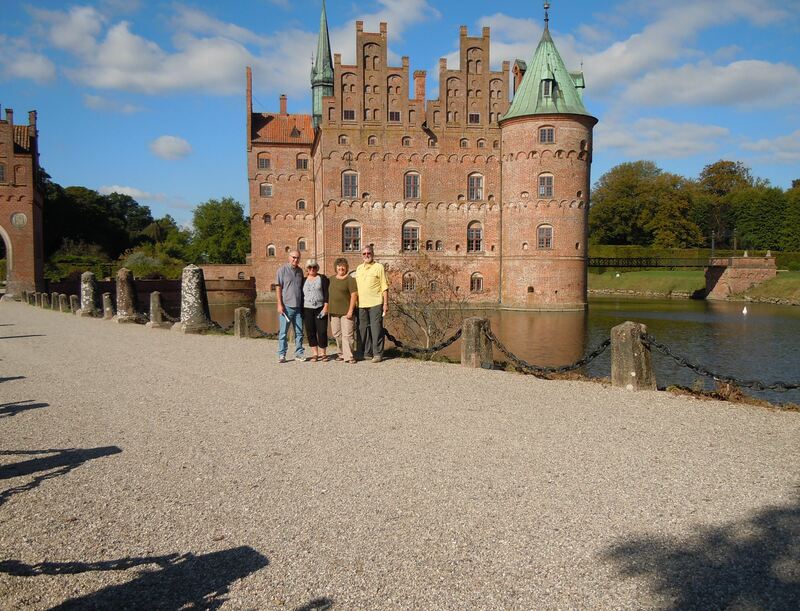 Before long we arrived at one of Jennifer’s favorite castles, Egeskov (meaning “oak wood”). 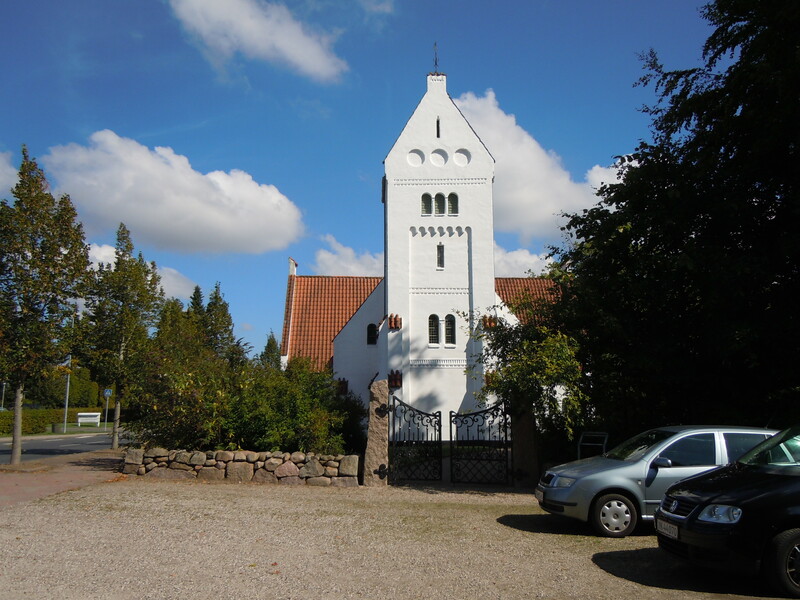 Besides it being a really beautiful castle there are a real Count and Countess living here with their young children. It is fun to imagine that when the last tourist is shooed out at 5 PM, the doors open and the family come out and play in the castle rooms. 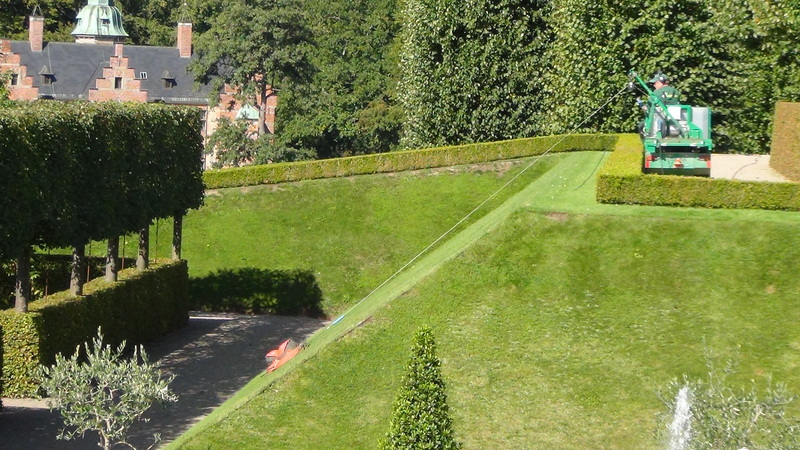 There are also many lovely gardens at Egeskov, but the family has their own private garden so the children don’t have to wait until 5 PM to play outside. With the hour getting late, we hadn’t had lunch and were all a bit hungry. We all ordered tomato and mozzarella salad and then found a seat outdoors. Each individual table and chair grouping is surrounded on 3 sides by hedges. There were peacocks running around, but they must have found some goodies elsewhere because they didn’t bother us when we were eating our delicious, fresh, lunch. We had a very generous serving of bread which made Tim (and all) very happy. Because we had arrived a bit late in the day, we didn’t have time to linger during our tour of the castle, but we did manage to see all of the public rooms: The Hunt Room (the skins of many wild animals [lion, tiger, leopard, cheetah] and the heads of large game [African buffalo, impala] hang as well as many smaller trophies of antlers) ; The Yellow Room (it probably has another name, but it is primarily yellow, with light furniture, and a beautiful porcelain fireplace) ; The Victorian Room, The Red Room (again, not the ‘real’ name, but you get a mental picture…this room had a lovely chamber pot which matched all of the linens in the room), and the Knight’s Room (the one with the large paintings with eyes that follow as you walk across the room…ask Amy about that). In an effort to reduce the (already high) number of photos in this post, I won’t share photos of these rooms, but they are beautiful. If we have enough requests from our readers, then we can make a separate post just to show more of the castle and gardens. 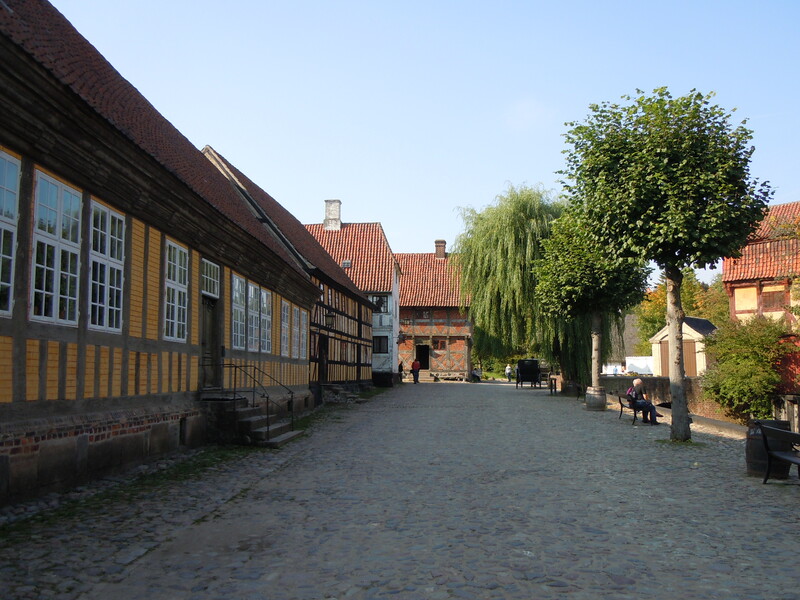 One of the more remarkable things to see while at Egeskov is Titania’s Palace. 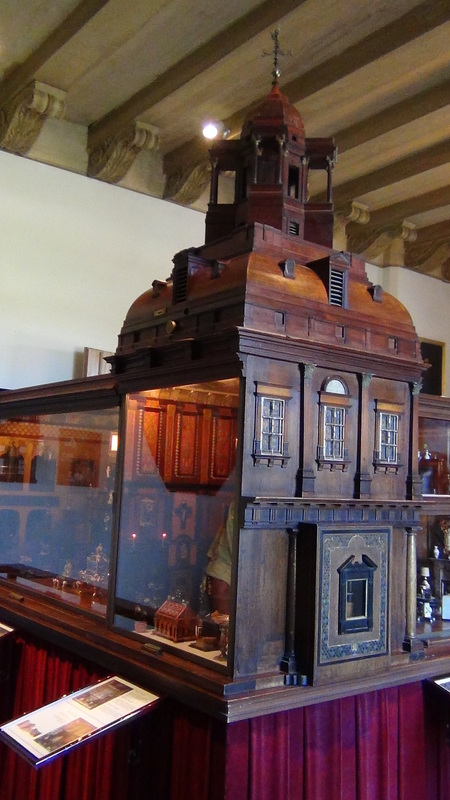 It is a very large (if not world’s largest), and finest, dollhouse. A young girl named Gwendolyn was convinced that she saw a fairy in the garden and was very concerned that the fairies had to live in holes in the ground. She asked her father, a painter, to build them a fine house. It took him 15 years, a bunch of Irish craftsmen, and over 3000 components to build Titania’s Palace. 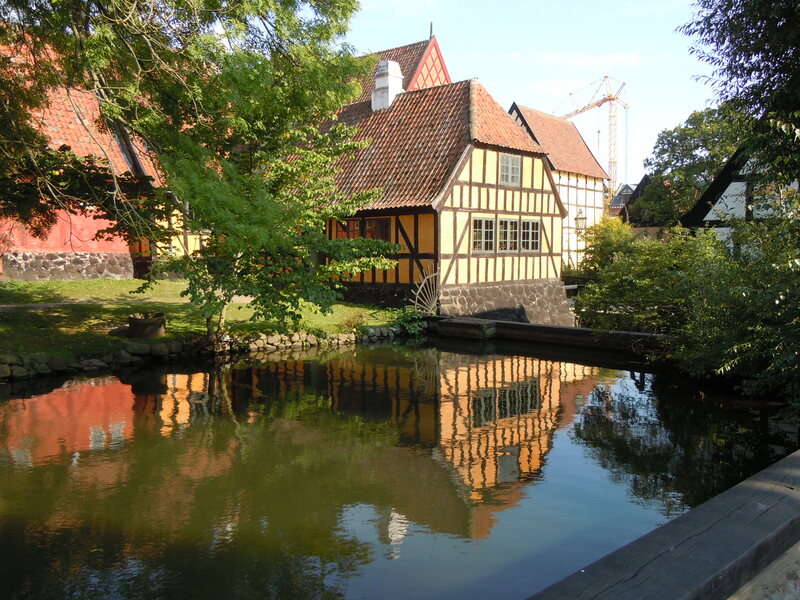 It is now owned by Legoland and used to be displayed there, but since 2007 the Count made a loan agreement with Lego to have it displayed at Egeskov. 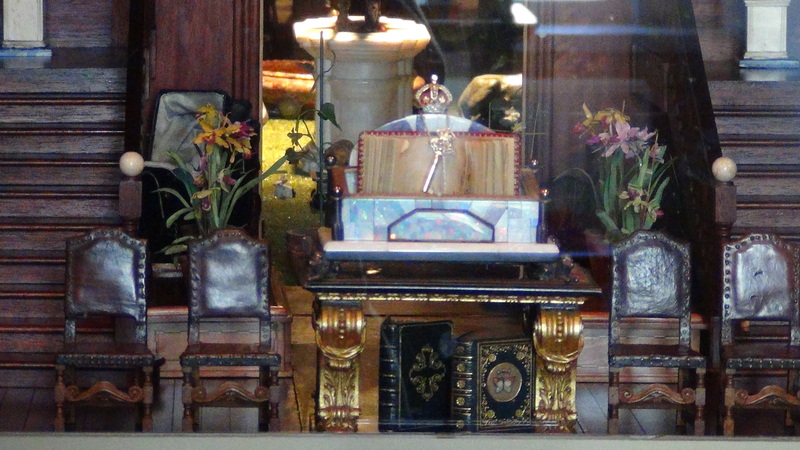 Here is one example of the detail of the many items inside the dollhouse. 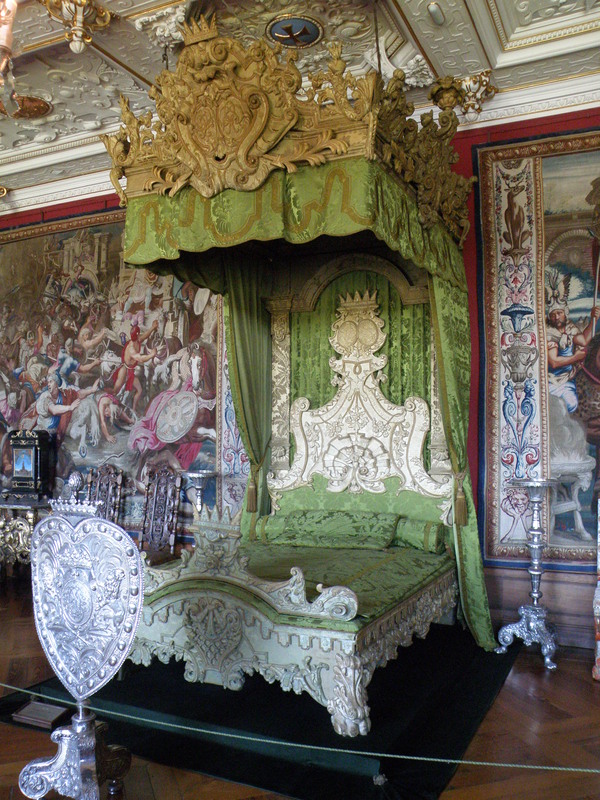 The china and crystal are real, there is a peacock made of diamonds, the furniture is made of mahogany, etc. The book holder in this photo is made of real opal. Notice the crown on top which has real gem stones, and the key hanging from that is also made with authentic sparkly things. Really amazing to see, but we had to move on. 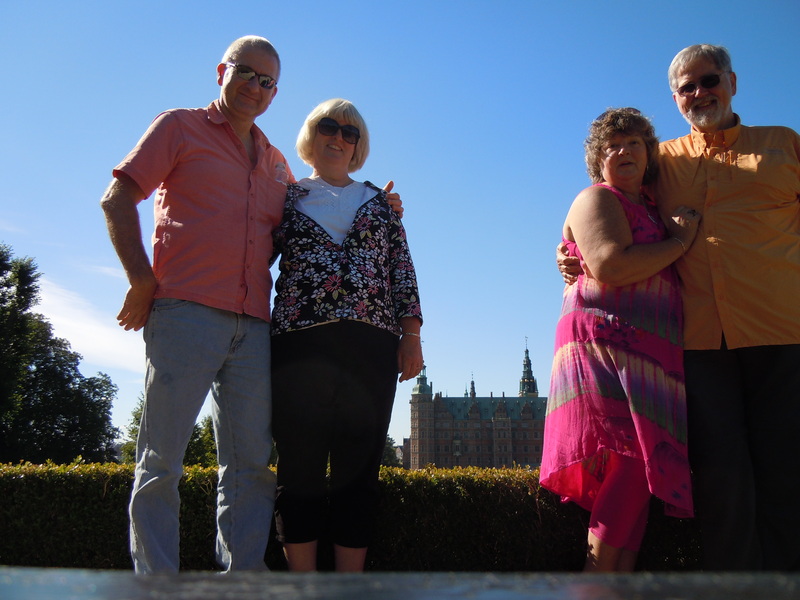 Since we skimped a bit on the photos inside the palace and around the gardens, we figured we better throw in a selfie of the group in front of the castle to prove we were really there. 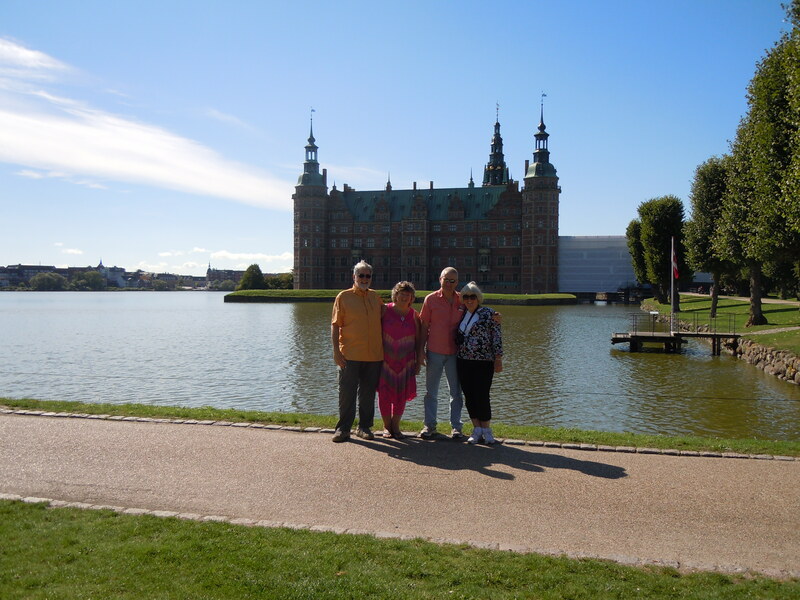 After a quick stop at the local grocery store in Middelfart, we finally arrived at our Feriebyen (vacation city) where we will stay for several nights. In one unit (think ‘bungalow’) there are 2 separate bedrooms and 2 full baths as well as a full kitchen, dining table and living area. 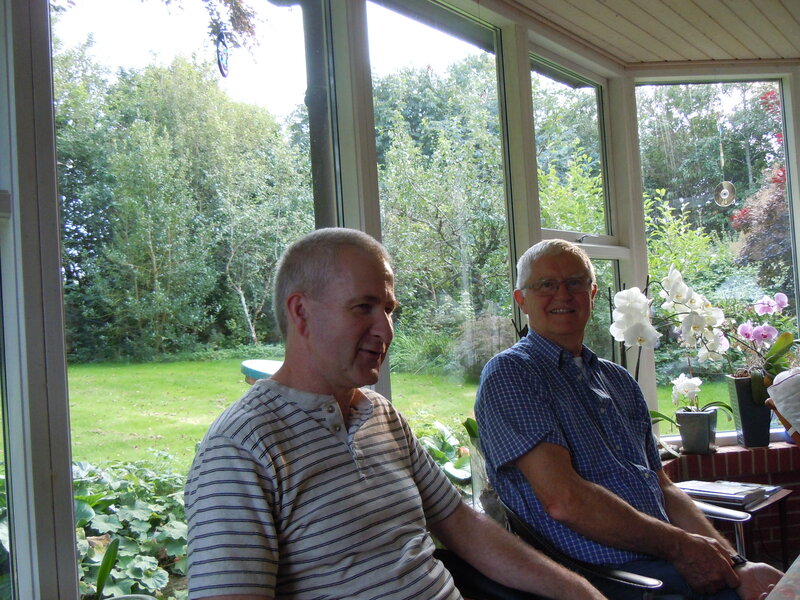 We rested for about 30 minutes and then drove 5 minutes to the home of Steen’s nephew Lars, and his wife Berit, with whom we were invited to have dinner. We had a fantastic dinner which started with venison carpaccio, then the main course of pighvar (turbot) and salmon, with new potatoes and parsley cream sauce, and cooked carrots (the whole carrot). The evening was topped off with a dessert of Danish vanilla ice cream (so creamy!) and aeblekage (yet another delicious variation of this Danish specialty). We really wished that we could have stayed longer, but we have an early, and long, day planned tomorrow, so we said our adieu’s and drove 5 minutes back to our bungalow and fell into the arms of Morpheus. 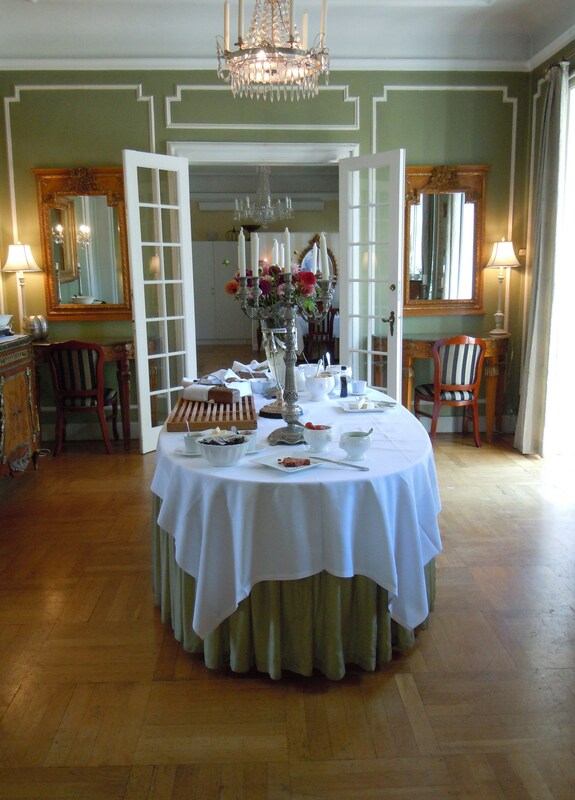 Day 4 began with a very nice breakfast buffet in Sauntehus manor house. Jennifer and Tim were the happiest of the group for the scrambled eggs and crispy bacon. Tim’s happiness level dropped slightly when he found some strange things baked into the bread (carrot? In bread?). 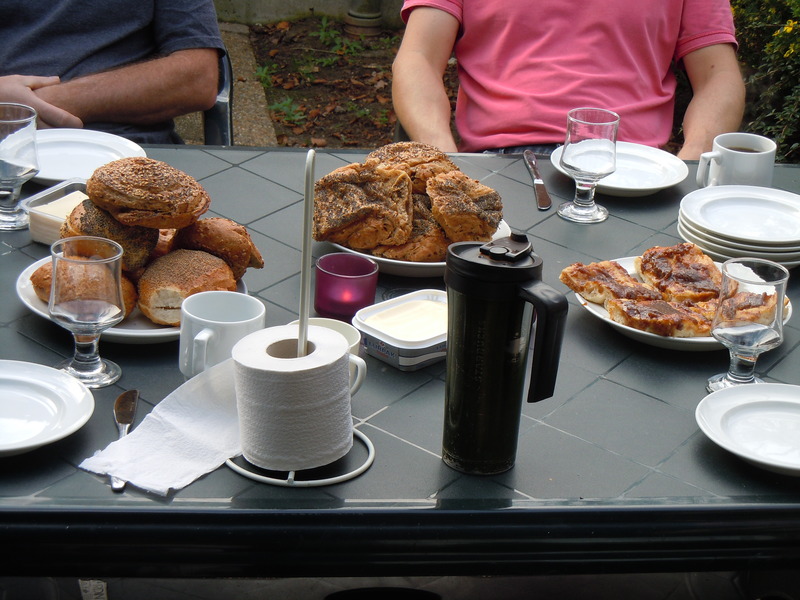 For the first couple of days we had a continental breakfast, although there were no complaints over that, due to the delicious bread and pastry served. After all were satisfied with breakfast we packed the car and then took a brief tour of the ‘back yard’ of the manor house. What a wonderful terrace for a party! 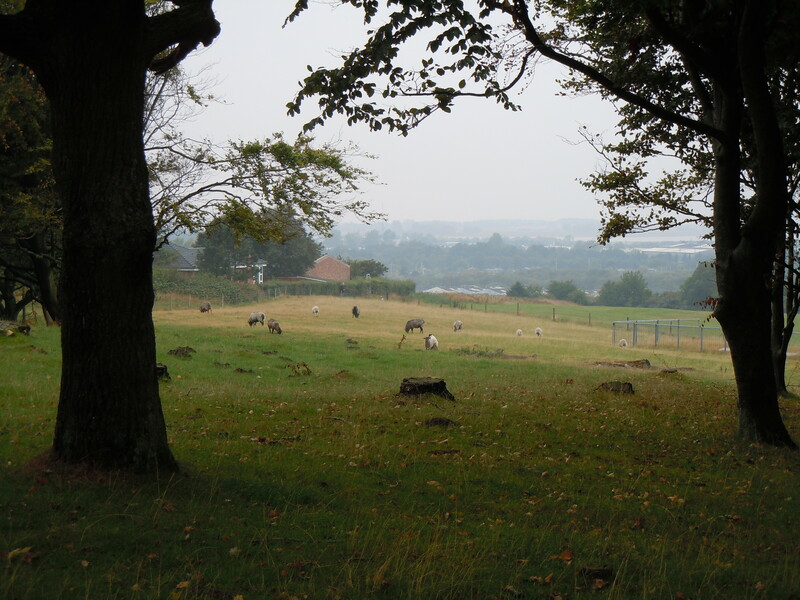 The view from here is a grassy hill and then trees. Then we were ready to set out for the day’s adventure. During the drive we passed these 2 sheep, which apparently both had an itch they needed to scratch. 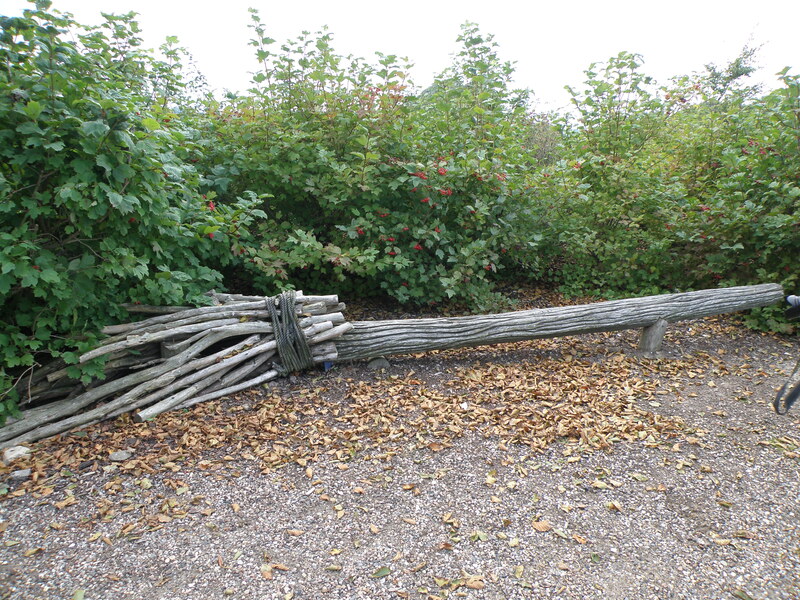 Fortunately they had this fallen branch…and each other…to take care of that. 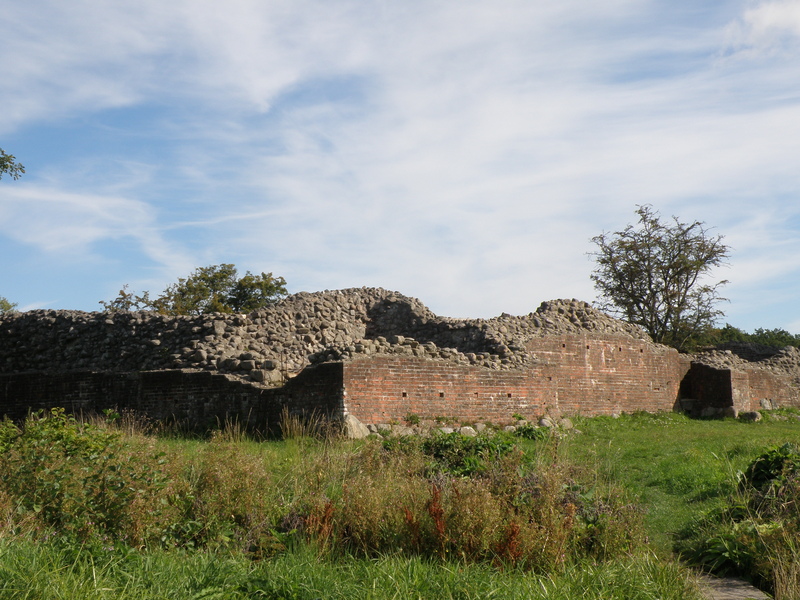 The first planned stop was the Gurre castle ruin. 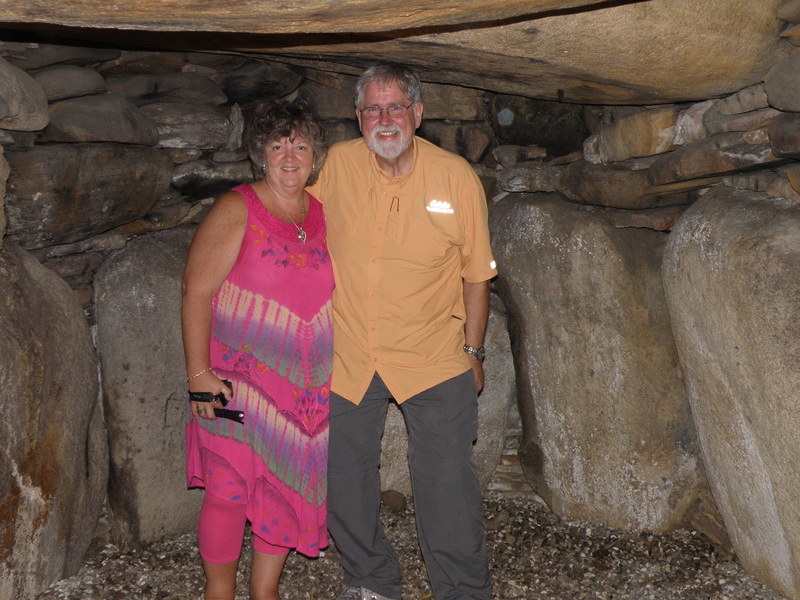 We climbed around a bit in and on the 12th century ruin and tried to absorb the history of the place. The legend is that King Valdemar was cursed to ride the wild ride on his horse at night, for all eternity, due to his statement that “God, You can keep your Paradise as long as I can keep Gurre”. For this reason we always make sure to visit the ruin during the daylight hours. 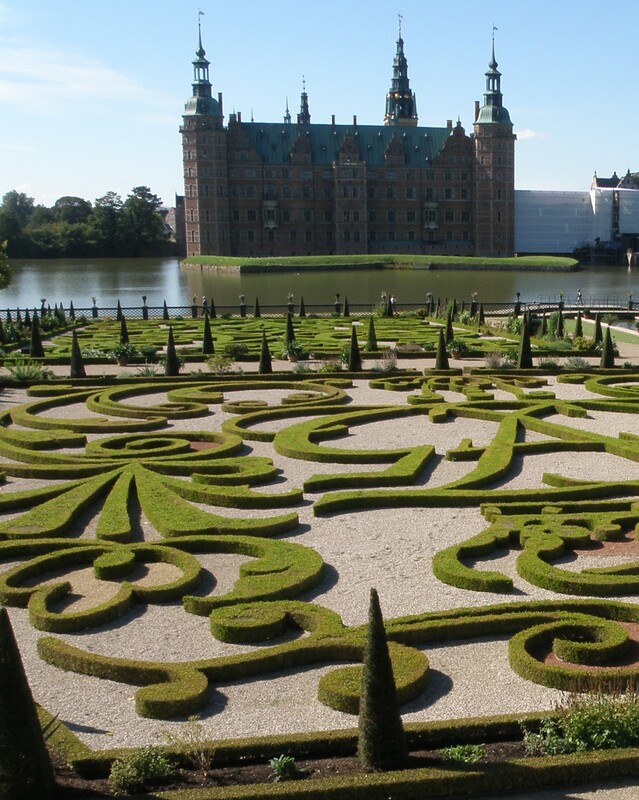 The main objective this day was to visit the Frederiksborg “Slot” (Castle) baroque gardens and castle. This Renaissance castle, built by King Christian IV in the early 17th century, is, according to Steen, one of the most beautiful castles he has ever seen…and he has seen a lot of castles all throughout Europe. Although Jennifer has not seen as many castles as Steen (but they are working on that), she agrees that this is a very, very beautiful castle, both inside and out. 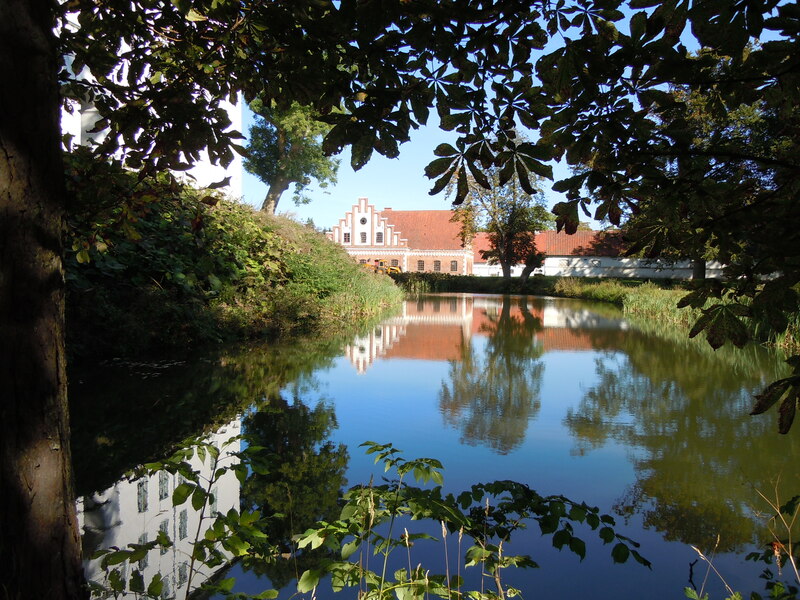 The baroque garden is extremely well maintained and there are many fountains and reflecting pools, with the castle as centerpiece. The lawn was being mowed while we were touring the garden and we all saw something that none of us had ever seen before…a man sat in a lawnmower type machine at the top of the steep grassy hill and the mower was on a line that was sent down mechanically, brought up and then sent down again and up and so on. There was another guy with a weedwacker, but that was not so interesting. 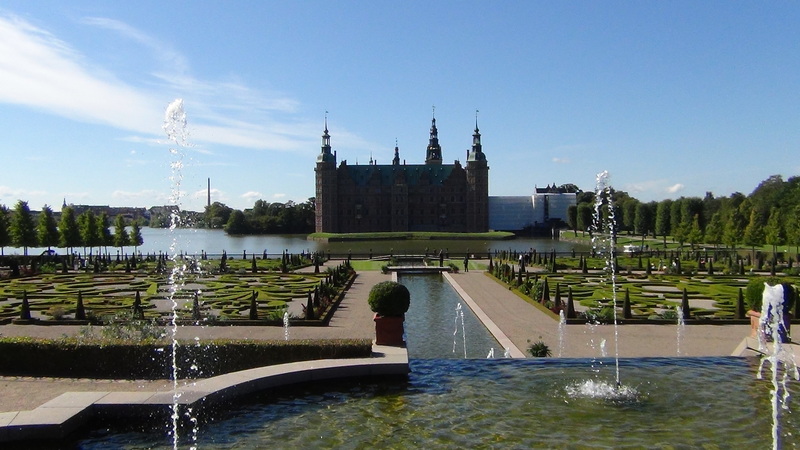 In the garden area nearest the castle there are 4 blocks of ornamental gardens, each designed with the Kings and Queens of Denmark in mind. Above the initials and number (e.g. F4 for King Frederik the IV) there is a crown of hedges. 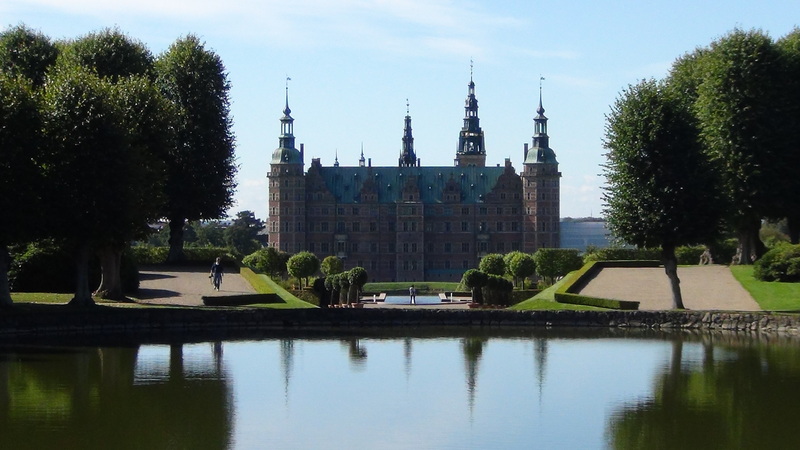 In addition to the current Queen of Denmark (Margrethe II) the other royals to have the honor of a square in this garden are King Frederik V and our personal favorite, King Christian IV who built or expanded upon, many of the castles in Denmark. We had a little fun with the self-timer on the camera. While it seemed like a good idea to take our photo with the castle in the (distant) background, the end result is that we appear as giants. To have the right perspective, we asked someone to take our photo in front of the castle where we are now back to normal size. 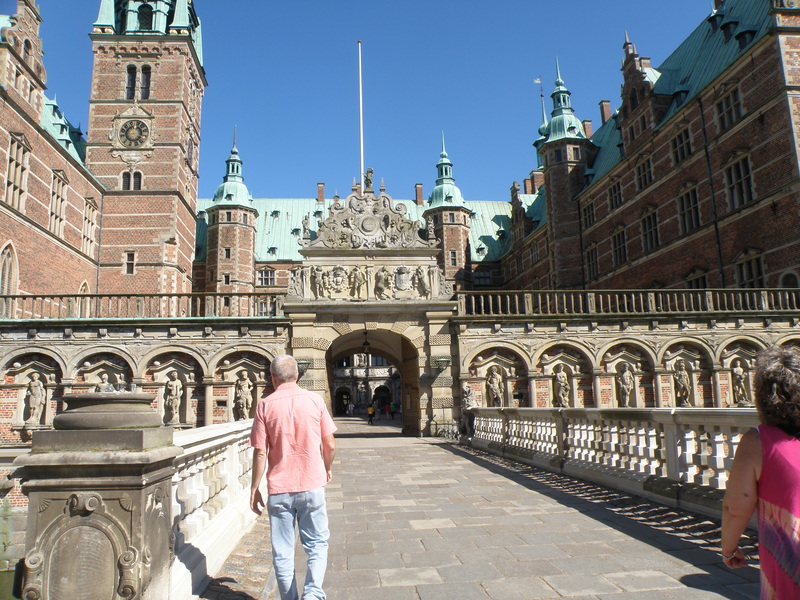 We crossed the moat and entered the castle through the courtyard in order to take a tour of the castle. 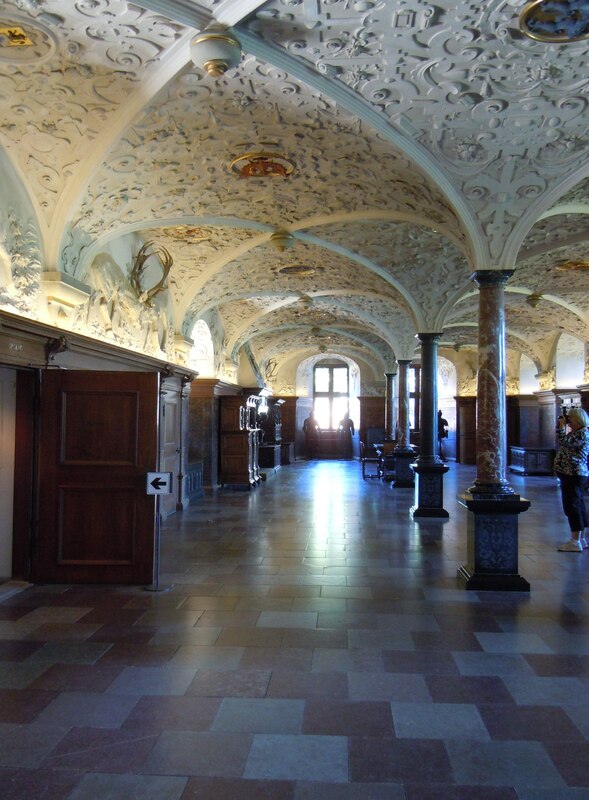 One of the first rooms you enter on the castle tour is The Rose (“Rosen”), named because of the rose reliefs on the ceiling and also the rose colored marble on the floor and columns. 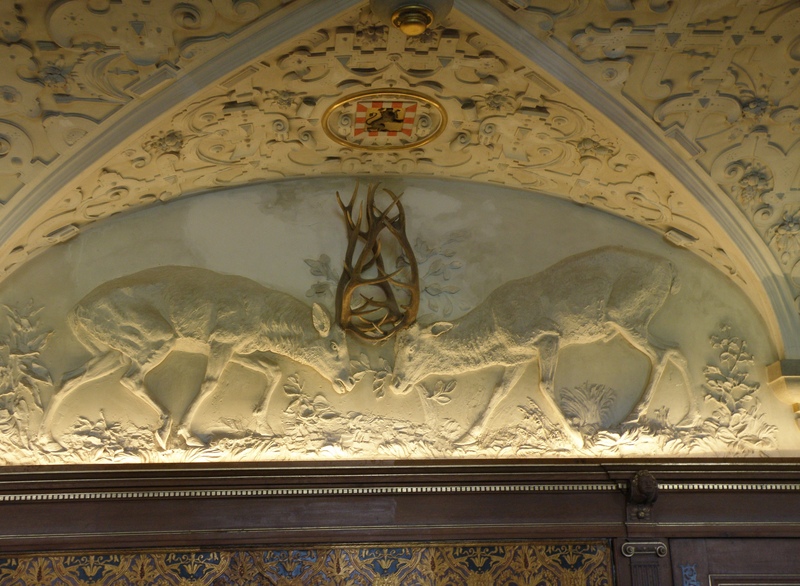 Another unique feature of this room is the reliefs of Danish deers. While the relief is made of plaster, the antlers are real. 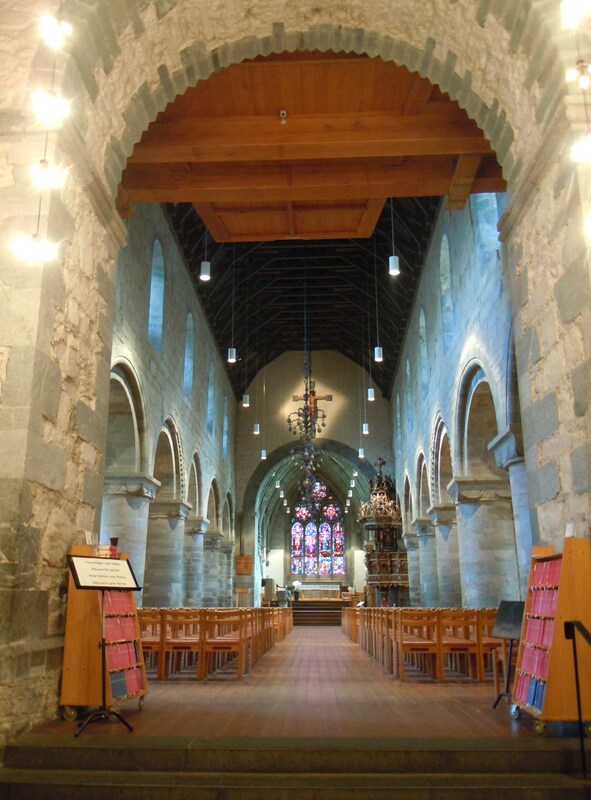 The castle church was built around 1600 and is really spectacular. Services and weddings are still held here. 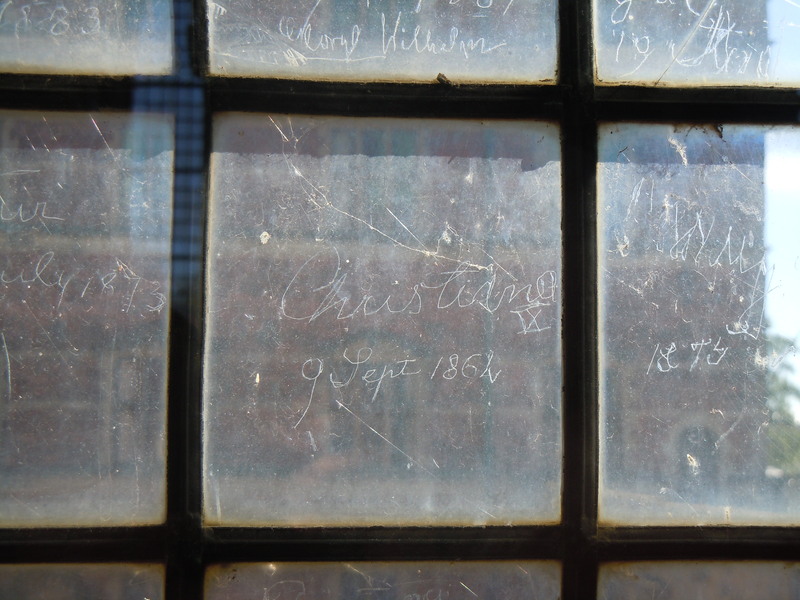 There are etchings in the old glass windows that are allegedly those of kings. This one is by Christian IX in 1862. Continuing on our tour we came to the Great Hall where the King would have feasts and dancing. 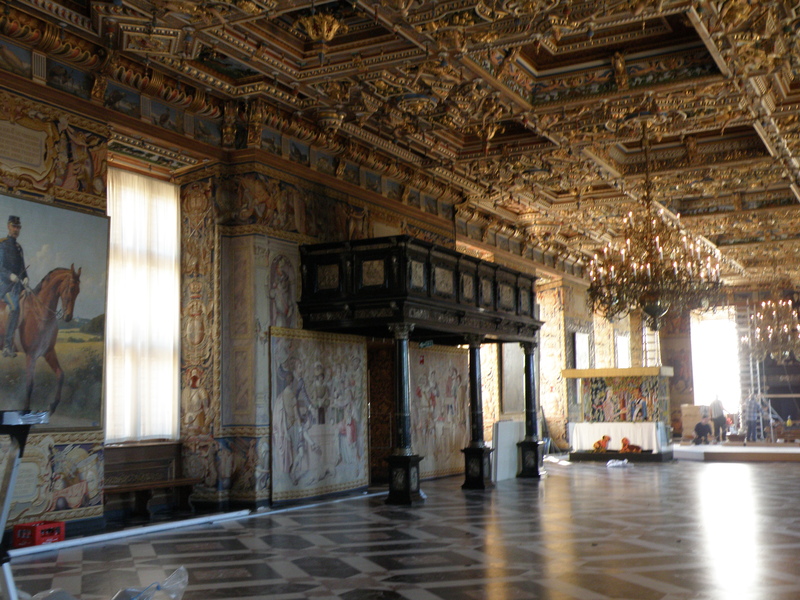 There was some construction going on but the grandeur of this room was obvious. There were some magnificent portraits of the current royal family. 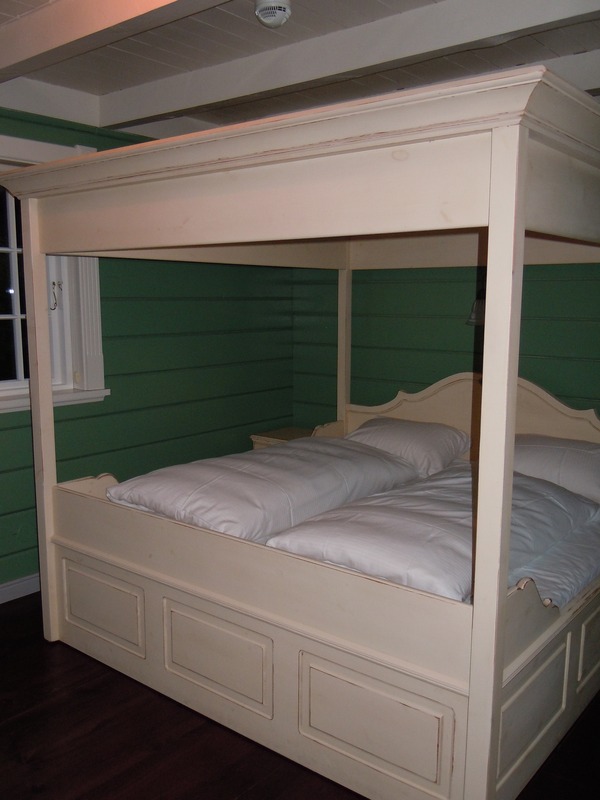 Amy and Jennifer were really impressed with the King’s bed, but the boys were not as impressed. We finished the castle tour just as the castle was ready to close. Since we would be driving again the girls decided to utilize the facilities one more time. There was a lovely statue outside each restroom to help you figure out which one to use. Apparently people could not keep their dirty hands off. Busted! 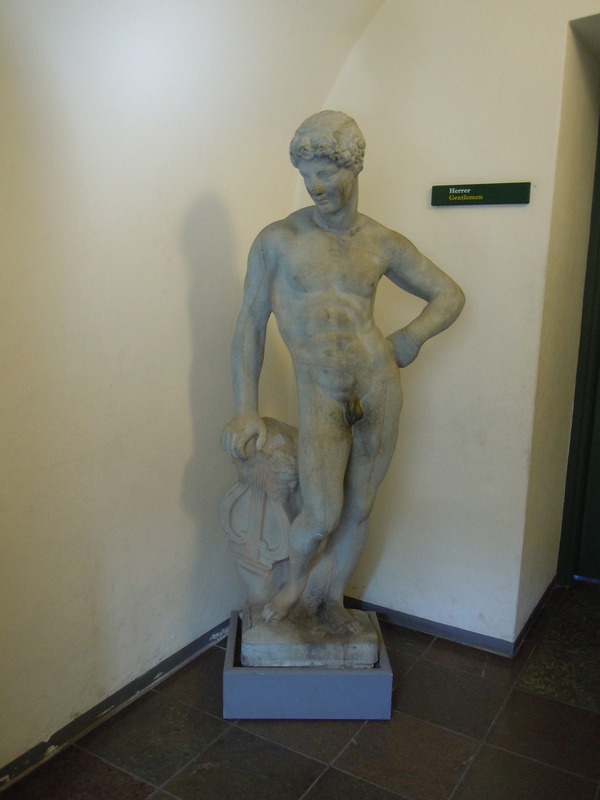 We hadn’t noticed the male statue in our haste to get to the ladies. So when we were walking past we checked him out, and yup! Same problem. Then we wondered…is it the boys touching the girls, and girls touching the boys…or…? Hmmmm. 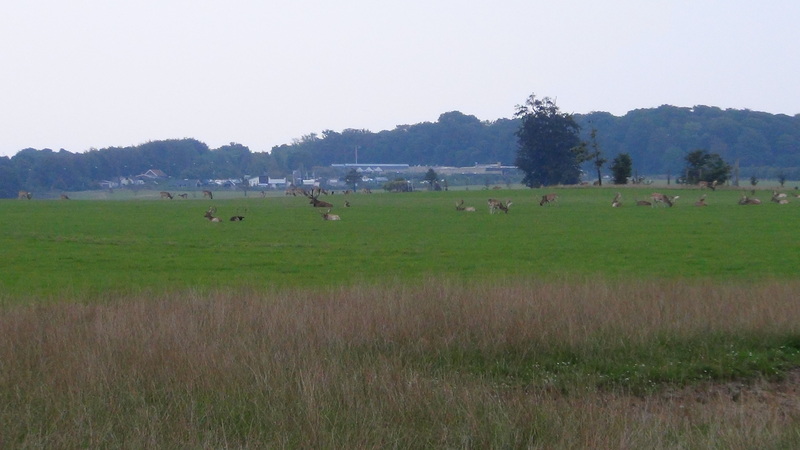 While we’re on naughty topics…we passed by this lovely scene on our way back to the car. Steen has always told Jennifer the story of a second castle on the grounds. It was originally built for use as a bath house but later when the King took a mistress, he had her stay there. Very convenient. 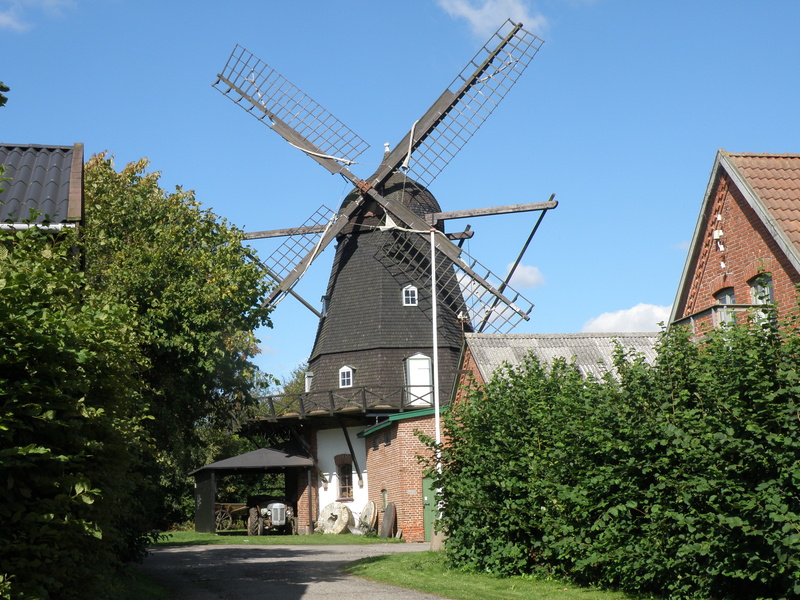 On the drive to Roskilde to see the cathedral and visit the Viking Ship Museum (Vikingeskibene) we passed one of our first old windmills. 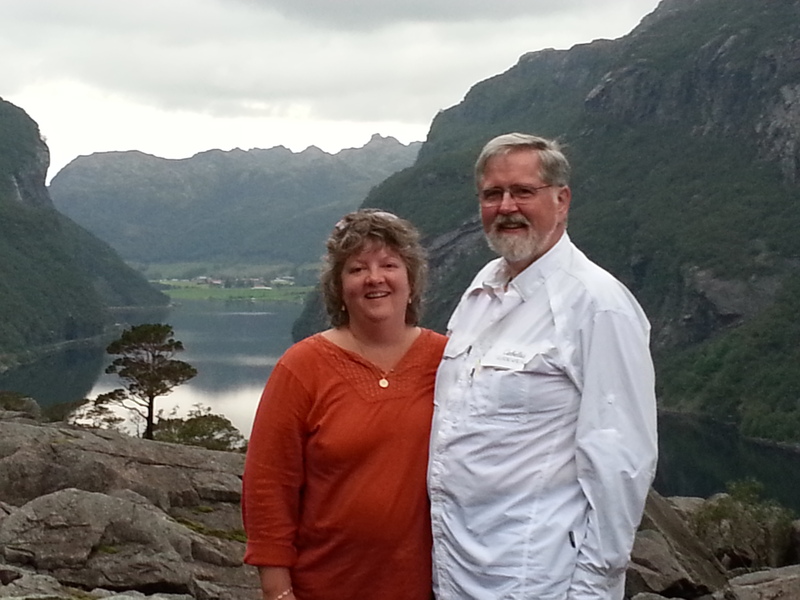 Steen made a small detour so that we could get a good view (and photo). 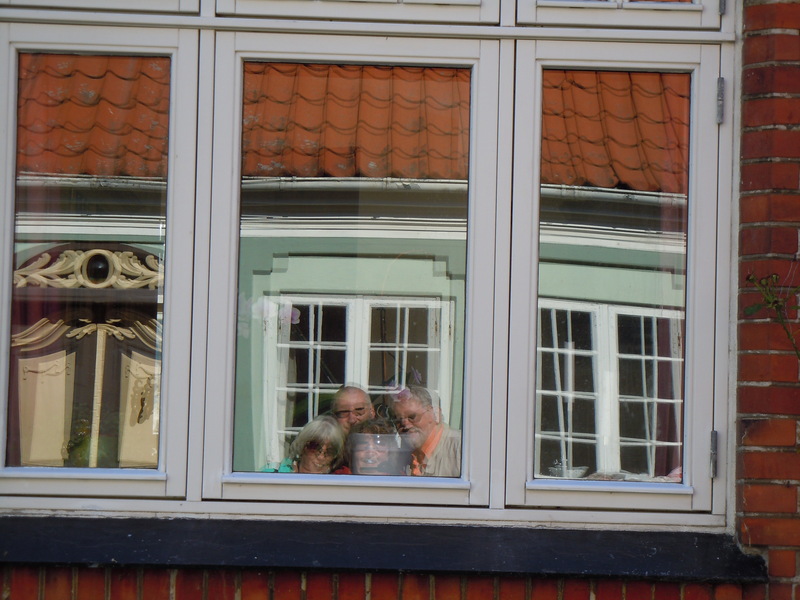 With all of the wonderful and interesting things we saw this day we arrived rather late in Roskilde. We wanted to have lunch next to the Vikingeskibene but we were having dinner in a castle later and didn’t want to ruin our appetites. 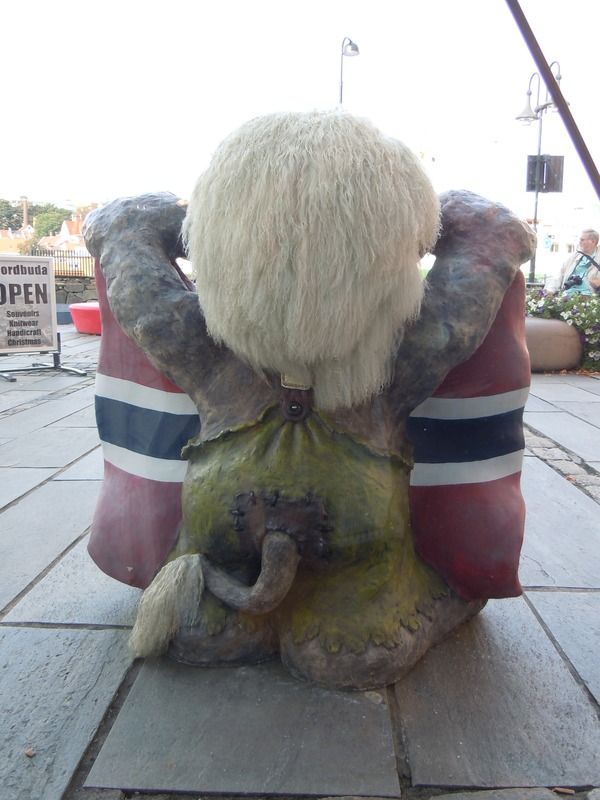 Instead we had the Aeblekage (like the one we had in Tivoli on Day 2, only better). 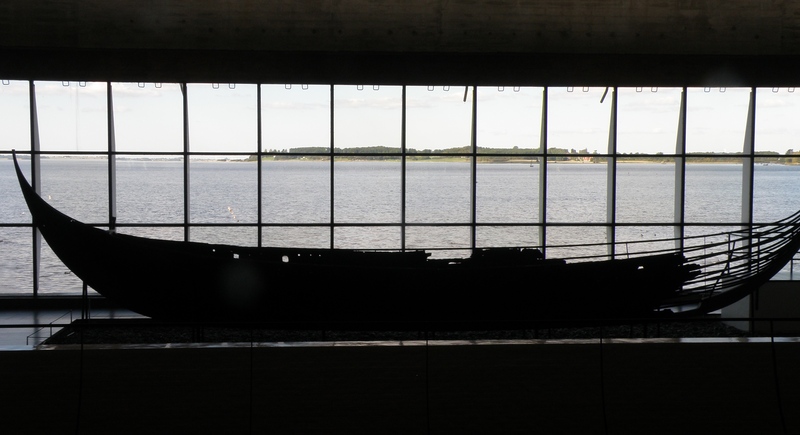 We therefore were late getting to the museum and they were closing, but the nice lady selling tickets said she would not see us if we walked to the rail to get a look at the ships that were excavated from the bottom or the fjord seen through the window. This is what is left of a real Viking ship! There are several more in the museum, but we will have to look at them next time. 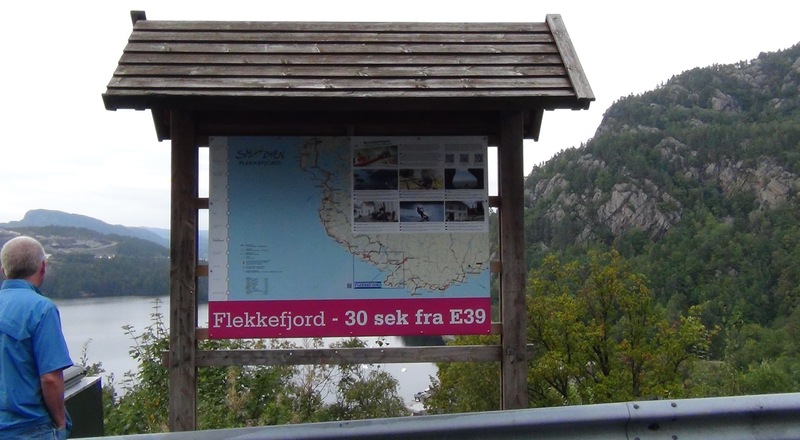 The next stop was at a place called “Jaettestue”. 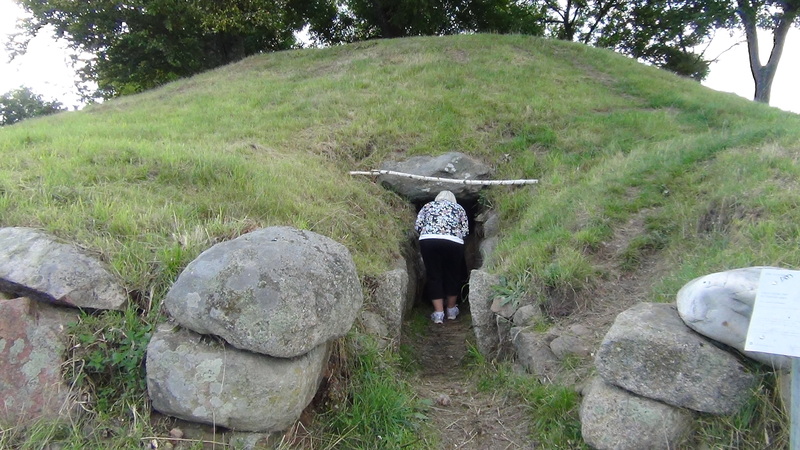 This is a 7,000 year old burial mound that you can actually go inside. 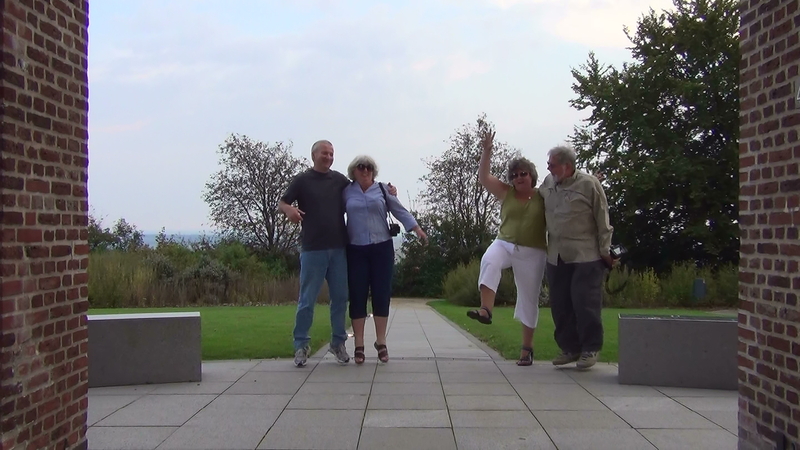 After several failed attempts with the self-timer due to difficulty finding a flat surface large enough to set the camera on, we gave up and took separate photos. 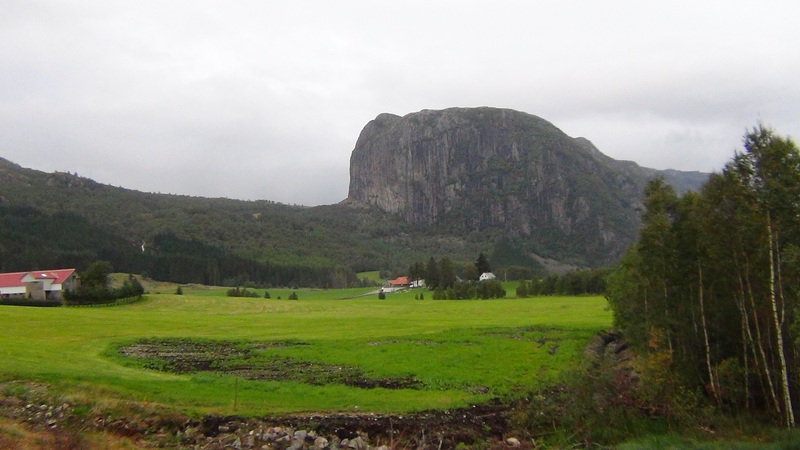 After you admire our lovely personas, take note of the huge rocks that make up the walls and ceiling of the Jaettestue, and imagine that this was made in the Stone Age. Wow! 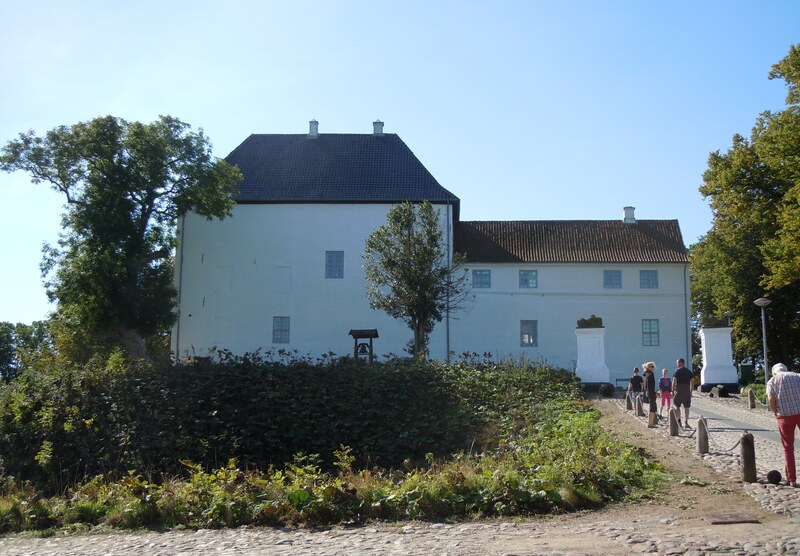 After a long drive, and a day full of new impressions, we were all happy to see our castle where we would spend the night, Dragsholm. 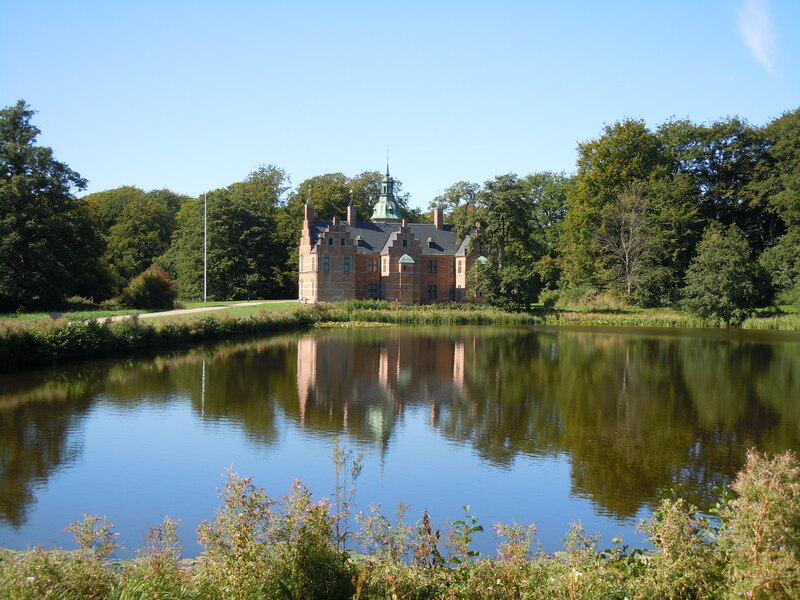 The original castle was built around 1215 by the Bishop of Roskilde. 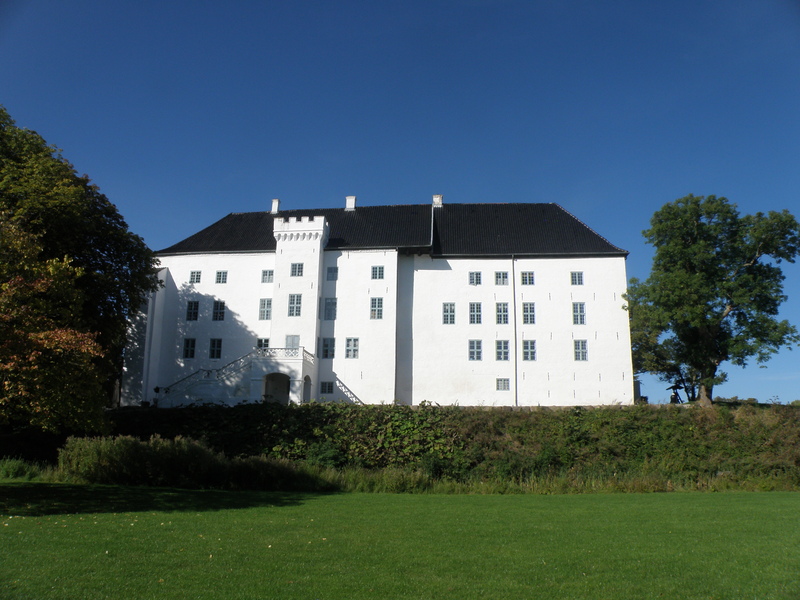 But the current baroque castle we see today was rebuilt in the late 1600’s. Each of our assigned rooms was unique, but both of them were really lovely. 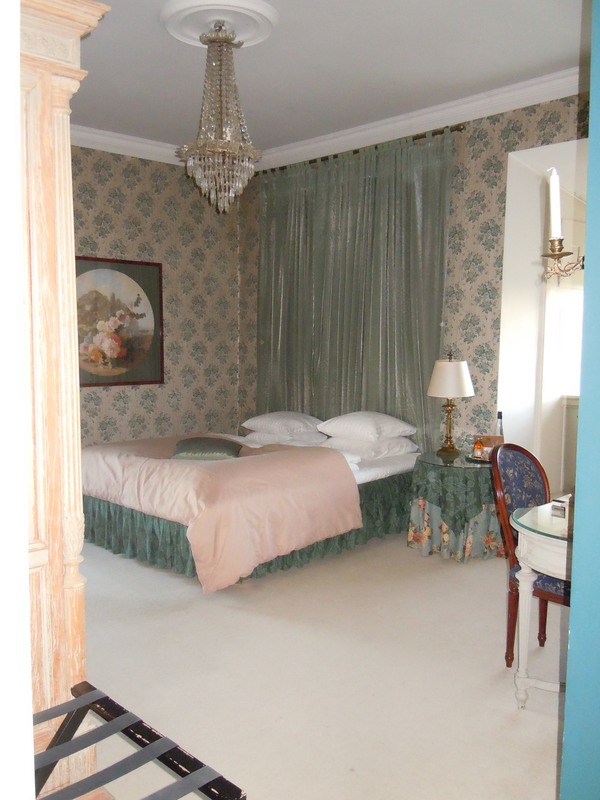 This is Jennifer and Steen’s room which looked out over the castle’s vegetable garden and then out to the distant fields. Amy and Tim’s room overlooked the side entrance and moat. They had to walk through a sort of tunnel to get to the bathroom because the castle walls are so thick. 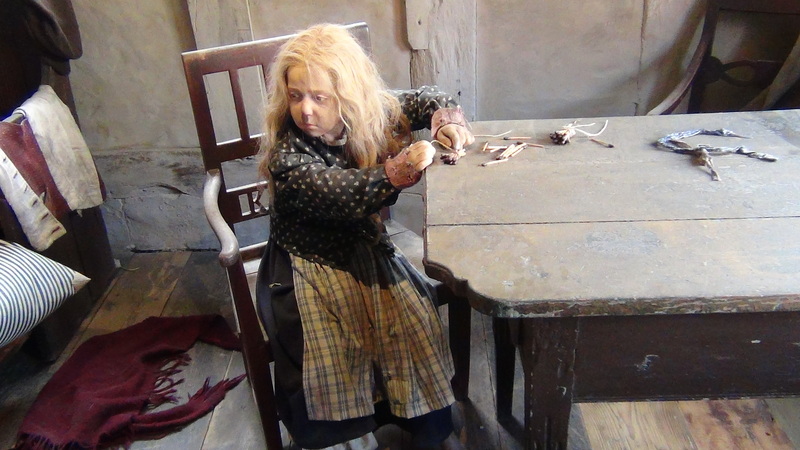 Although there are said to be 3 ghosts in the castle, we didn’t have the luck to meet any of them this time. 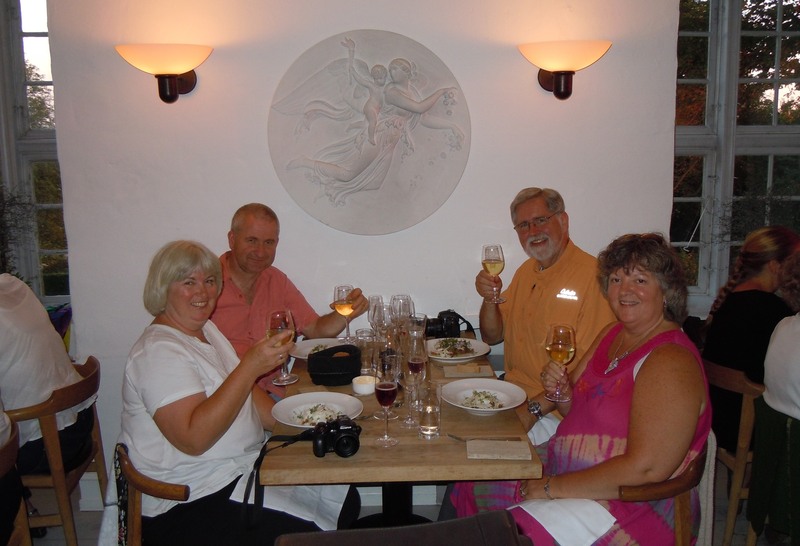 We enjoyed a wonderful 3 course dinner, with wine pairing, in the castle restaurant. 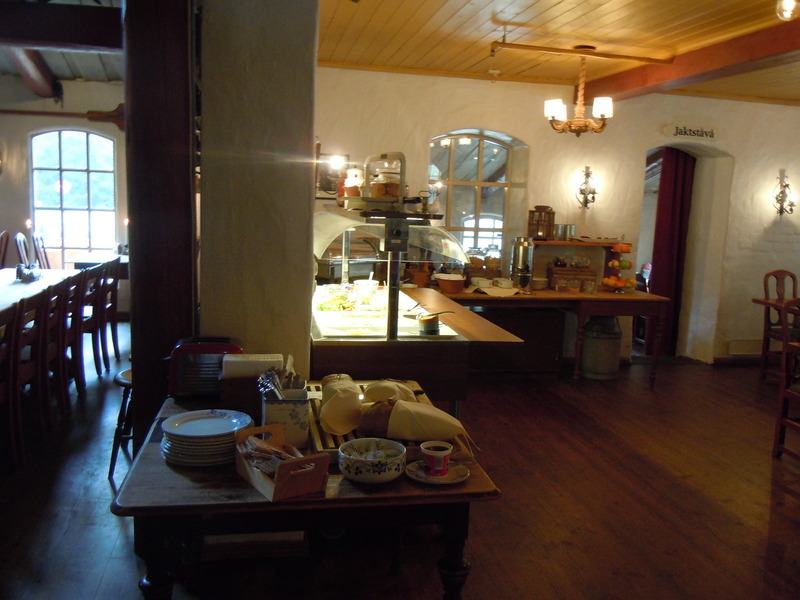 There is another restaurant in the bottom of the castle that has won a 2nd place (in the world) award for the restaurant using fresh, local ingredients. We didn’t have to go far to enjoy a beautiful, colorful sunset which topped off a wonderful day.